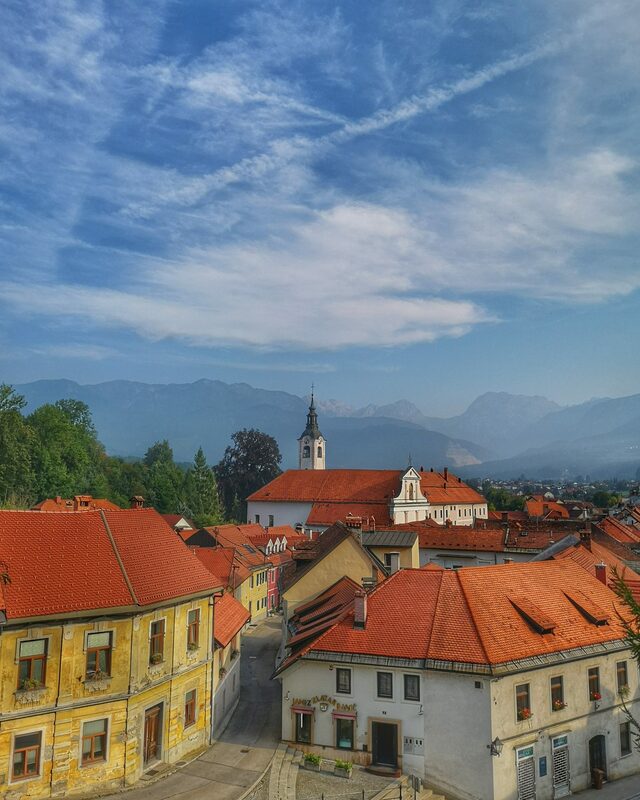 Kamnik is a small picturesque medieval town along the Kamniška Bistrica river underneath the Kamnik Savinja Alps. 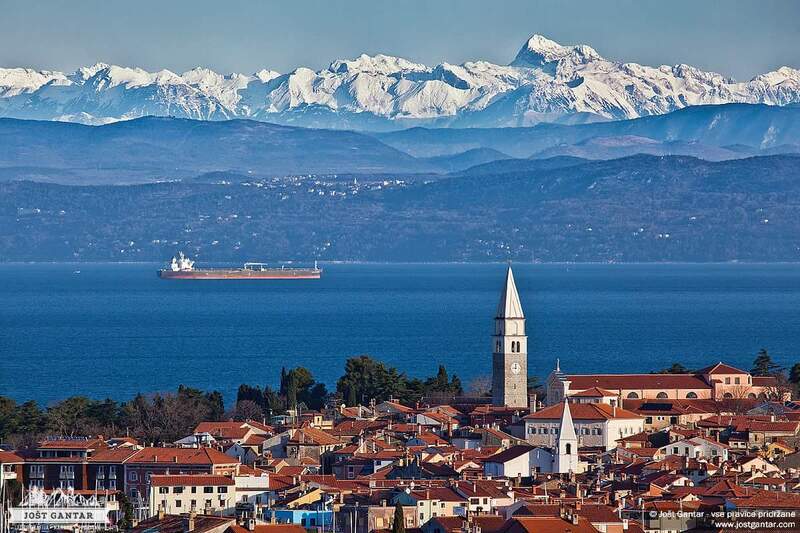 Its heyday was in the Middle Ages, when it was the capital of Carniola. Nowadays only a small old centre of the town reminds of the days of its glory. Luckily this small town is worth visiting by itself since if offers many opportunities for a good photo without any heavy equipment needed. 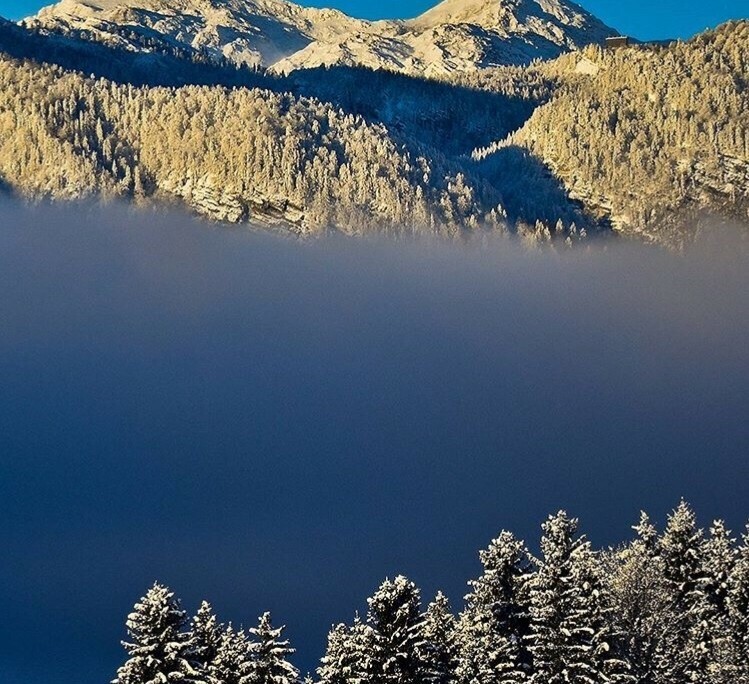 The second factor of luck is its position close to the mountains which always attract visitors. 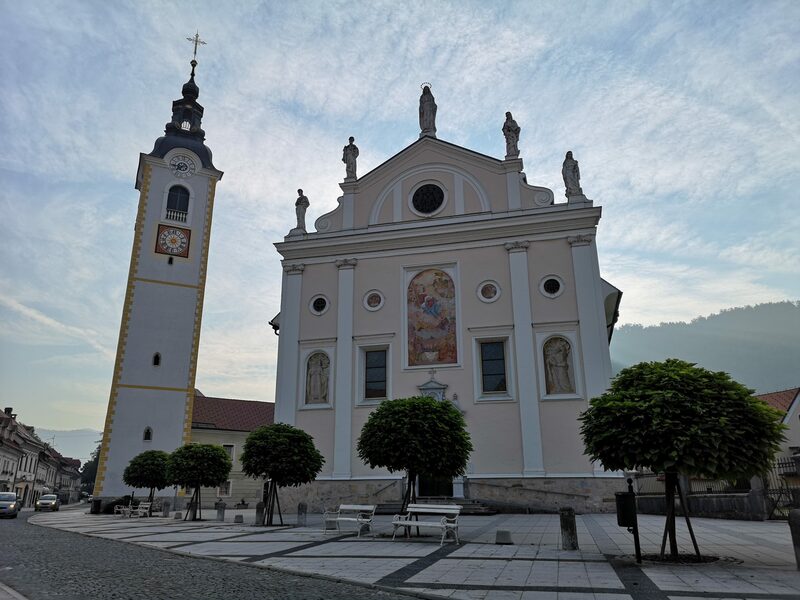 Kamnik is also one of the most prominent towns of the region called Central Slovenia – really close to the capital but with completely different atmosphere. 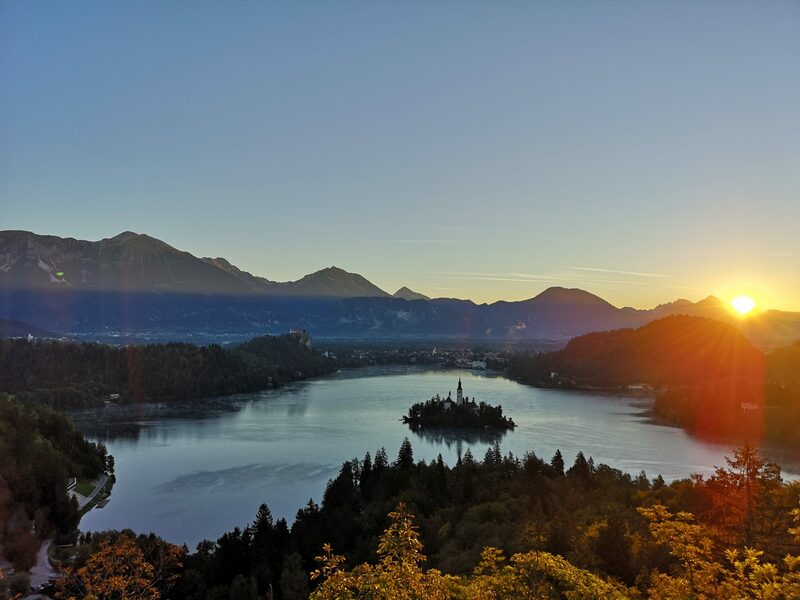 Just now a campaign is underway promoting Central Slovenia in which everybody can take part and win a prize. 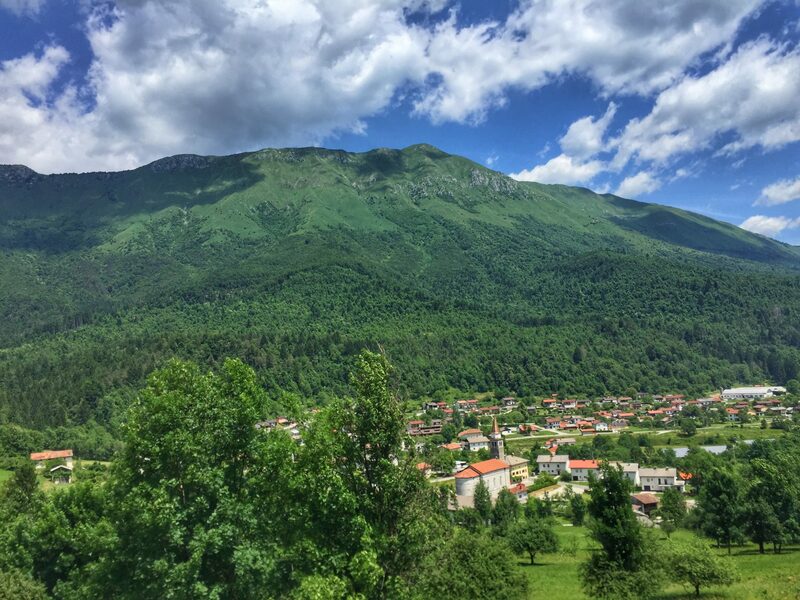 Click here to learn more about the contest and here to find out more about Kamnik! 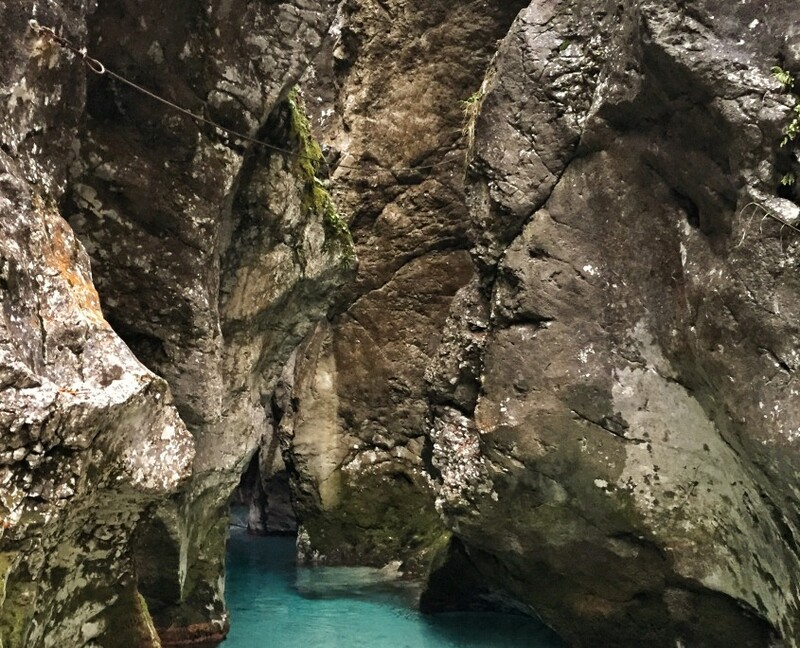 There are three photo spots worth visiting and they are very close to each other. In fact they are all connected with the fourth spot which is also the main street leading through the old town. It is called Šutna. 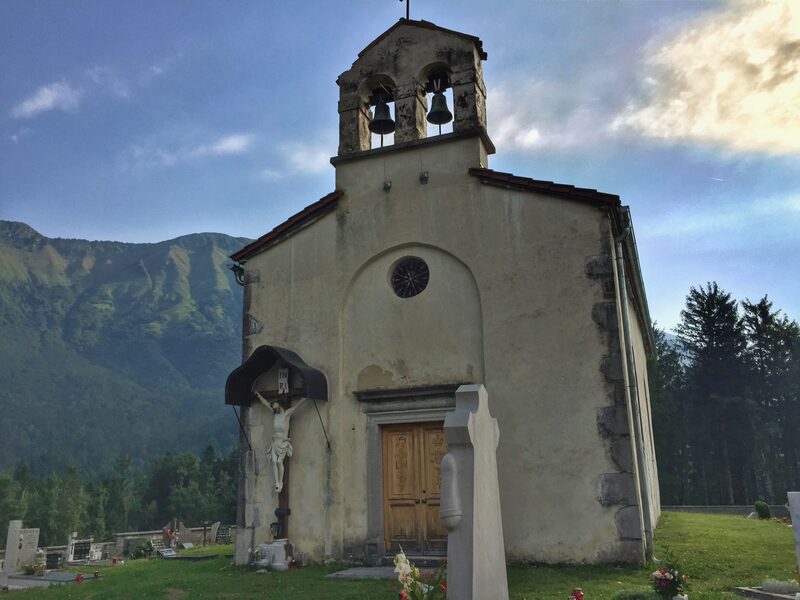 Entering Šutna from SW the parish Church of Mary Immaculate offers a first great view. 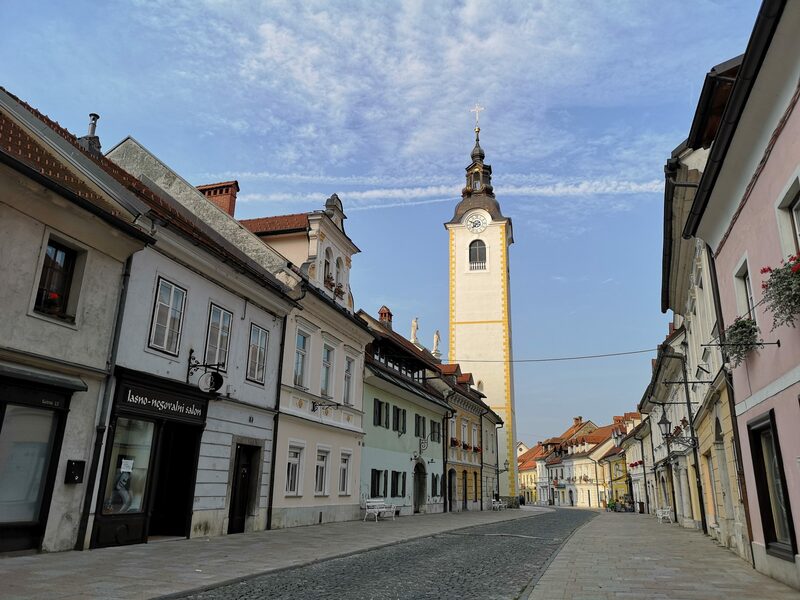 The Šutna Street is open for the traffic but with a little patience it is pretty easy to catch is empty. 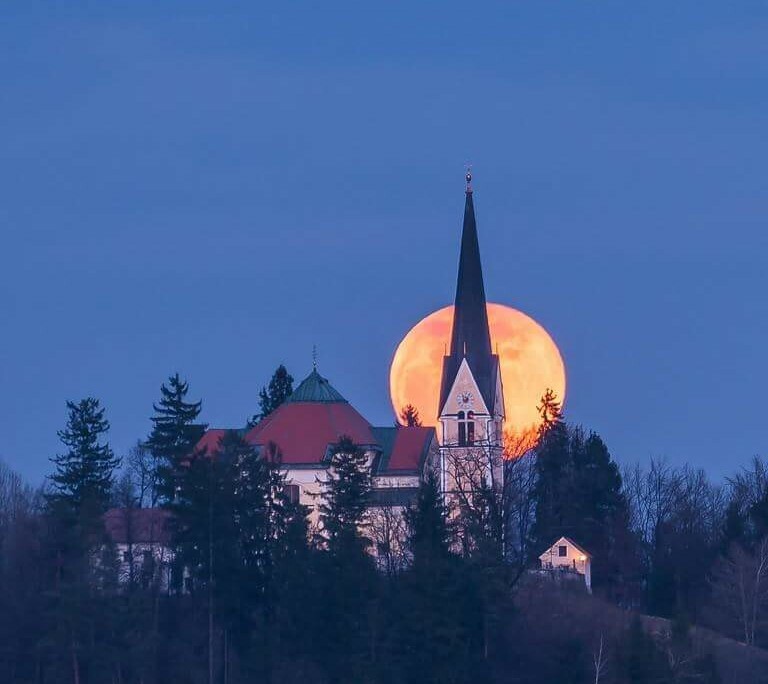 Walking along the street many details offer to the photographer’s eye and the church from behind, closing the view, is also a great sight and capture, especially in the sunset. Take note of the angels above the roofs! 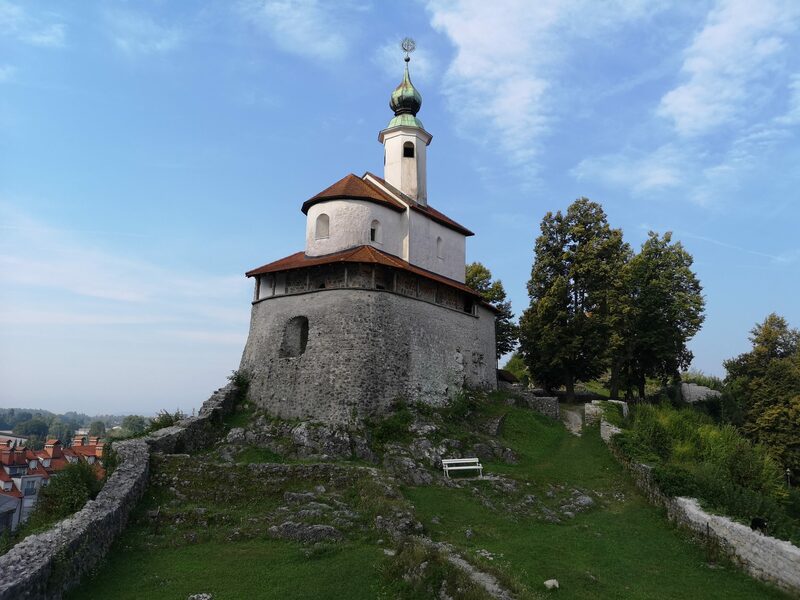 But probably the best way to explore old Kamnik centre would be to turn left first just before entering the street, cross the railway and head to Zaprice Castle – a two minutes walk! 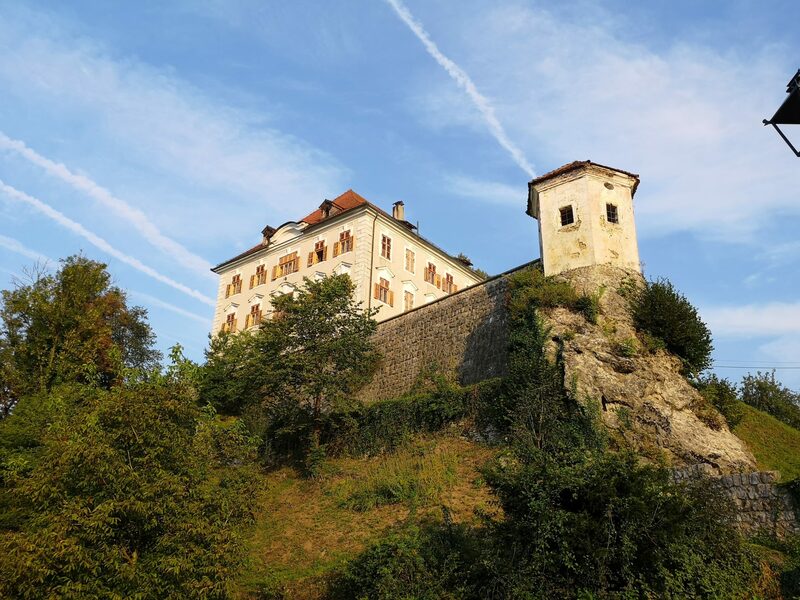 The castle is a 16th century Renaissance mansion rebuilt in Baroque style now housing the rich collections of the Kamnik Intermunicipal Museum. 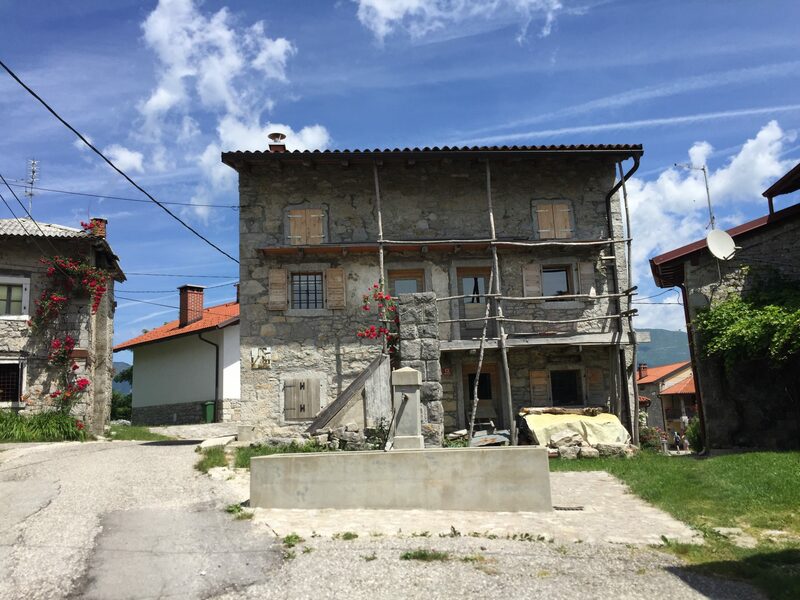 Particularly interesting there is the permanent collection on herdsmen’s life on the Velika planina high mountain plateau. 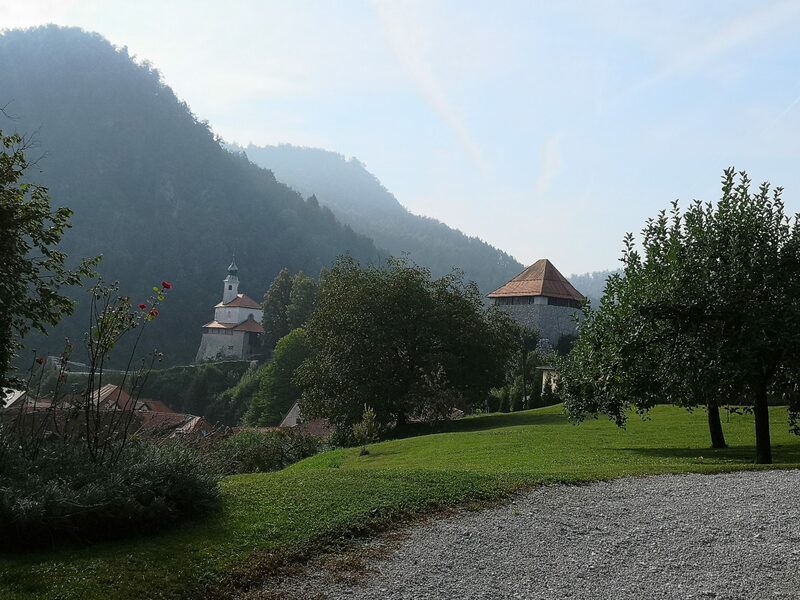 Behind the castle there is a fence through which opens a splendid view of the orchards and the Church of St. Nicholas. 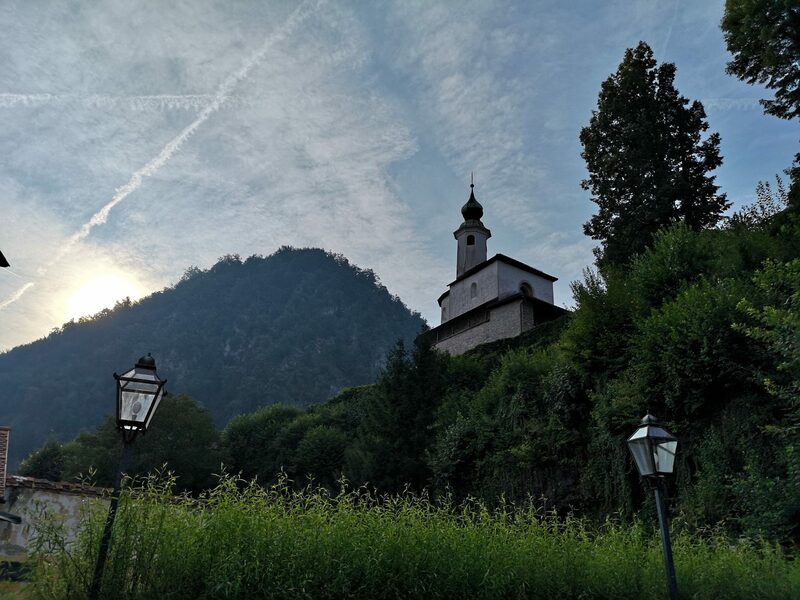 When finished exploring the castle and it’s surroundings the next destination is probably the best known spot of Kamnik which you probably have already spotted from the Zaprice. 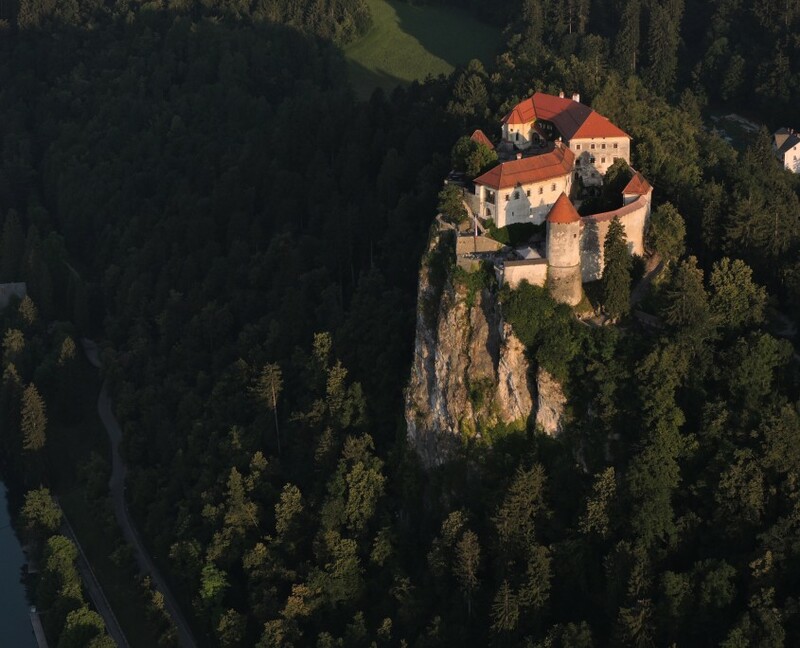 It is called Mali Grad (The Small Castle) and it overlooks the other end of Šutna. 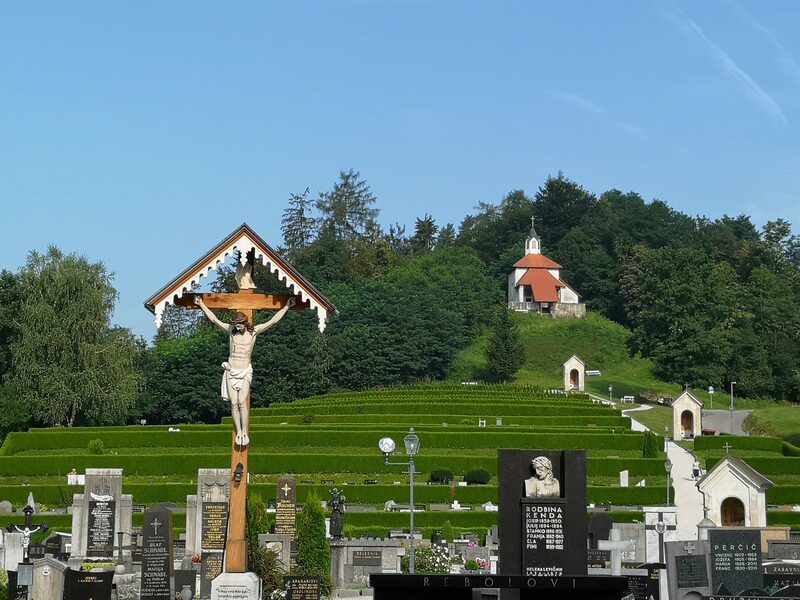 It is situated on the really small hill and accessible via short stairway. From this spot the best view of the other part of the old centre open before the eyes. It gets even better if the weather is fine – the mountains in the background make a lot of difference. The old stone wall around the Malo Grad is pretty low so climb it freely and find additional sights like this small square. Coming down from the Mali Grad there is a small open market place just across the street and a train station behind it. Find a narrow street above the station and take another three minute walk. 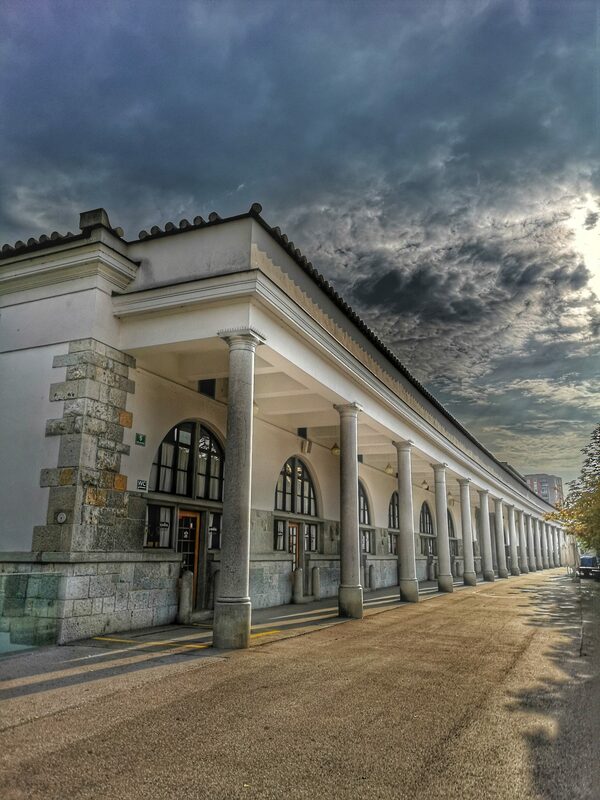 Almost immediately a nice view of the Zaprice offers itself to the camera – a roof is of the train station. 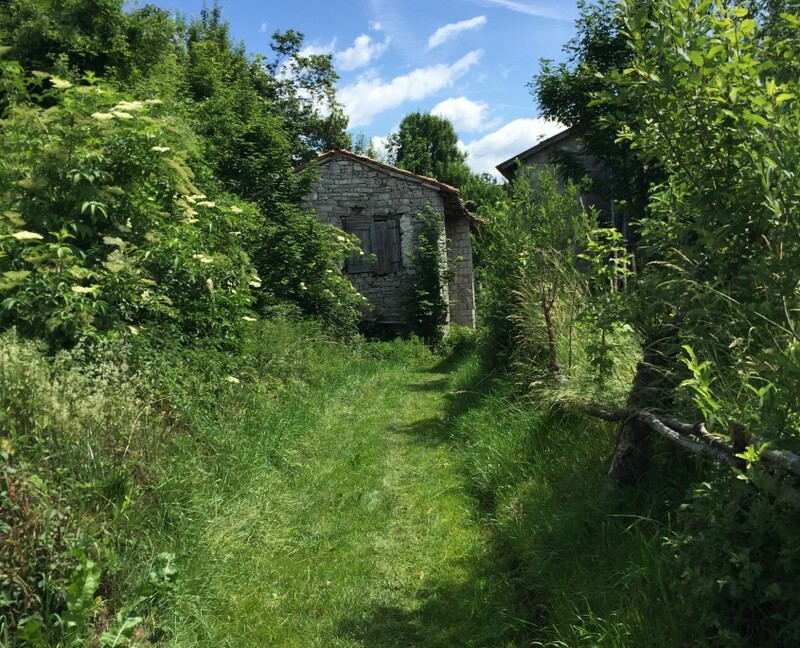 A hundred meters up the hill is another view of the Mali Grad – but it is through the door of the private yard and the owners’s dog has no understanding of the photographer’s needs. Cemeteries sometimes offers motifs for photographers. We went there to find out if another view of the Zaprice opens but it doesn’t. It does from the railway station though. Many other angles can also be found wandering around the small territory. 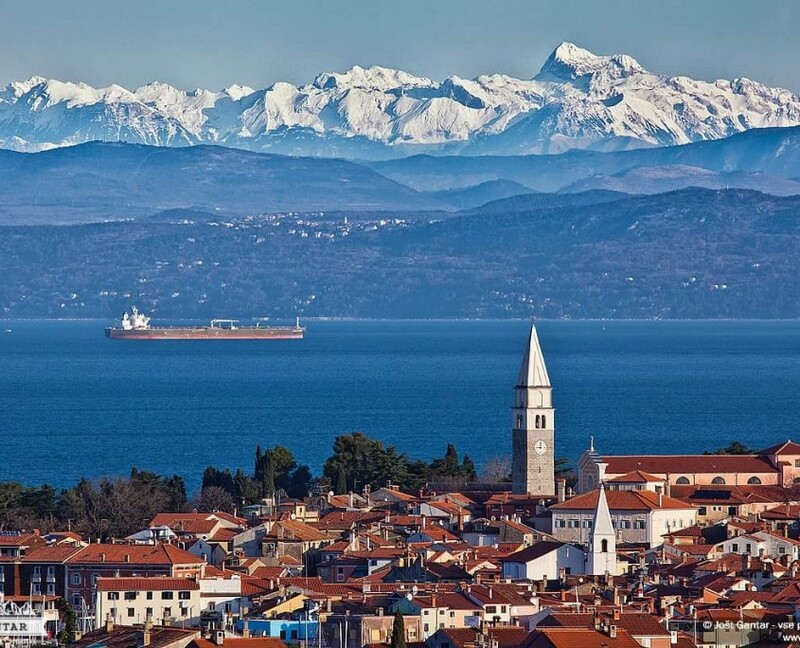 Some would also argue that Stari Grad (Old Castle) offers nice views. It does in fact but not on the old centre since the trees cover it. That would probably change in the near future – a viewpoint deck is under construction there. 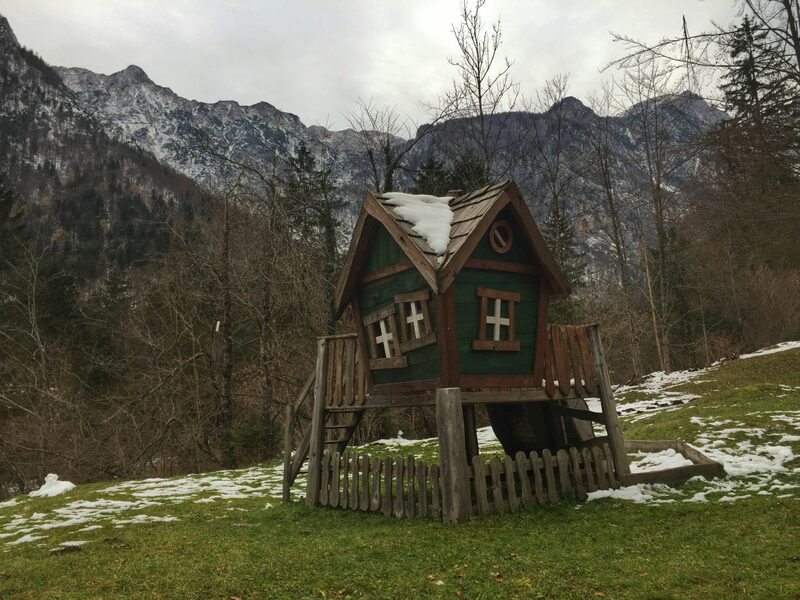 Until then only views of the mountains and the Kamnik Field are available. In any case – a phone wouldn’t be enough for a good photos. 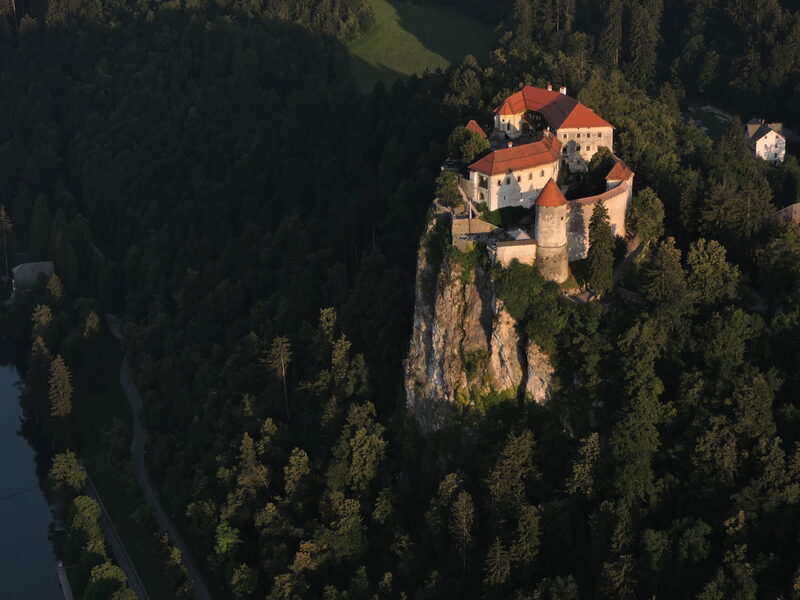 The Old Castle is pretty high on the hill, a 45 minute walk or 10 minutes drive is needed to reach it. In fact, the ruins of the castle. However, the sunrise can be nice and sunset even better there. 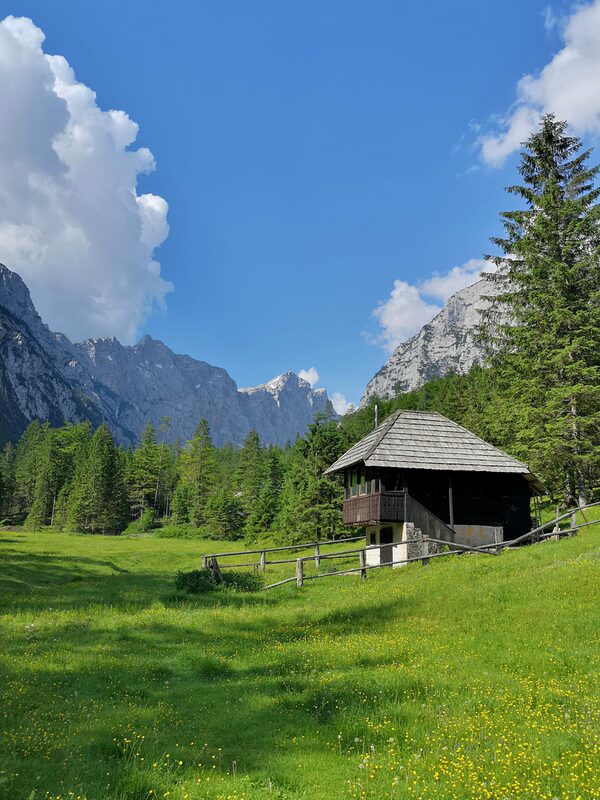 Many other places worth visiting are very close: the source of Kamniška Bistrica, Velika planina mountain pasture and Arboretum Volčji potok to name just a few. Enjoy! 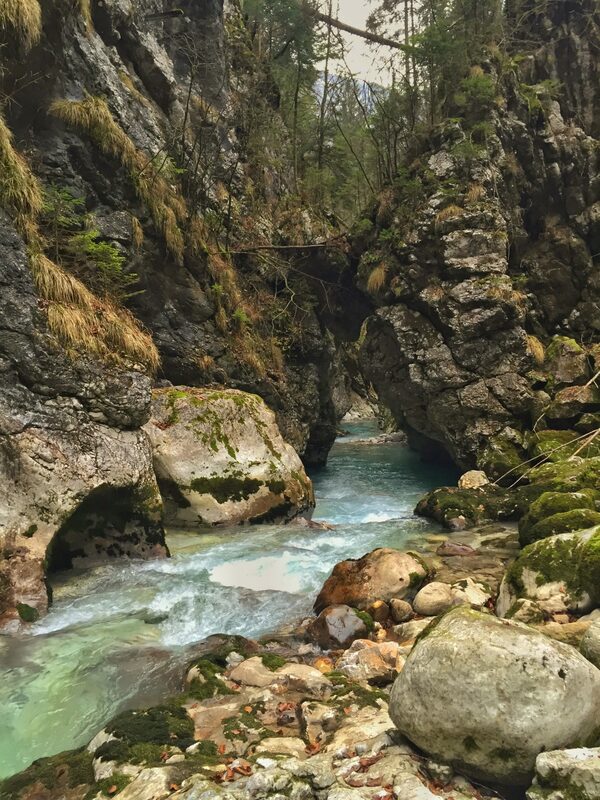 Kamniška Bistrica (The Kamnik Bistrica) is an Alpine river, a 33 km long left tributary of the Sava River. 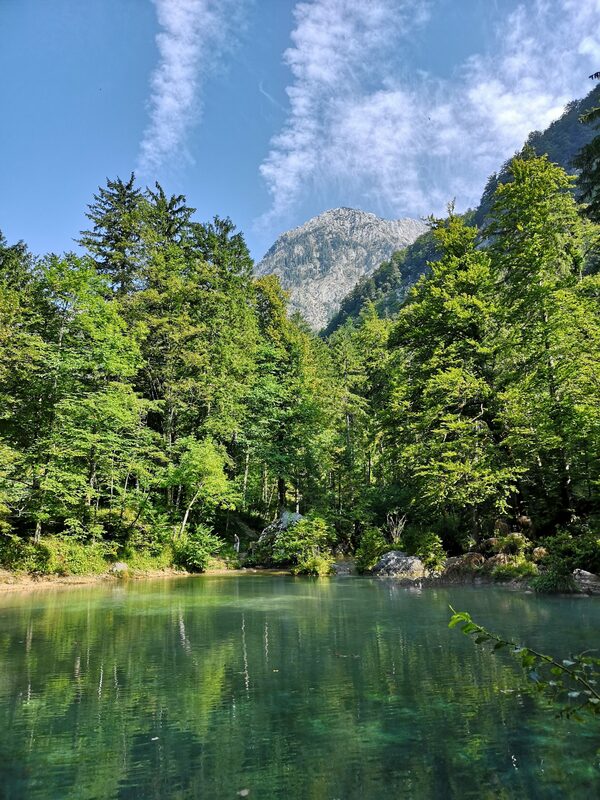 It springs beneath the Kamnik Alps. 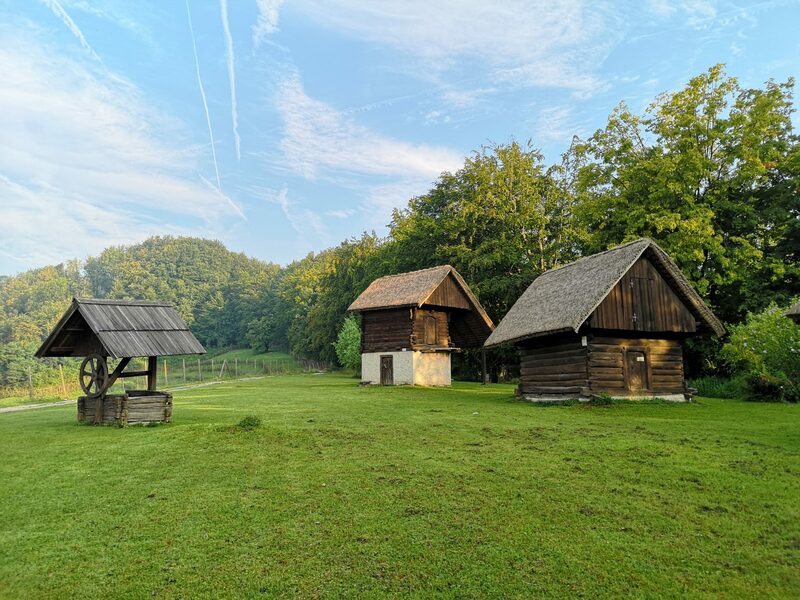 In fact Kamniška Bistrica is also a small settlement in the Valley of Kamniška Bistrica but generally most people in Slovenia would understand the location as the source of the river. 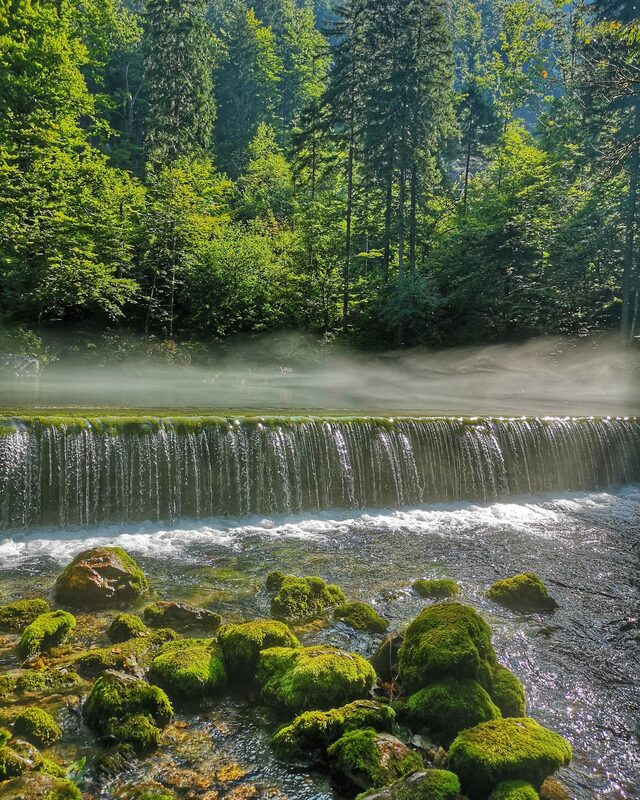 The rivers has three sources but the one near the Lodge of Kamniška Bistrica is THE source. 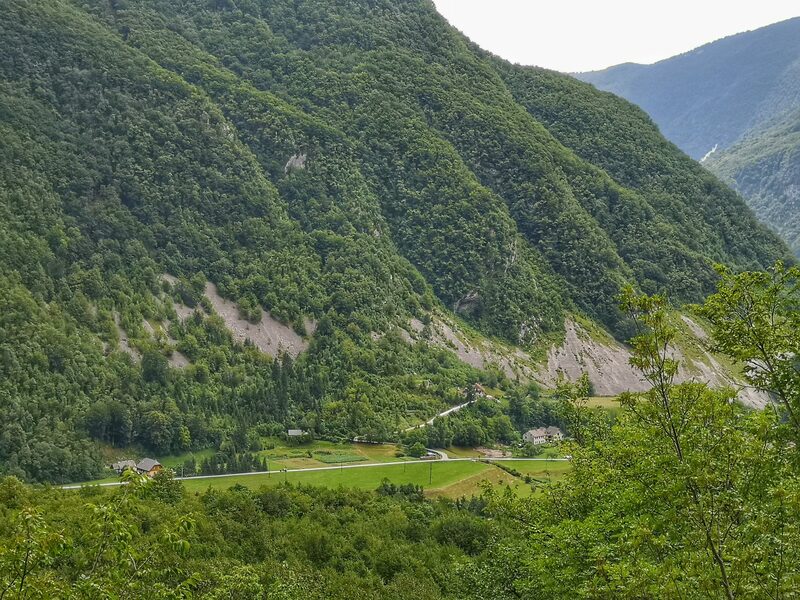 It is a typical beginning of a glacier valley, pretty narrow with the mountain peaks in the background. Since it is densely forested the views and photo opportunities are limited but beautiful. 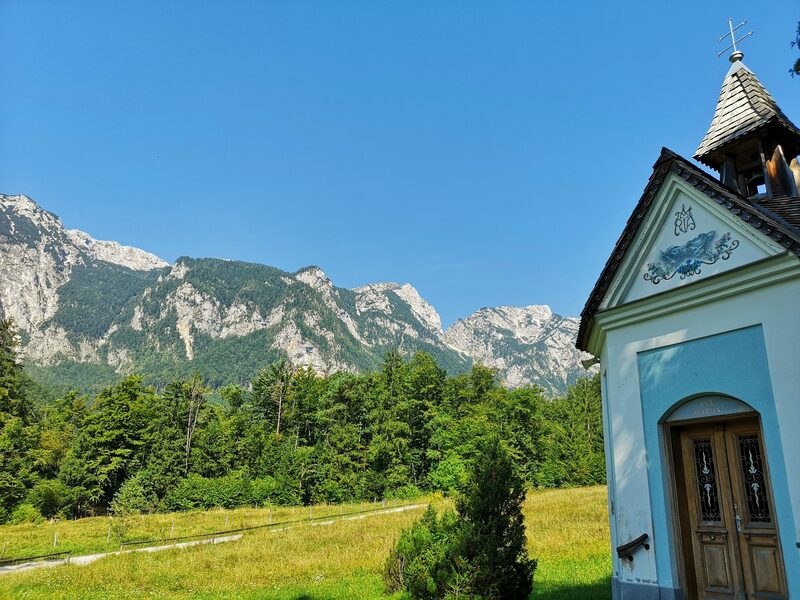 Behind the lodge the hiking paths lead to the Kokrško Saddle and Kamnik Saddle. 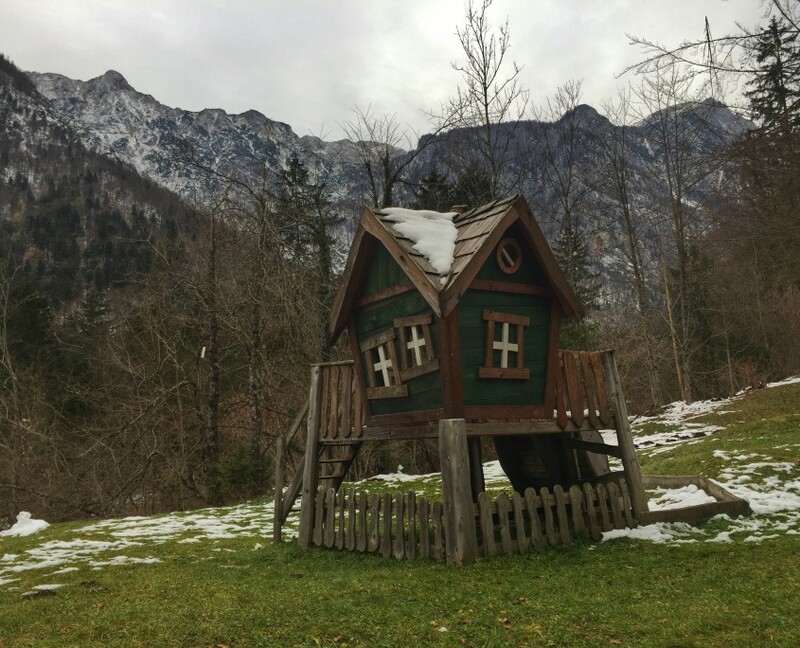 Following the white road a few hundred meters, there is a fairy tale scenery, just after the parking place. 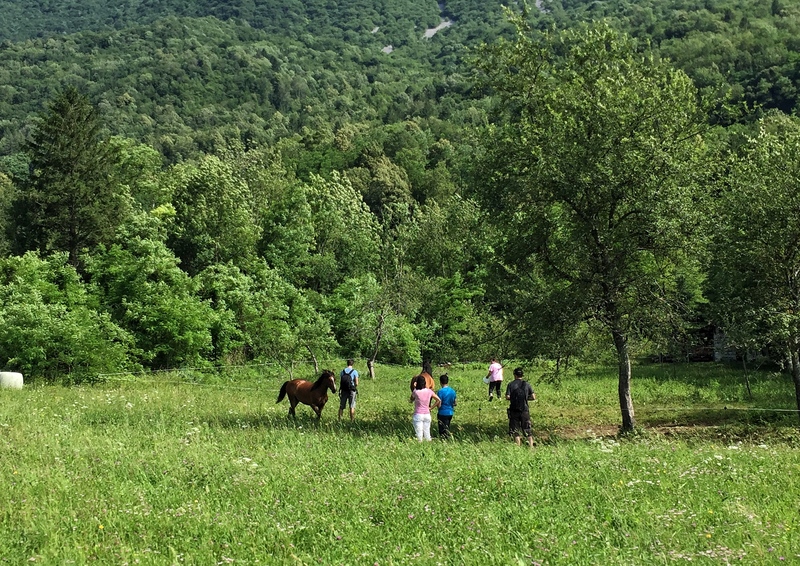 There are generally three kinds of visitors here, the mountaineers, the cyclist who stop at the lodge before heading back to the starting points and people who just enjoy the beauty of this secluded spot. In summer time it is also a nice spot to chill down a bit. … or during the winter. 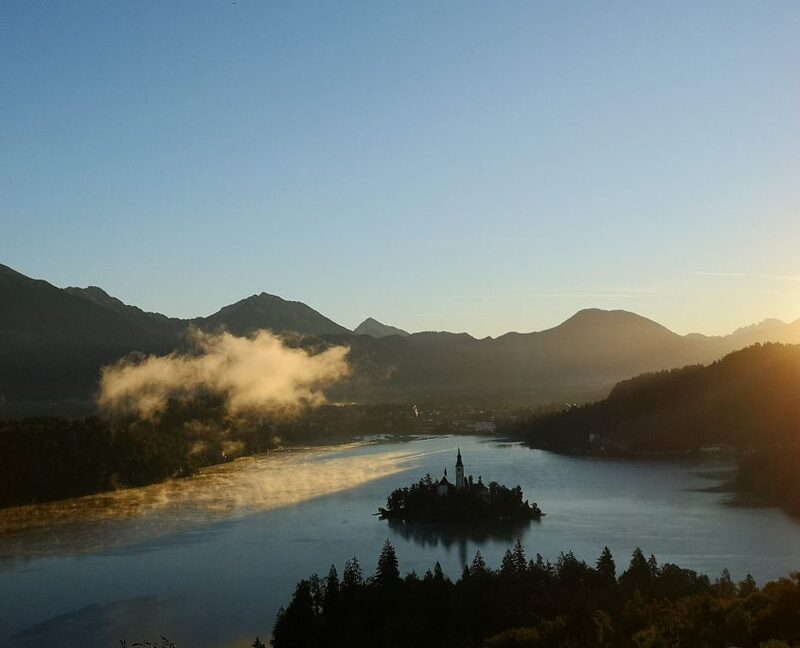 First sun rays with some mist over the water are the best combination. But don’t stop there. Above the lake the water comes into daylight from underneath many rocks, which are overgrown with moss. Spruce trees grow on larger boulders and the water creates tiny waterfalls and rapids. 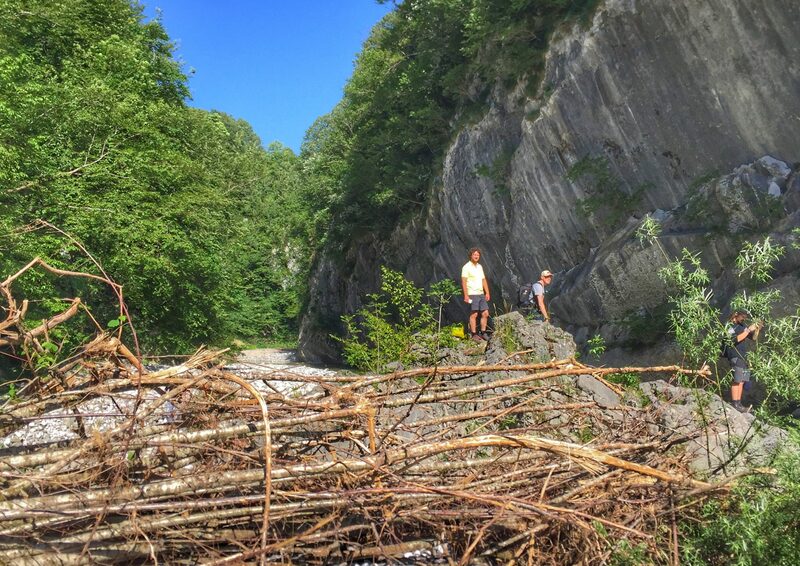 It is very refreshing in hot days, but it could also be pretty wild after heavy rain. Beautiful views on the mountains wait for you along the road from the lodge. 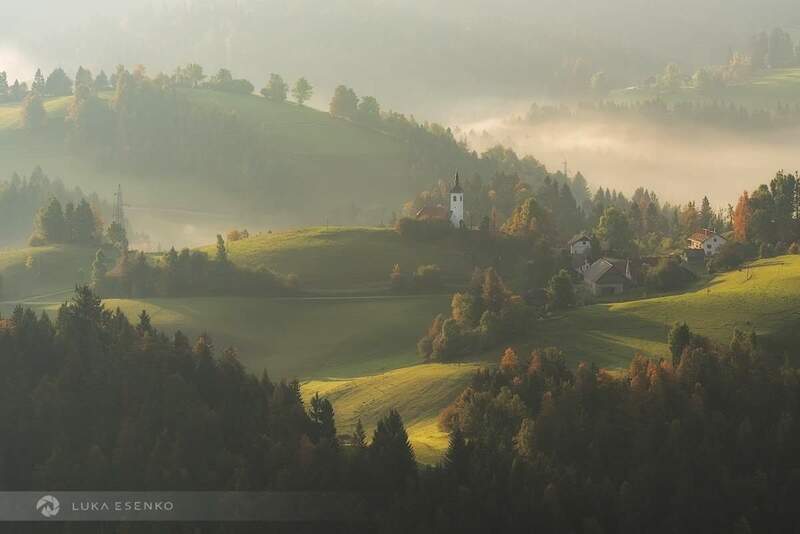 The valley of Kamniška Bistrica plunges from the south into the heart of the Kamnik-Savinja Alps. 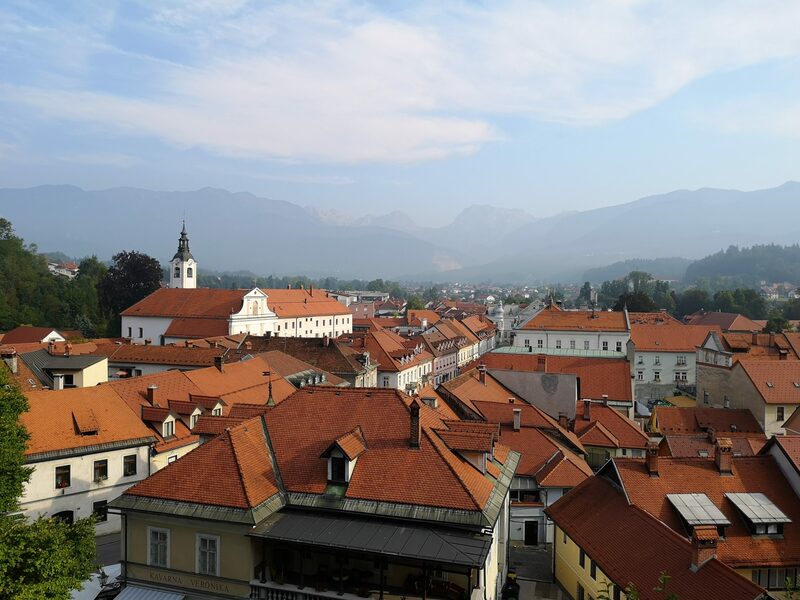 Since we mentioned the town of Kamnik so many times already – from most directions, with the exception of the access from Upper Savinja Valley, the small and charming medieval town of Kamnik is on the way to the valley. 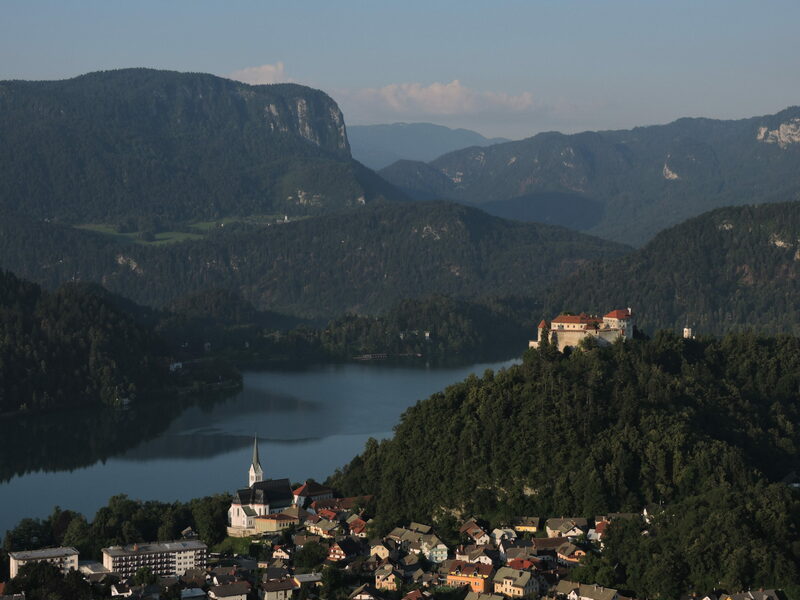 It was first mentioned as a town in 1229, when it was an important trading post on the road between Ljubljana and Celje. It is one of the oldest towns in Slovenia. 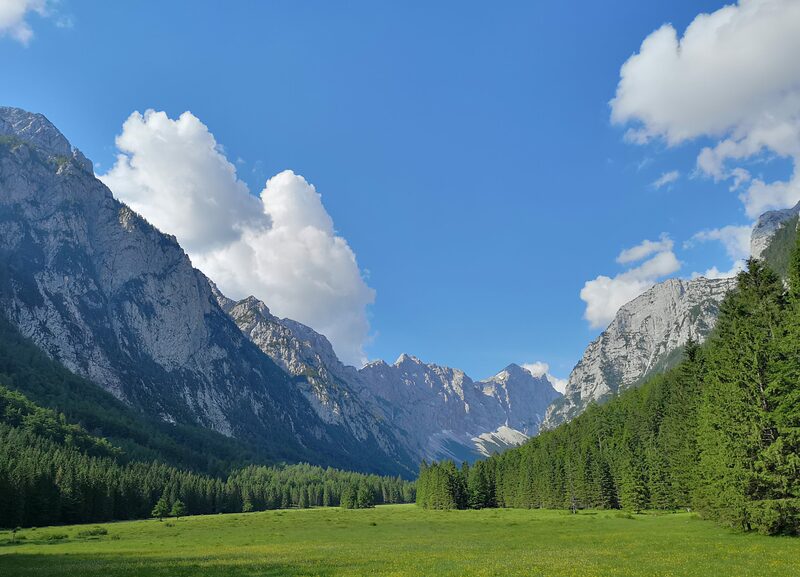 The valley is a very popular starting point for various hiking trips to the mountains of Kamnik-Savinja Alps and nearby waterfall Orglice. Cable car to Velika Planina, huge mountain plateau and ski resort with big and lively herdsmen’s settlement of unique architecture, is also located nearby the entrance to the most narrow part of the valley. 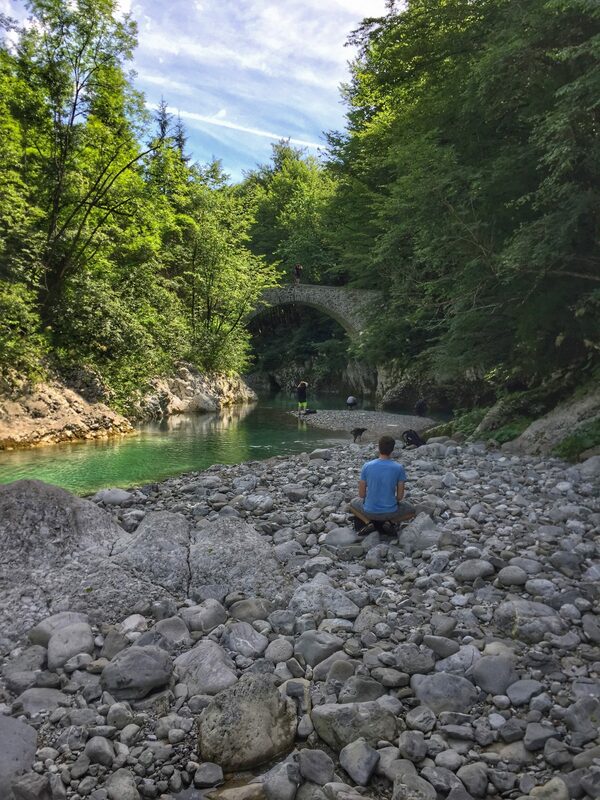 In summer days, especially at weekends, it is probably the best decision to park the car at first opportunity from this point on and enter the pathways along one of the gorges, Veliki and Mali (Big and Small) Predaselj. 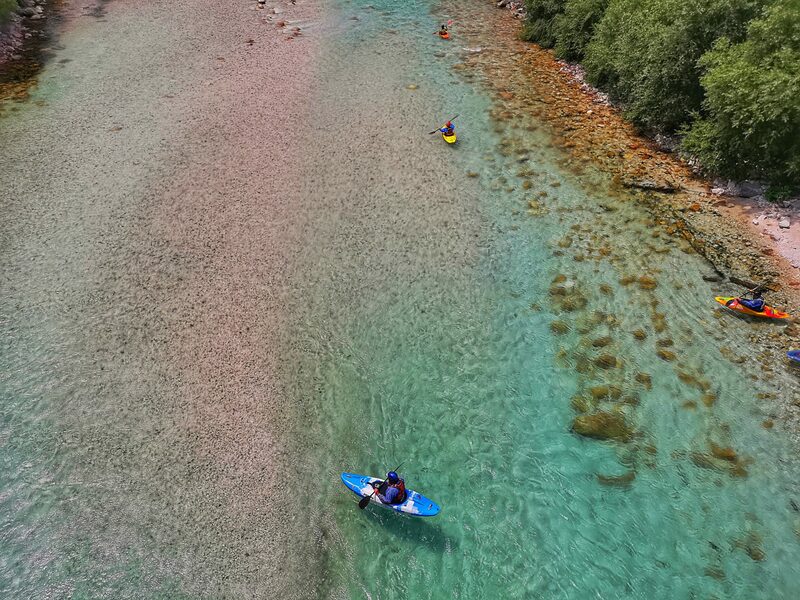 Beautiful crystal clear water is at the deepest part of the Veliki Predaselj hidden 30 m bellow. Watch your step if you decide to take a closer look at it. 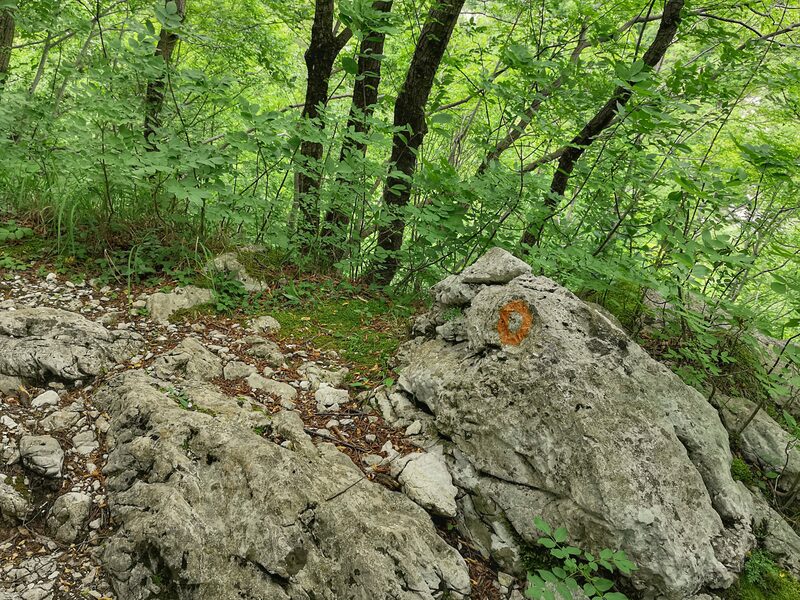 Forests and mountains around used to be popular hunting area over centuries. 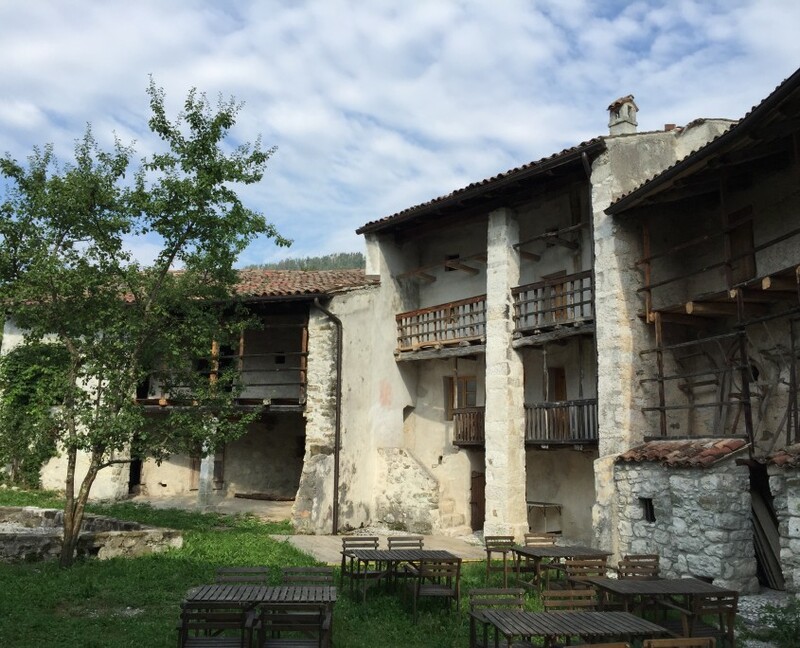 Close to the mountain lodge is another building, which used to be a Royal Hunting Lodge of the King Alexander I of Yugoslavia. Famous Slovenian architect Josef Plečnik designed it in 1932. Later it was used by Tito, as well as the smaller lodge on the boulder above. 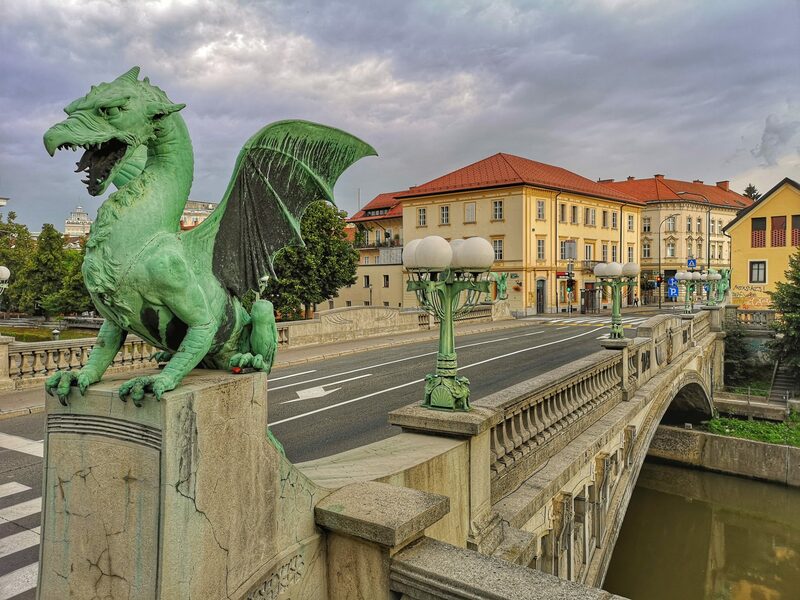 The statues of the four dragons on the each corner of the Dragon Bridge are probably the most famous and recognizable images of the city. They are masterpiece by themselves and everybody rush to take photos with them. This photo point is therefore not difficult to find but we would like to turn your attention to some additional details beside taking selfies with this somewhat terrifying pieces of art. First of all it is not so easy to take a good photo of the beasts since they are positioned against the sky and backlighted. 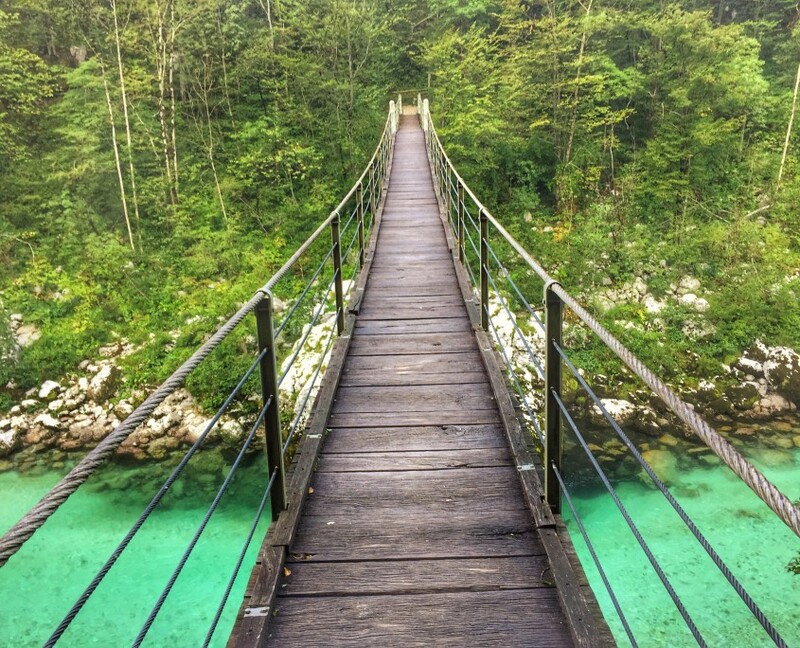 But they are on the opposite sides of the bridge so it is easy to find out which side suits you better. 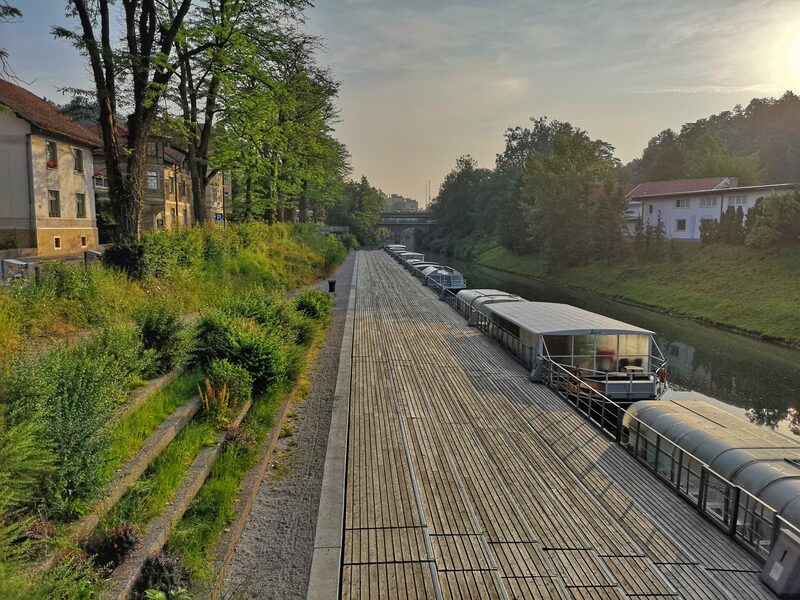 All photos in this post were taken early in the morning when light is better on that side of the bridge which is just across the road of the food market. This is also the only corner where one can safely climb the low concrete wall next to the bridge and face the beast eye to eye and also gets the perspective of the bridge and the road – when it is empty it nicely add to the composition. The bridge itself is a unique creation, an extraordinary piece of technical heritage and a superb example of Art Nouveau architecture. 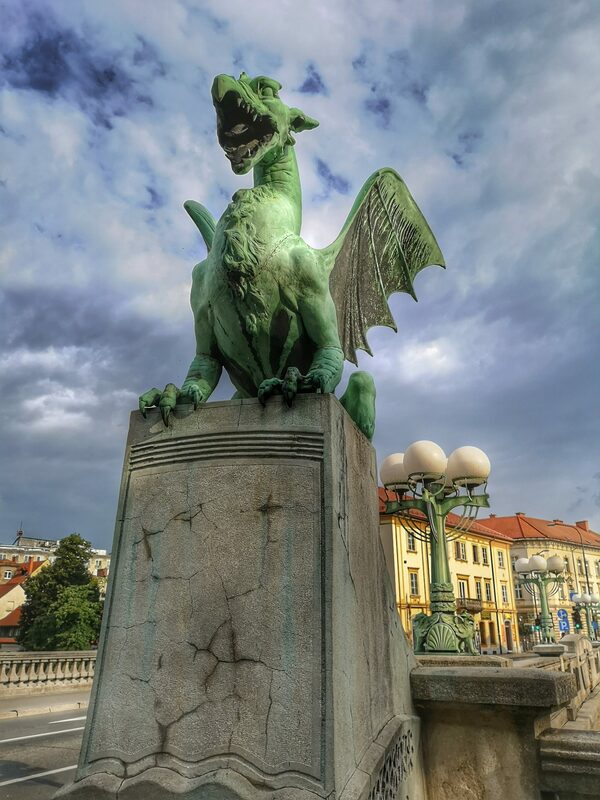 It was constructed between 1900 and 1901 and it was Ljubljana’s first reinforced concrete structure. The parapet lamps used to be powered by gas. 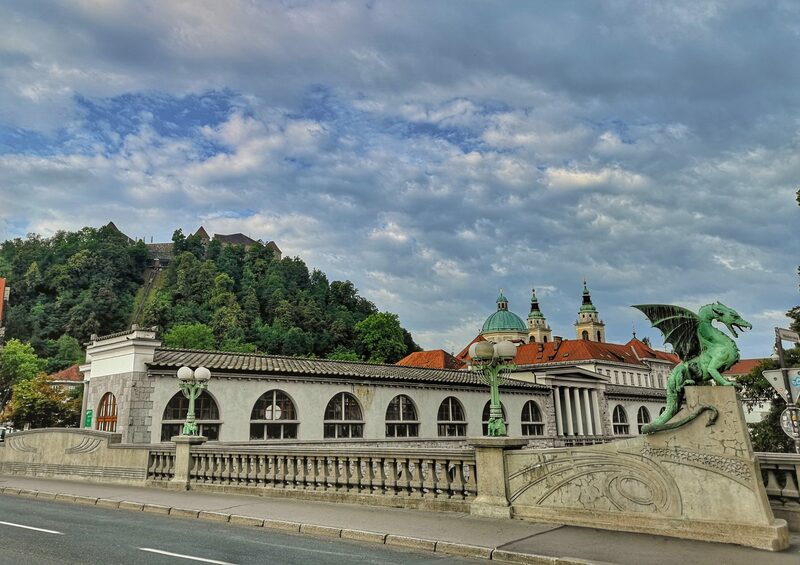 The views from the bridge are packed with the most important architectural heritage of Ljubljana: the Ljubljana Castle on the Castle Hill, the Cathedral and arcades of the Plečnik’s Open Market are extremely photogenic and offers many different angles with and without the dragons. Reaching this point of Ljubljana from the Triple Bridge one probably passes also the point just before the Butcher’s Bridge on the photo bellow. BTW, did you know that the Dragon Bridge replaced the original wooden Butcher’s Bridge? Arcades of the Open Market are also very photogenic but as a rule much more facing east. This is valid from the both parts of arcades, the one just around the corner of the Triple Bridge and the second one which begins at the Butcher’s Bridge and ends close to least photogenic dragon. 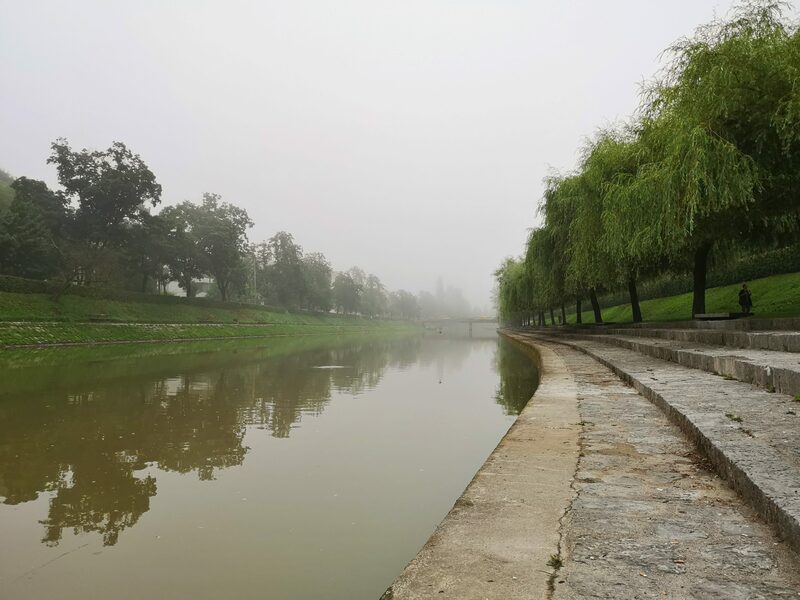 We recommend to make a short walk along the left bank downstream from the Dragon Bridge to reach another small bridge. 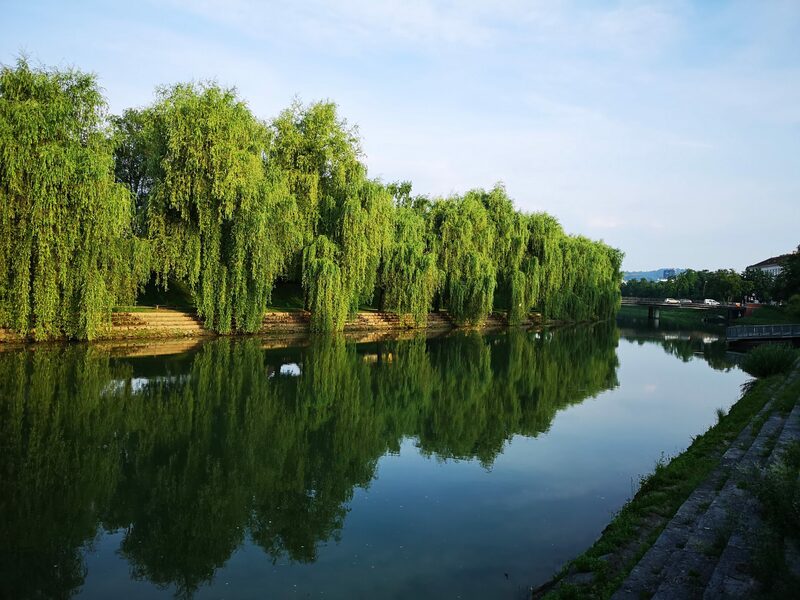 The river view is very beautiful from there – in all seasons but summer. Still a sunset or sunrise time can provide for a nice photo. 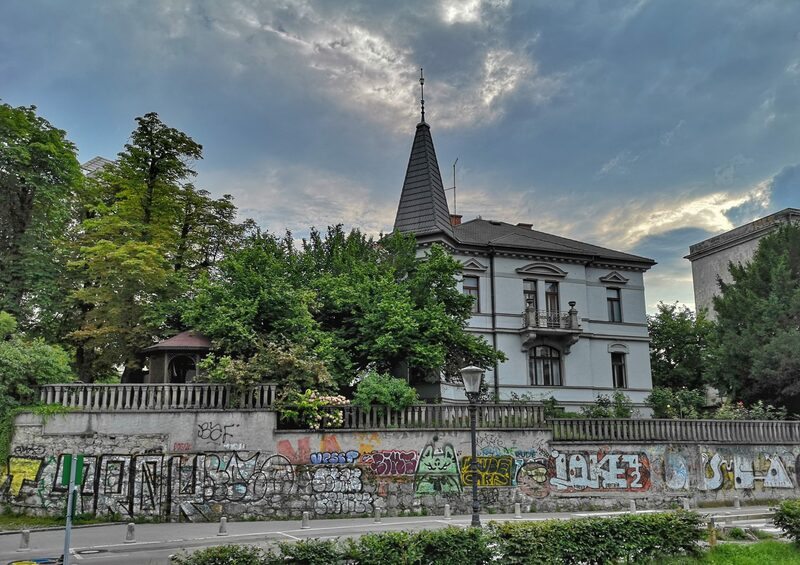 This part of the left bank ends with the Tovarna Rog (Rog Factory) which is an autonomous social and cultural centre set on the premises of a former bicycle factory. “Consensually” occupied in 2006, this vast location of 7,000 square-metres in “downtown” Ljubljana currently facilitates a rich programme of social and cultural activities and programmes. The presence of the centre is visible in the neighbourhood. 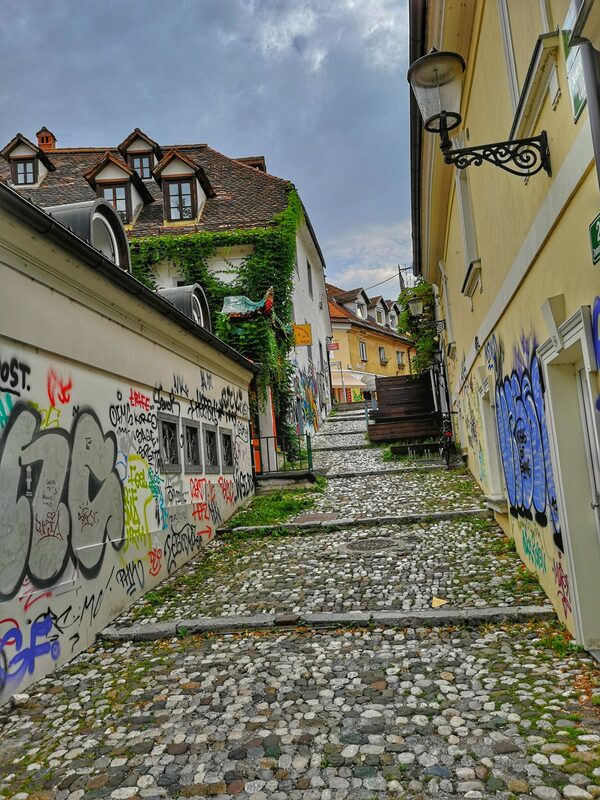 The part of the city between the river and Trubarjeva street is famous by itself but some additional sights are available from this walk. Text and photos Zoran Leban Trojar. 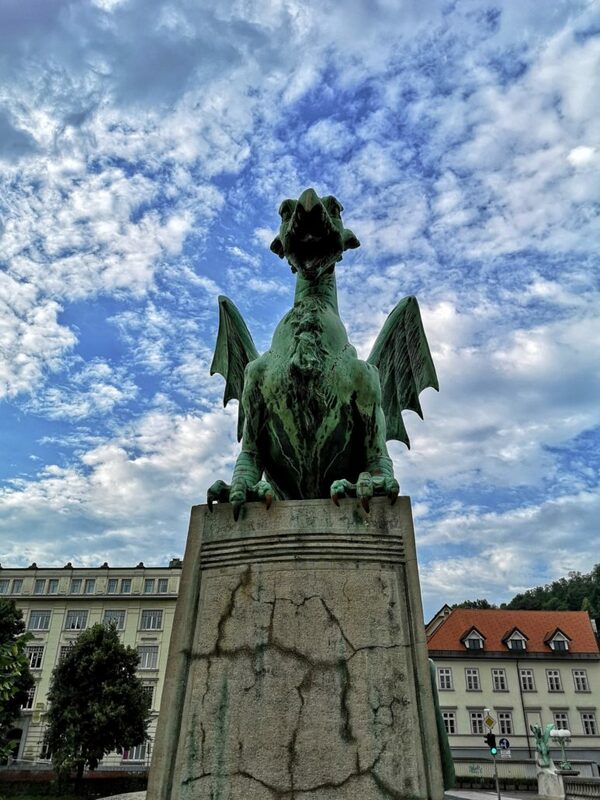 About the legend of Ljubljana Dragon. 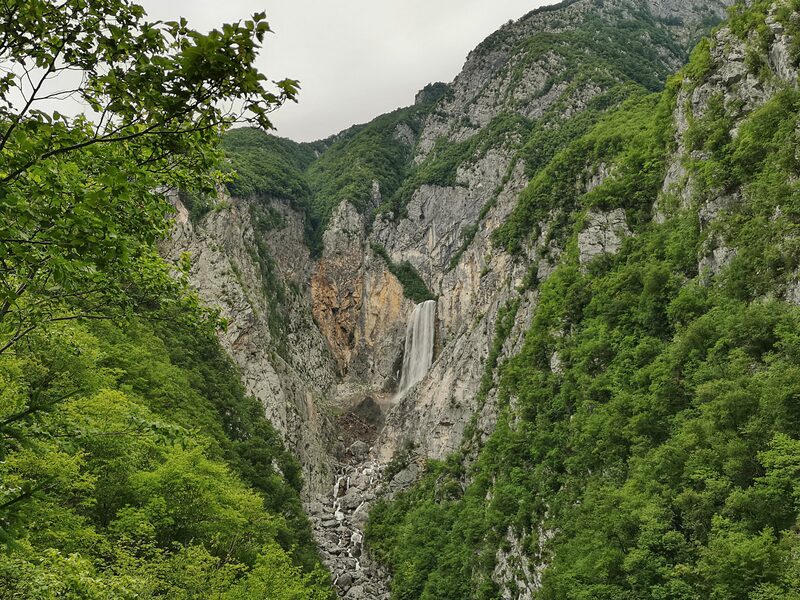 Let’s get some facts in the perspective first: Boka waterfall is a 144 high and 18 wide waterfall, considered to be one of the most magnificent waterfalls in Europe. 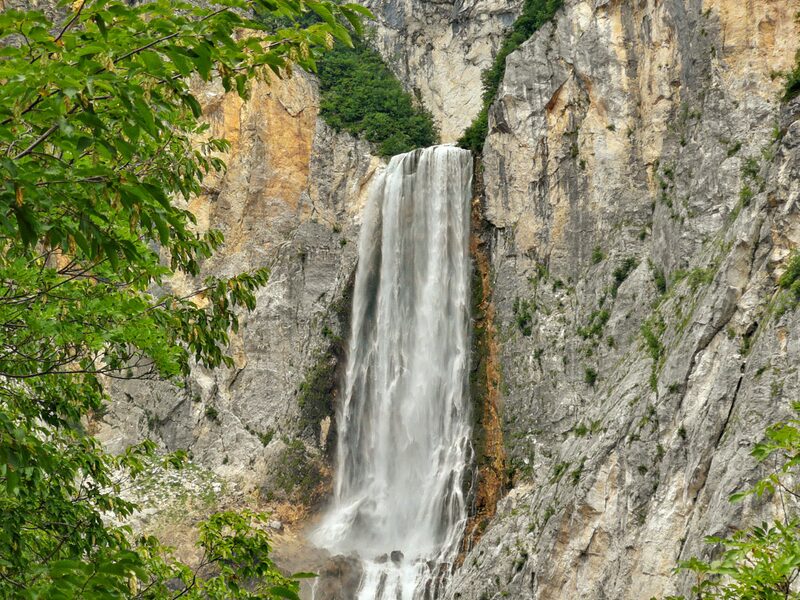 It is definitely the most majestic waterfall of Slovenia and we have plenty of them here. Surely many would disagree if they were not lucky to see it in its full season when its water flow rate can reach 100m3/s. In the summer it can drop to only 2m3/s, so the seasonal flow rate ratio is 1:50! Not this summer though! 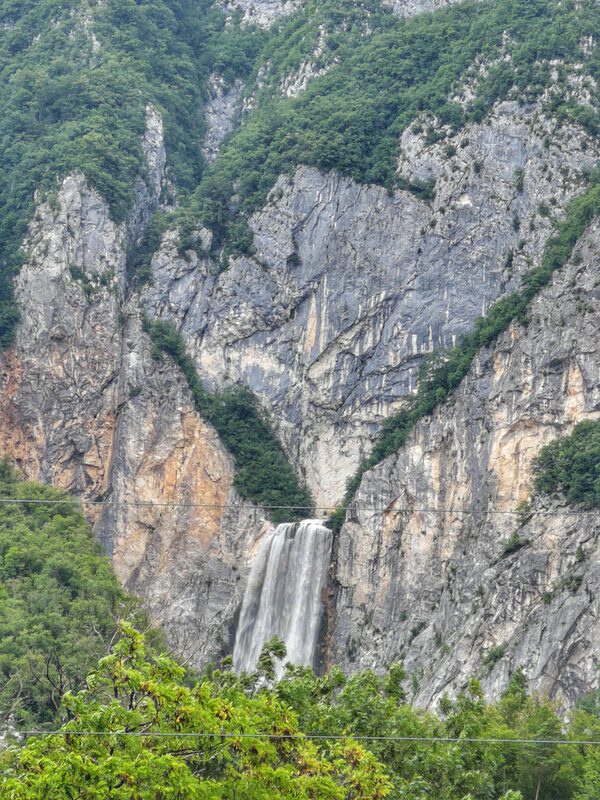 The waterfall is visible already from the bridge over the Boka stream in the vicinity of which most of the visitors park their cars and bikes. 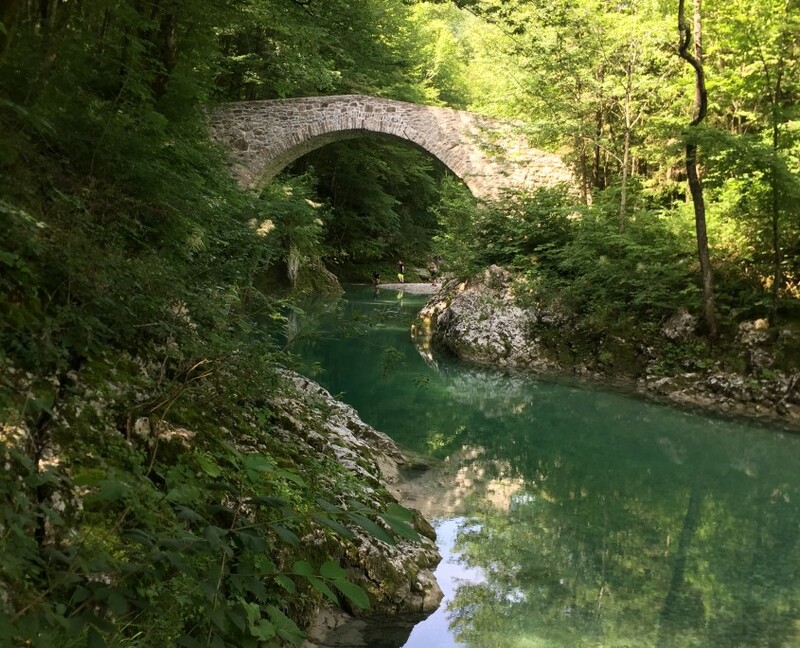 However, just behind the corner lies the Boka Hotel with its own parking lot which is sooo close to the another bridge, one of the only few bridges over the mighty Soča river itself. 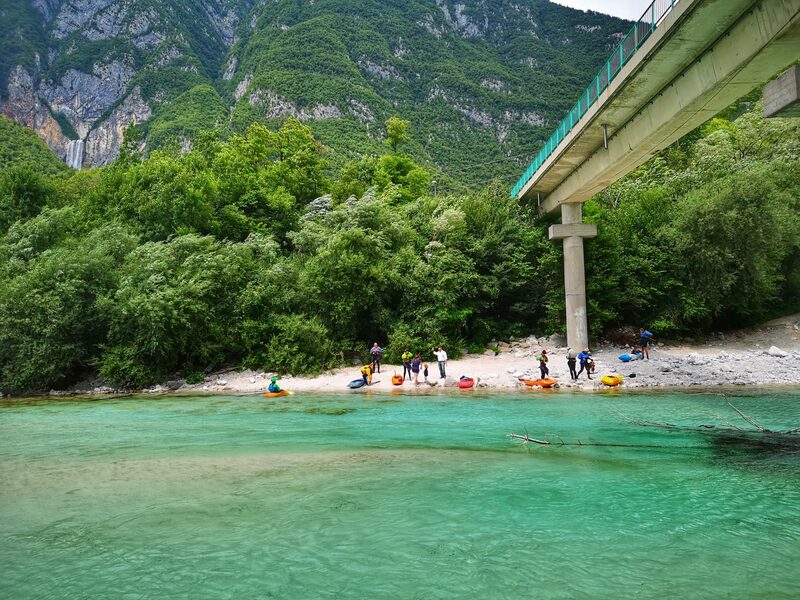 The famous shots of the kayakers on the translucent water are usually taken from the Napoleon Bridge in Kobarid – and from this one which leads to the small settlement of the Log Čezsoški, one of the few settlements on the left bank of the river. 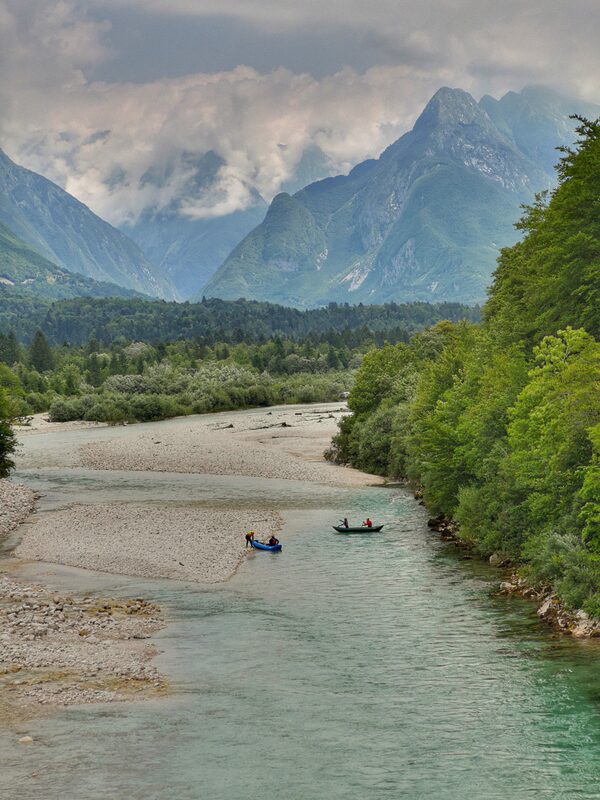 We were not lucky with the kayaks this time but the river itself is always beautiful and the view from this bridge is different from what we usually see in the media: it is an upstream view towards the town of Bovec and surrounding peaks of Julian Alps which just after the town divide the upper Soča Valley (Trenta) and Koritnica. 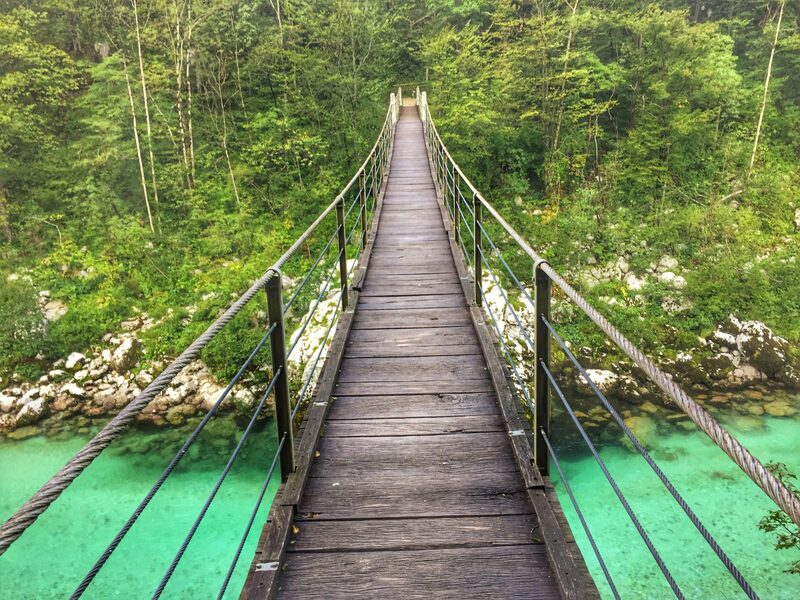 There is even more to it – the waterfall is visible from this bridge too and the sight is even better! So if in a hurry a photo can be taken from the bridge – with a good camera it should be decent enough for a memory or a social media post. 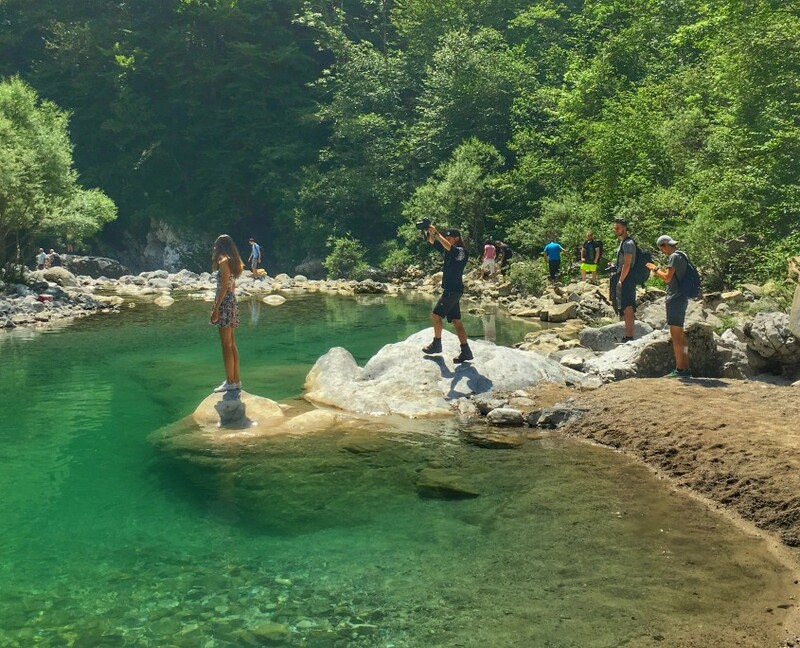 Our posts are focused on the mobile photography trying to show places where ordinary tourists can get decent photos without an expensive gear from the reachable spots. We have been doing Instagram and blog for almost 6 years now using phone cameras exclusively. 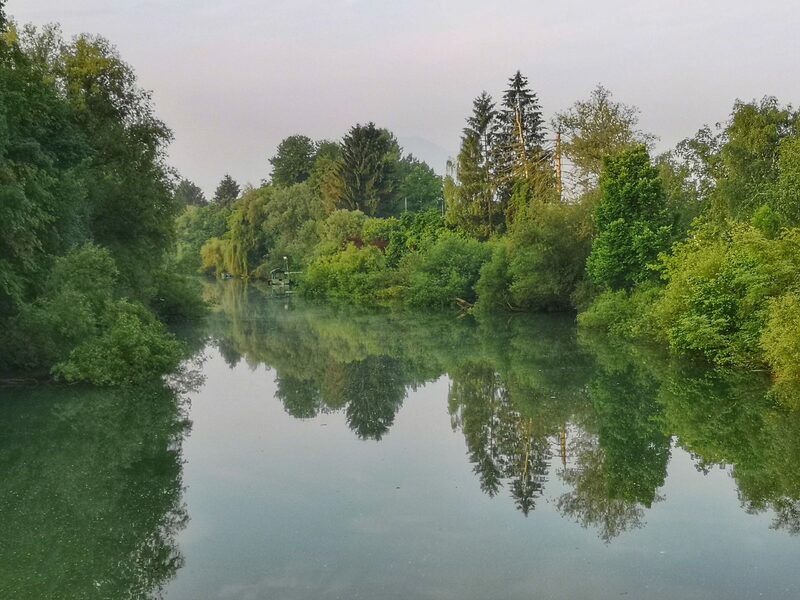 Ever since we have begun to use HuaweiP20Pro our horizons are widening – it has extremely powerful zoom which can be used handheld: the photo bellow is a zoom up from the same spot as the above photo was taken. 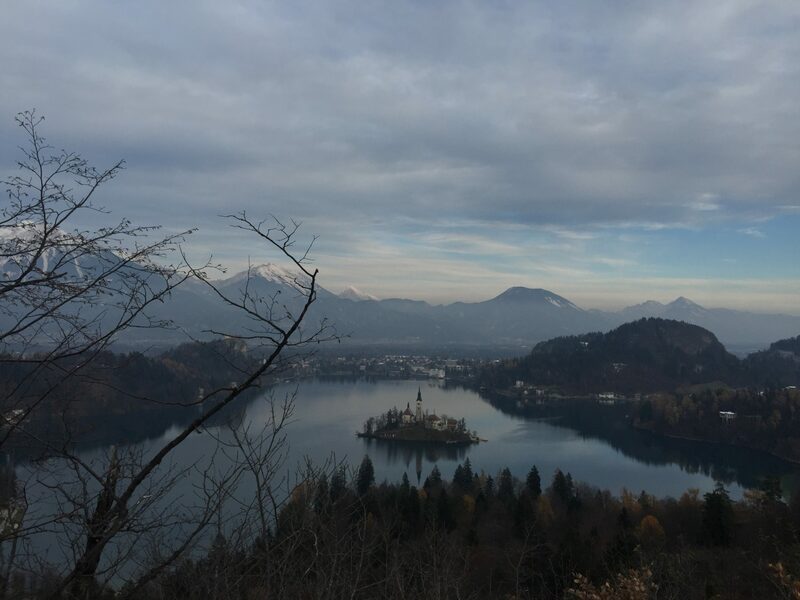 After passing the hotel building and crossing the road just before the bridge a narrow path opens leading to the viewpoint which is accessible in some 15 minutes. It is not difficult but we would still recommend to wear a pair of decent shoes. Walking along the bed of Boka in the summer one can imagine the amount of water which flows here when the snow of the Kanin massif begins to melt (up to 8 m of snow can be accumulated in some winters there).The karst terrain with large caves can be deadly for skiers leaving the official ski runs. The path leading to the viewpoint is mostly in a pleasant shade of the trees with only some tricky places to watch your step. The viewpoint is situated on the slope across the waterfall and can be pretty crowded but the views are much better than from the bridges. Most of the visitors turn around here but some other viewpoints can be reached which are higher on at the slope and a bit closer to the waterfall. Reaching them is not so easy anymore, the path gets pretty steep and can be slippery as well. We needed another 15 minutes to the next viewpoint following the orientation signs on the rocks and trees. 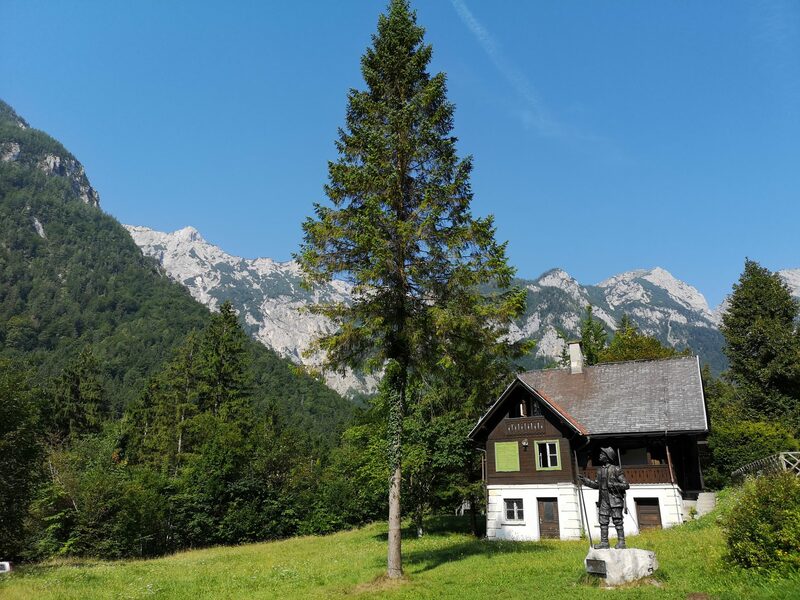 Some unexpectedly good sights of the valley towards Bovec awaited us on the path. 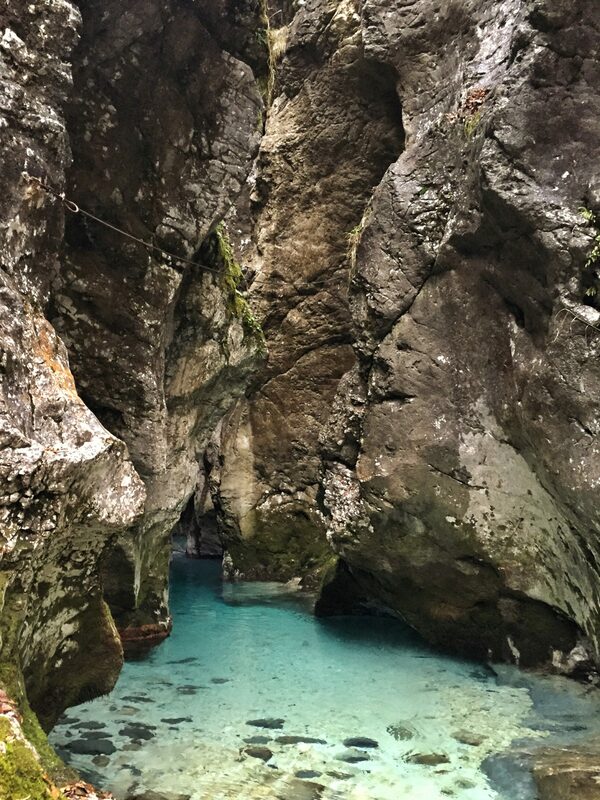 The water is collected in the karst cave system and spring just above the waterfall, falls freely for 106 m, followed immediately by another 30m drop. The source is situated at an altitude of 725 m, the average temperature of the water is 4,5 degrees Celsium. 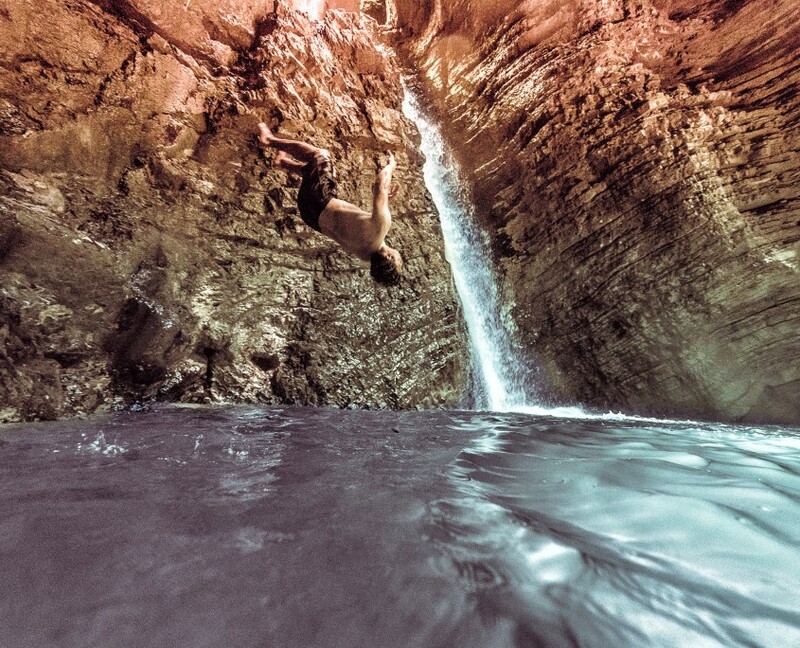 Since the rock is pretty soft the waterfall still increases! Watching this power of nature from the higher and closer viewpoint and without disruptions from other people is definitely worth all the effort! Returning on the the mountain paths is always more dangerous than going up so be careful stepping down! 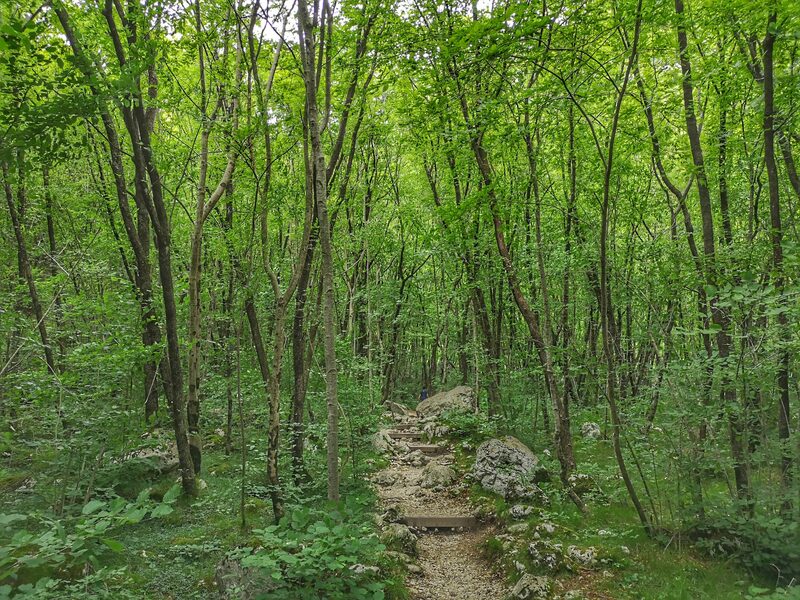 But don’t overlook this sight with which this whole short photo trip can be rounded up: the road to Log Čezsoški. Of course we had to check the situation on the bridge again when we returned to the parking lot. Some more luck though but not the proper light to get the effect of the kayaks hovering on the water. 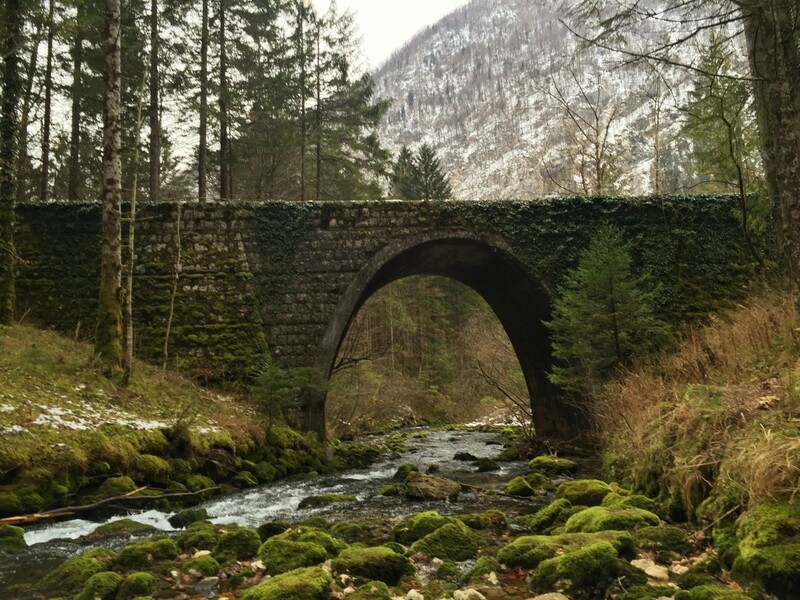 Nevertheless this bridge offers excellent up and downstream views on the river and the valley caught amidst the steep mountains and it is worth to stop there for the bridge itself. The sights are ever changing. 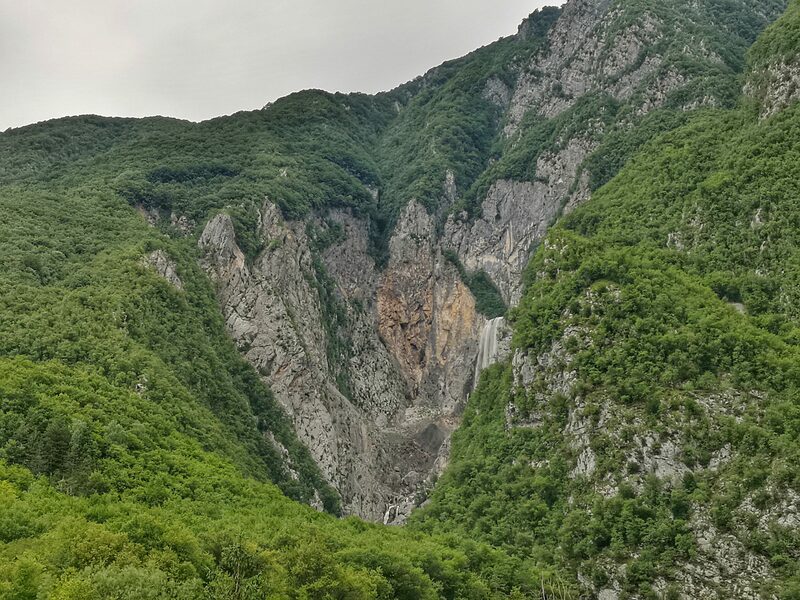 Krma is a glacial valley, one of the three valleys that stretch from bellow Mt. 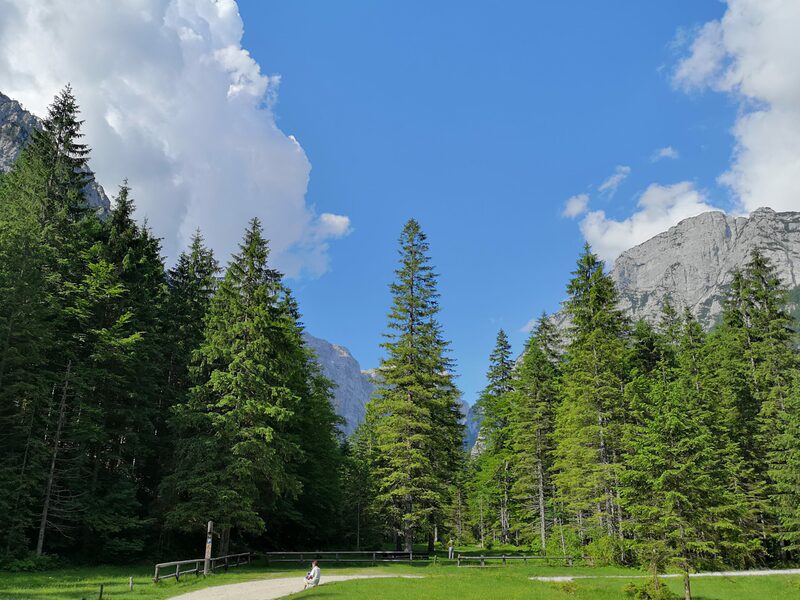 Triglav to the village of Mojstrana. 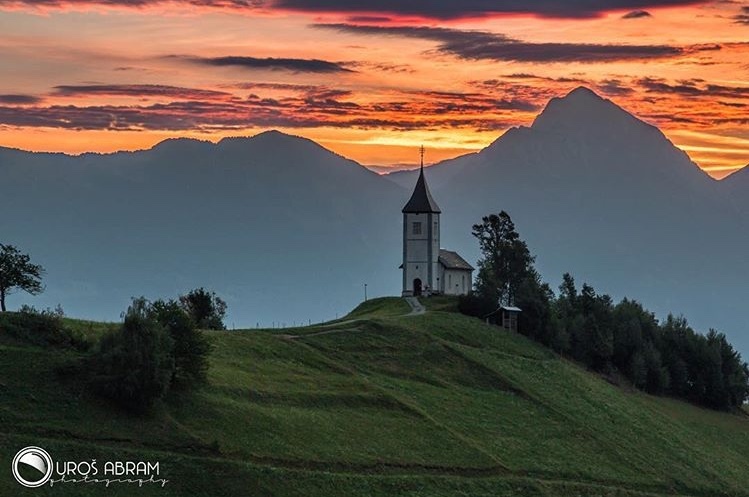 Krma is the southeast of them and probably best known as the easiest access to the Triglav peak. 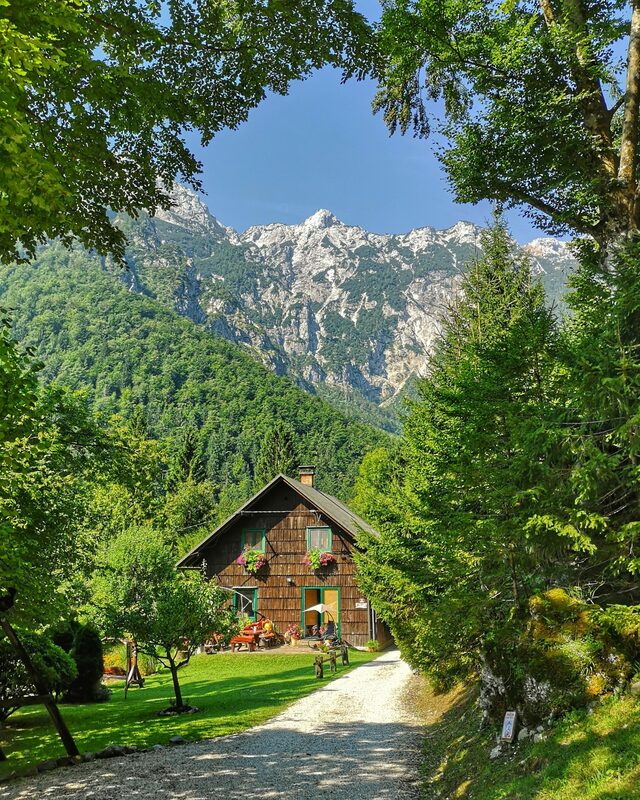 There is a route to the Triglavski dom lodge which is 7,3 kilometres long and gradually ascends 1550 height meters. 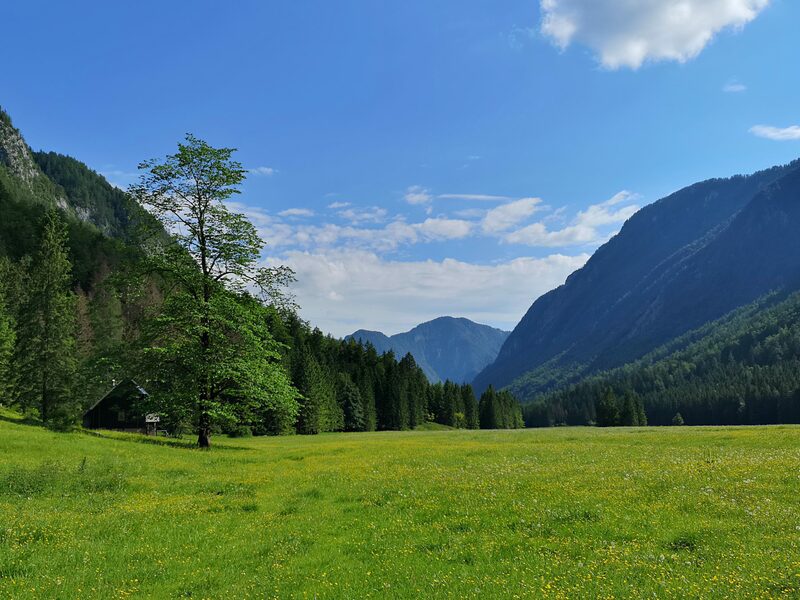 Krma Valley is the upper part of a Radovna Valley which ends near Bled with the famous Vintgar Gorge. 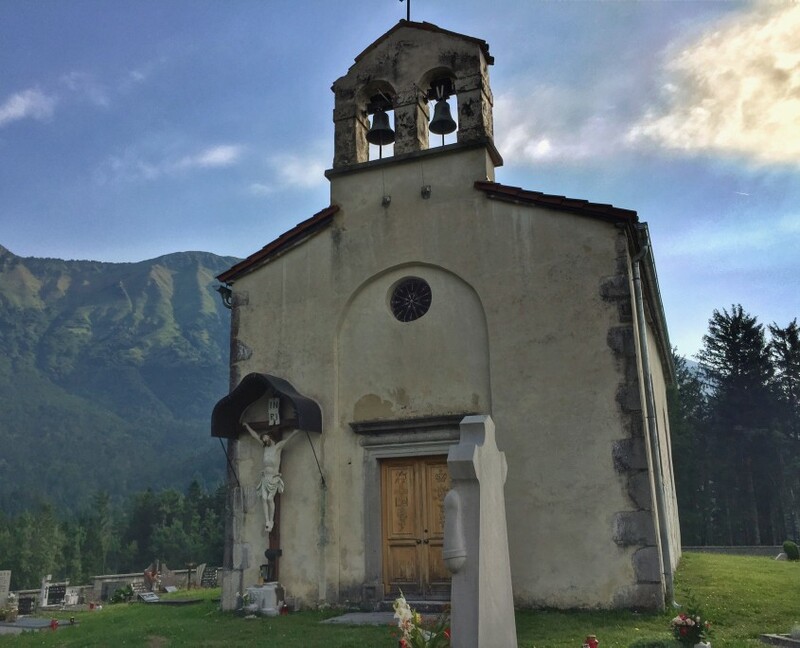 In fact we were exploring the Radovna Valley in the morning and out of curiosity turned onto the gravel road leading to the Krma Valley at the crossroads for Mojstrana. When the road came out of the forest and we got the first glimpse of the mountains surrounding the valley there was only one thought on our minds: to stop the car as soon as possible too see it in full. It was still early in the morning, the sky was blue with some puffy clouds showing over the peaks, the valley was empty. 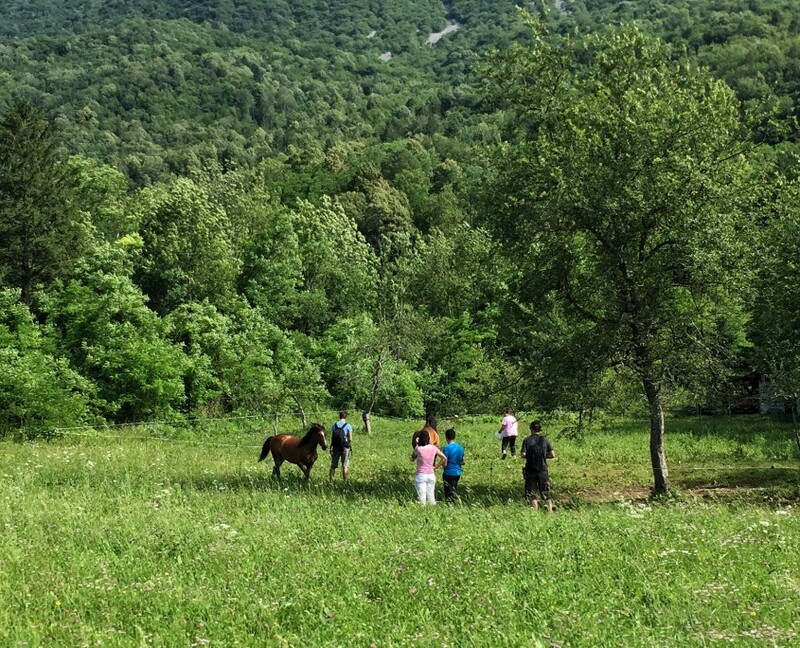 Krma is also known as a mountain pasture but as we have learned latter the cows were only to come next week. 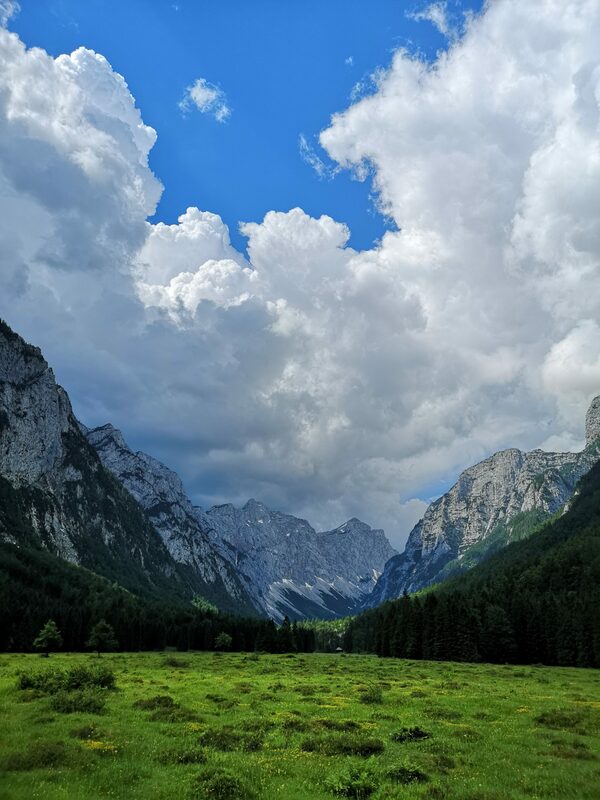 Soon the clouds made some more drama over the peaks but it was still pretty warm outside in the front of Kovinarska koča lodge where we ordered some sweet dumplings for breakfast. 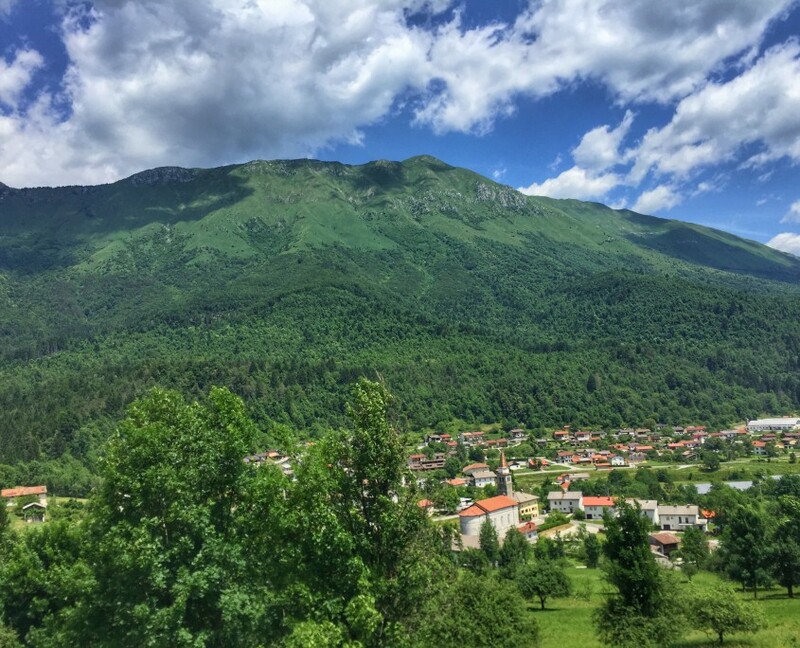 The Krma valley is a great place to have a walk or stay a few days in silence hiking around. It is accessible also in winter. The Krma route to Mt. 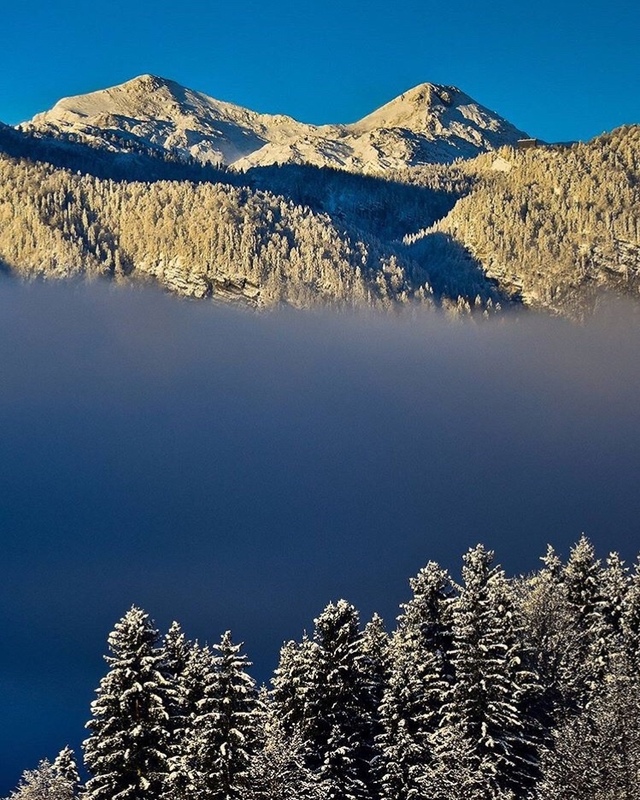 Triglav is the safest one in the winter and offers some great ski touring slopes. 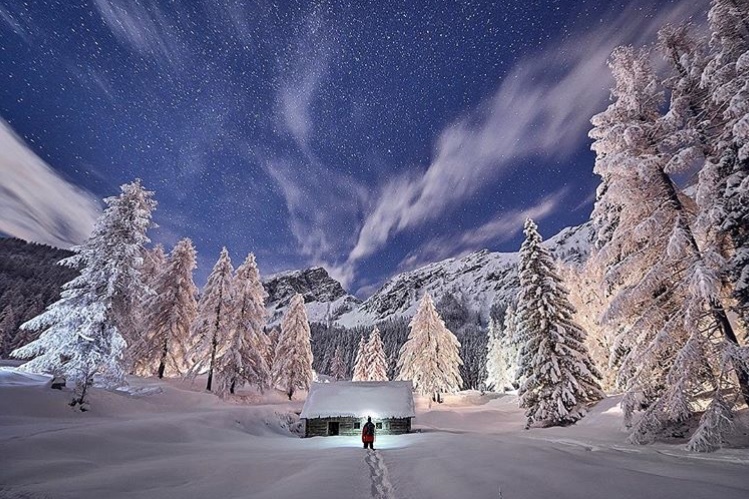 The scenery provides for magnificent photos in all seasons. Posted and photographed by @zokus_gf. 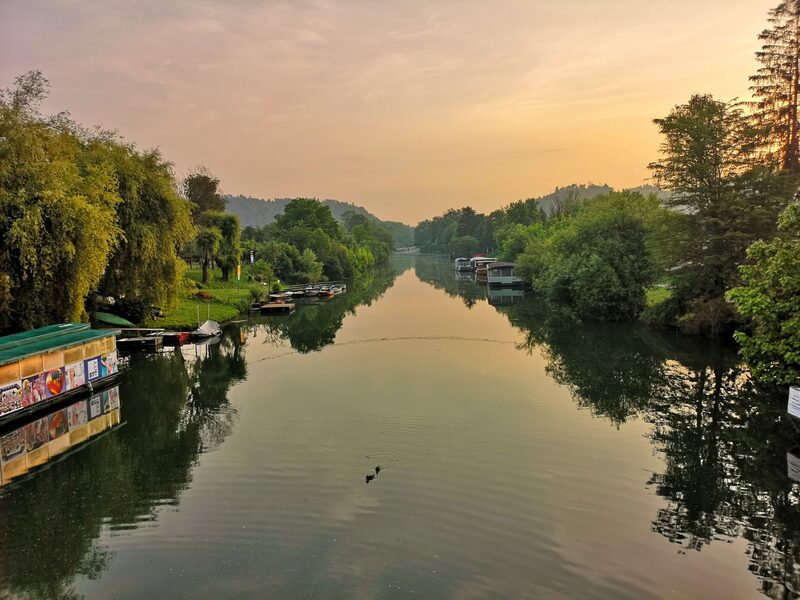 Sometimes the Ljubljanica river is called The River of Seven Names due to its karst nature – on its way towards Ljubljana disappears underground several times and springs again at different places, every time under a different name. 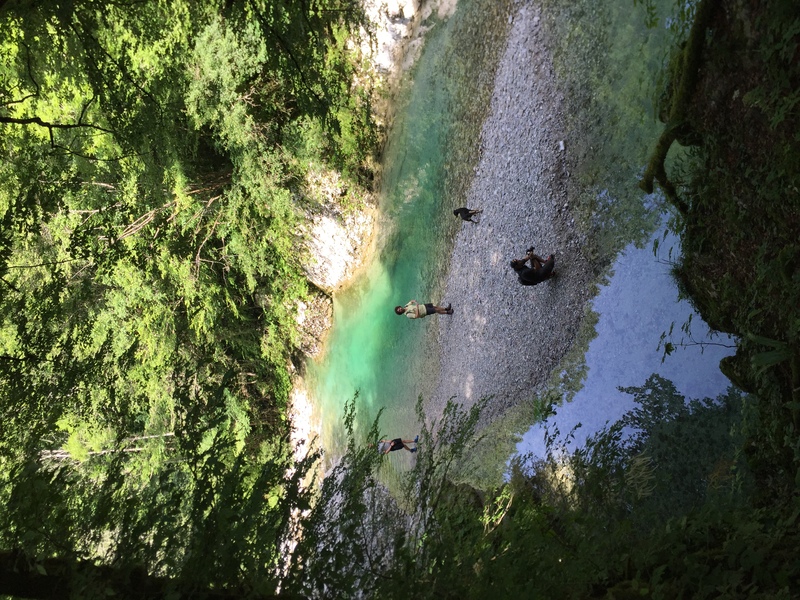 Even as Ljubljanica has a number of different springs. 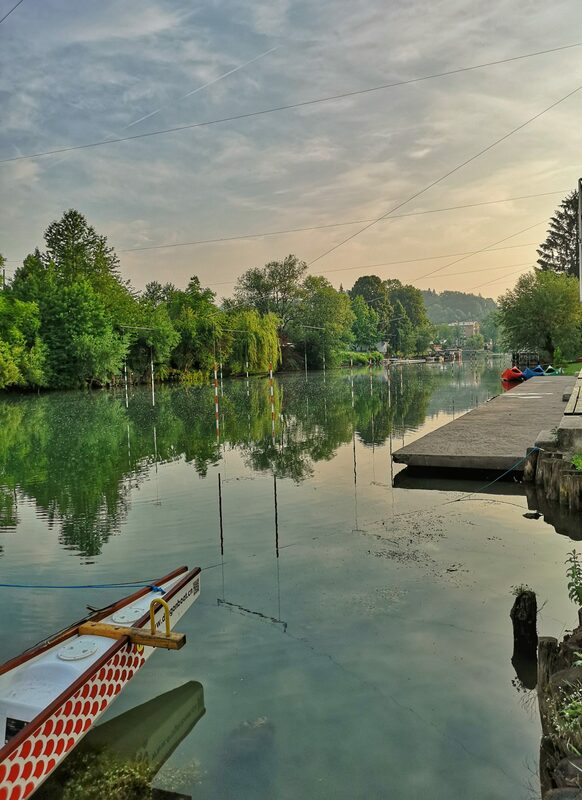 Ten kilometres to the northeast of Ljubljana city centre it empties itself into the Sava river. It is one of the most notable landmarks of the city or even more – it is the foundation of the city itself. Upstream view from Livada but it could be anywhere – from Vrhnika to this spot looks more or less the same. 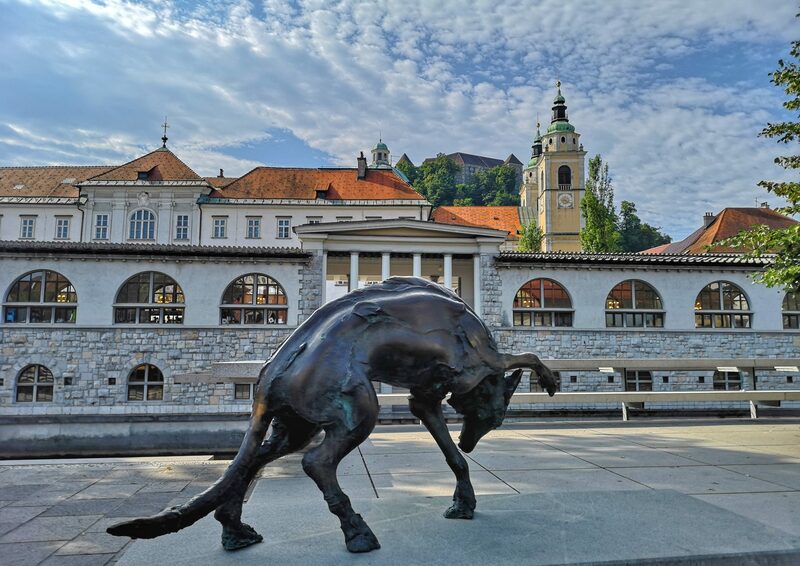 From Roman times to the construction of the railway in the mid-19th century, the Ljubljanica was a major trade and supply route. 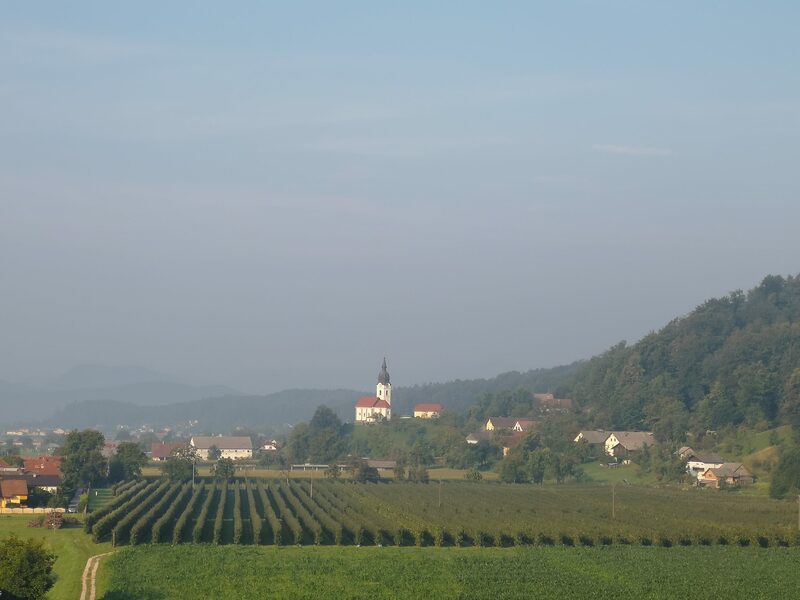 Romans even moved its bed to in order to bring the stones for building purposes from Podpeč at Ljubljana Marshes. 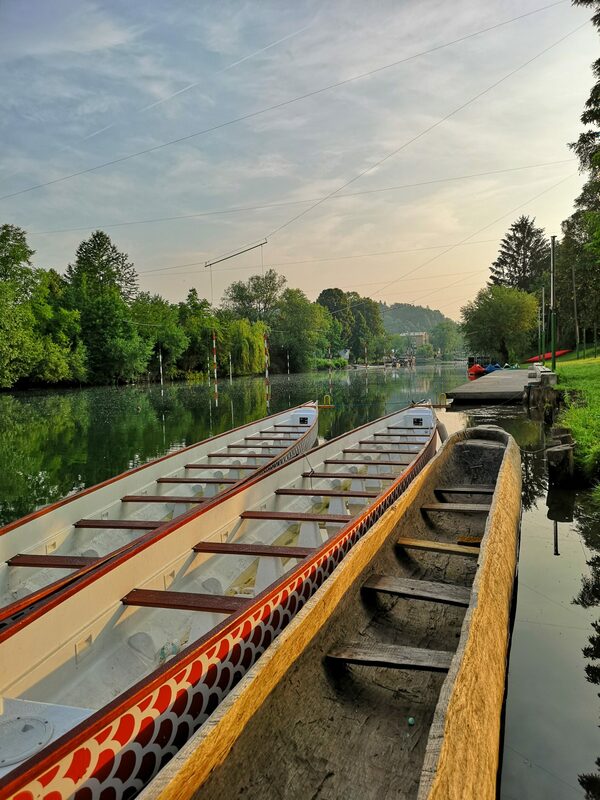 On its way to Ljubljana, the river flows through the unique natural landscape of Ljubljana Marshes and descents only 1 m in its 20 km lenght. 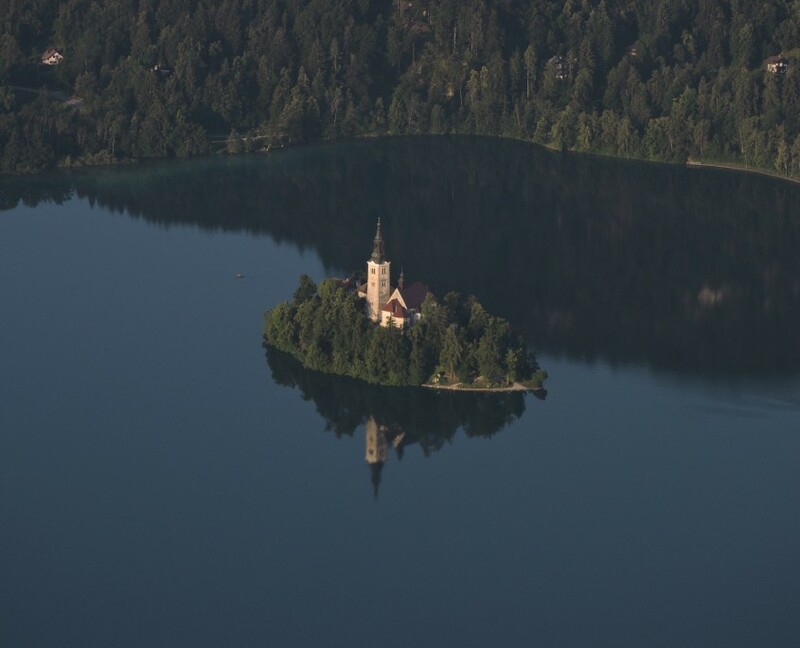 Its bed is one of Slovenia’s most important archaeological sites. Excavations have yielded objects dating from prehistory to the early modern period. Archaeologists believe that the river once had a cult status. In April 2002 archaeologists found the remains of a two-wheeled wooden cart dating 5100 to 5350 years back into the past. It is the oldest wheel found in Europe and elsewhere in the world so far. The wheel is on display at the City Museum of Ljubljana. 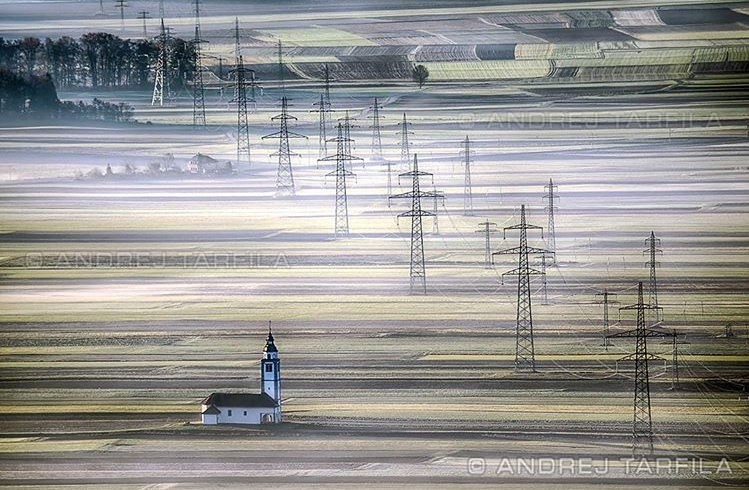 But Ljubljana Marshes is an another story which is to be covered elsewhere. Here we just want to suggest an interesting photo walk along and around the river where it enters the wider city centre. 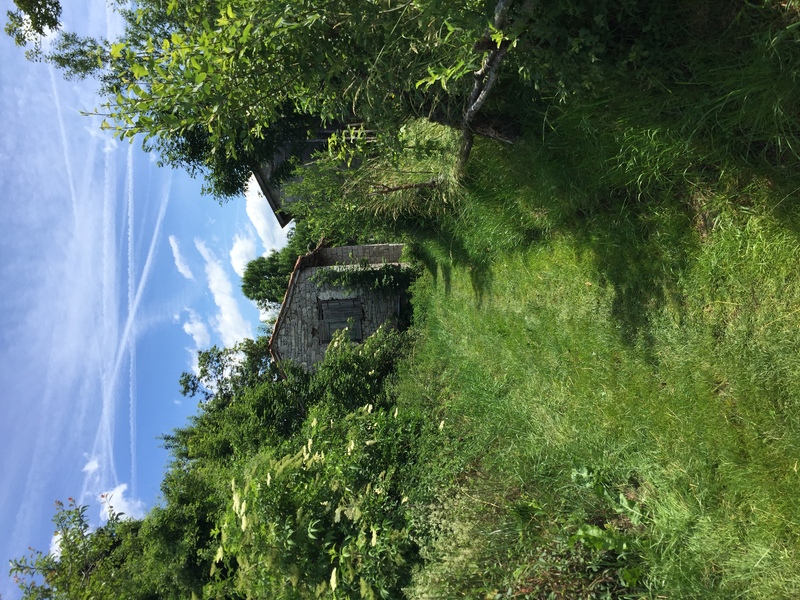 The whole path is just around the corner of the city centre itself yet most of the time it feels like another world. 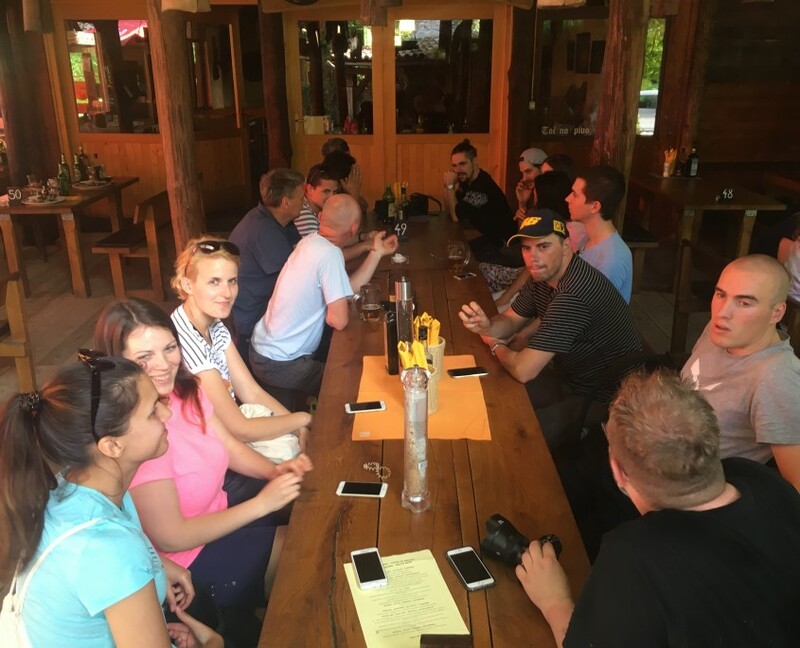 It is possible to start the tour at any end or make a circle – it will take around 90 minutes. We have started at the bridge near the restaurant Livada at sunrise. 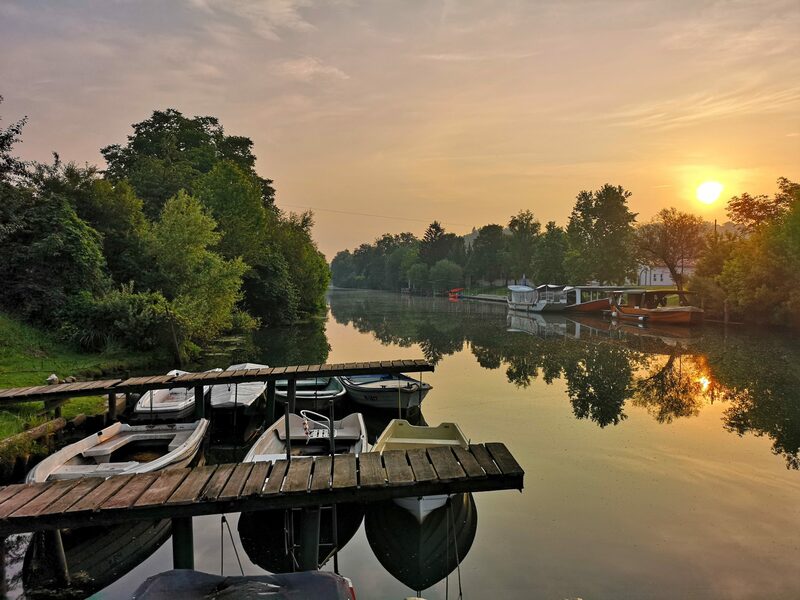 Ljubljanica is beautiful in all conditions but we love the early morning light. Left bank just under the bridge. 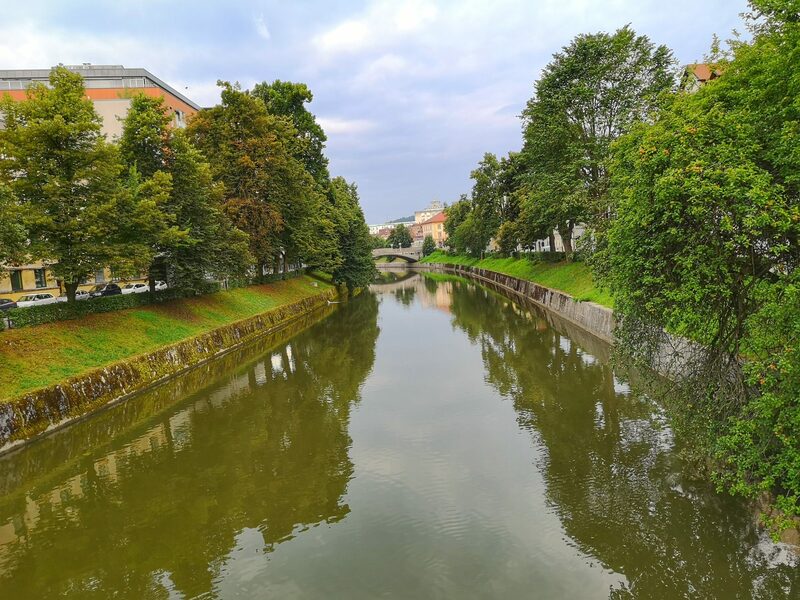 There are some more points where the river can be reached further down the left bank but pretty complicated to find them since one has to go to Opekarska street (Opekarska cesta) and look for the passages between the buildings. Another channel of water coming into the river doesn’t help here. In fact it is not worth the effort at all. 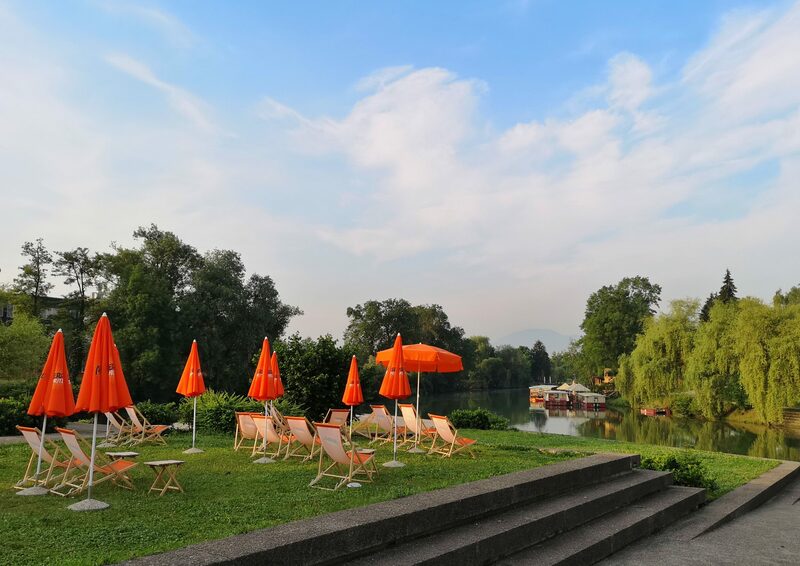 Crossing the bridge and following the right bank bellow the restaurant or starting behind the restaurant at the Kajak Kanu Club Ljubljana would be a much better idea. 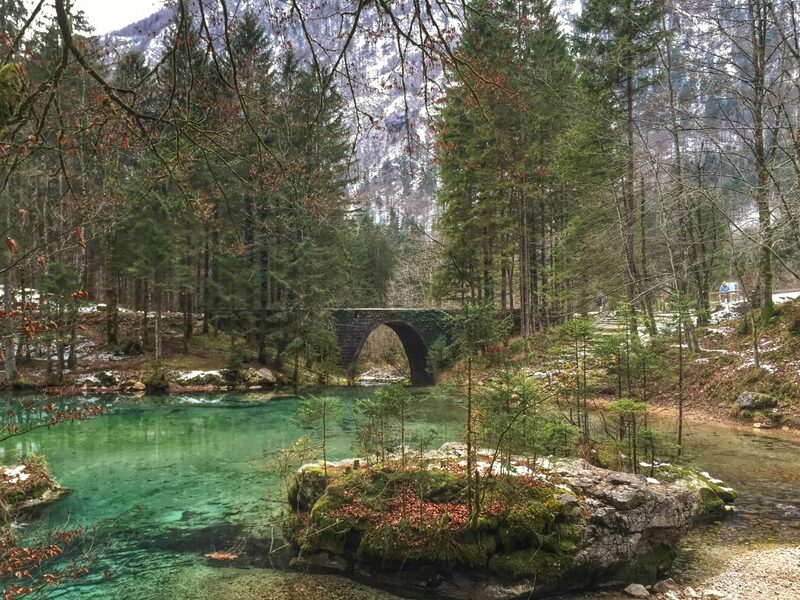 Upstream, downstream, across the river – colourful motives are all around. Even an old school boat was modelling for us! Upstream view was also pretty nice. 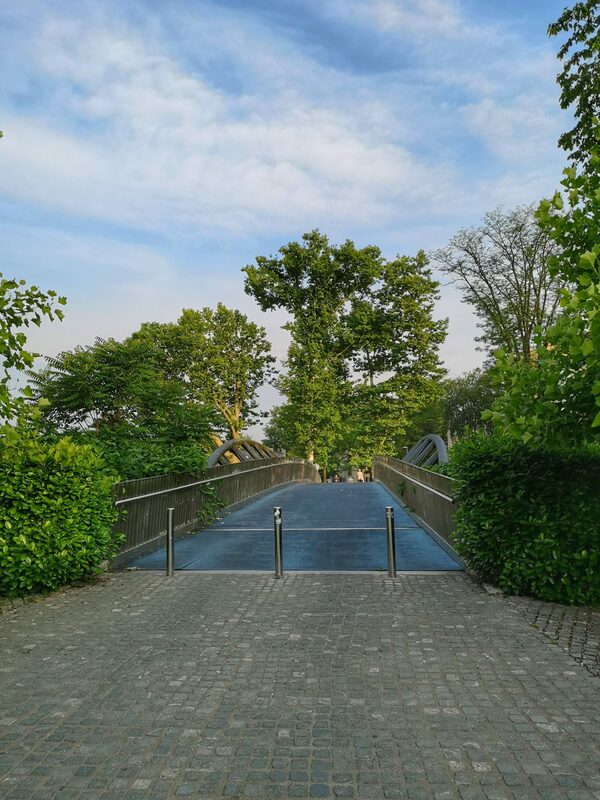 Hladnik’s Footbridge connects the city with a green suburban area and the Ljubljana Botanic Garden, which is just across the street of Ižanska cesta. 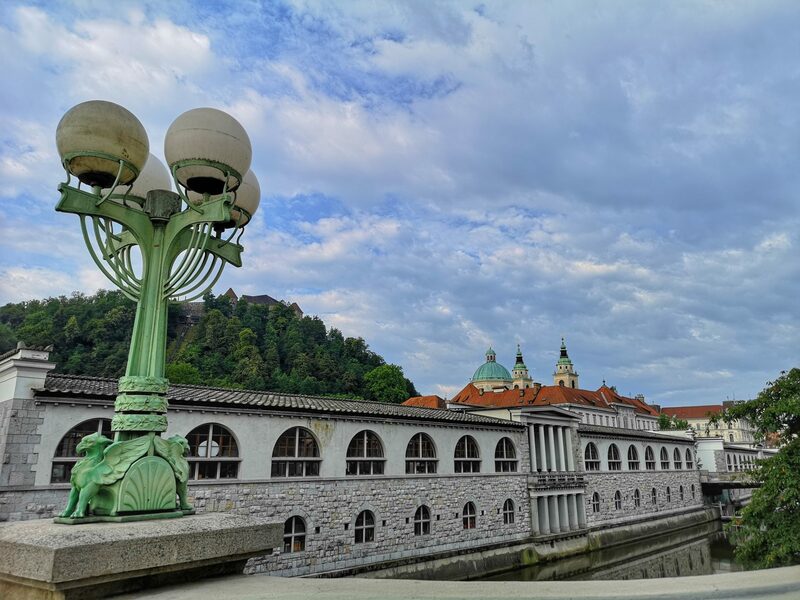 Špica is awaiting on the other side of the bridge, a renovated Ljubljanica river embankment landscaped as a park. Špica used to be a city beach. Now again, due to its green surroundings and a large area paved with wood, it attracts numerous visitors. 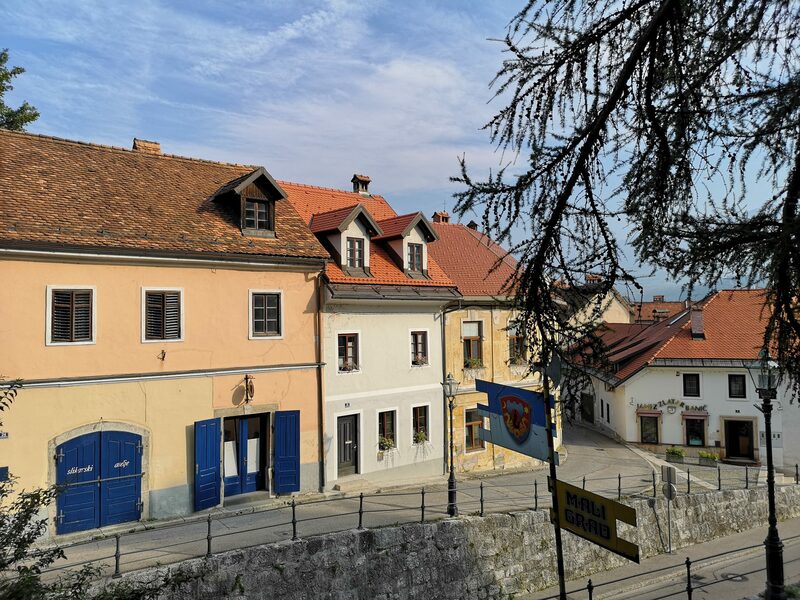 Špica – only a part of the refreshment areas. 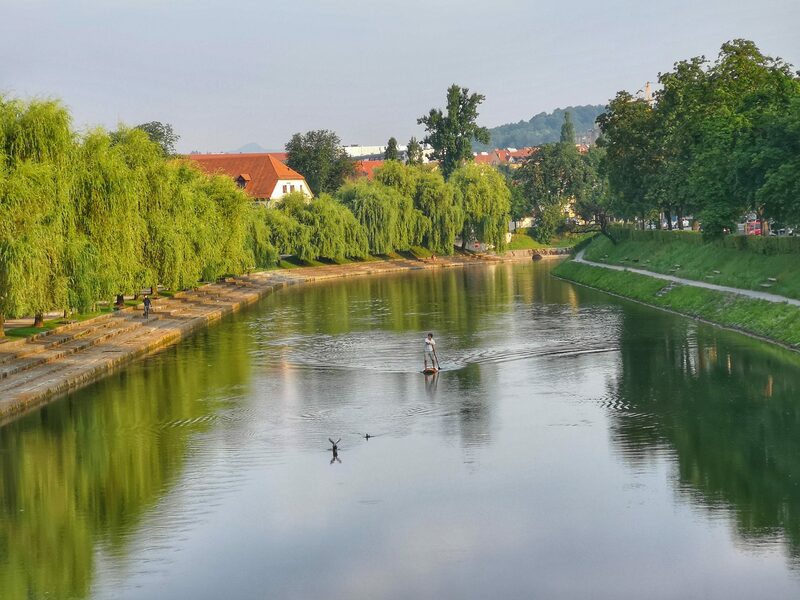 Špica translates as a “pointed tip” due to its shape which splits Ljubljanica in two channels – the left turn flows into the city centre while the right one goes around it. It is called Gruberjev Channel and it was build in order to add more descent thus helping the city with high waters and floods. The bank was recently renovated and new wharfs were added to improve the look and feel of the river. Gruber channel and the wharfs. …but definite. First traffic bridge is only 200 meters away and from it the distinctive appearance which the river owes to the architect Jože Plečnik, who designed the old city centre’s river embankments, landscaped tree-lined riverside walks, including the well known weeping willow-lined terraced walk alongside the Trnovski pristan embankment. 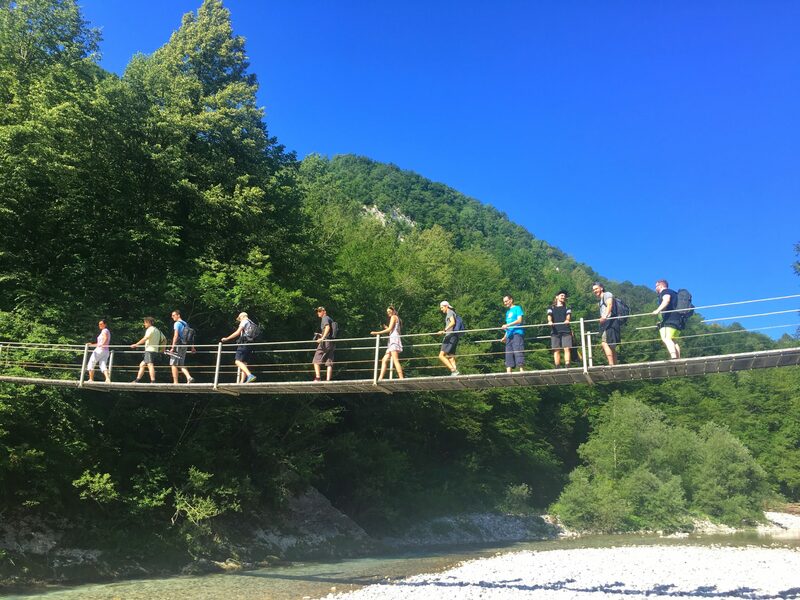 Crossing the bridge you can continue along Opekarska Street and turn left at the traffic lights to reach the starting point at Livada or turn right to enjoy the willow-lined walk to Trnovski Pristan. The walk along the river through the city centre is described in another post. 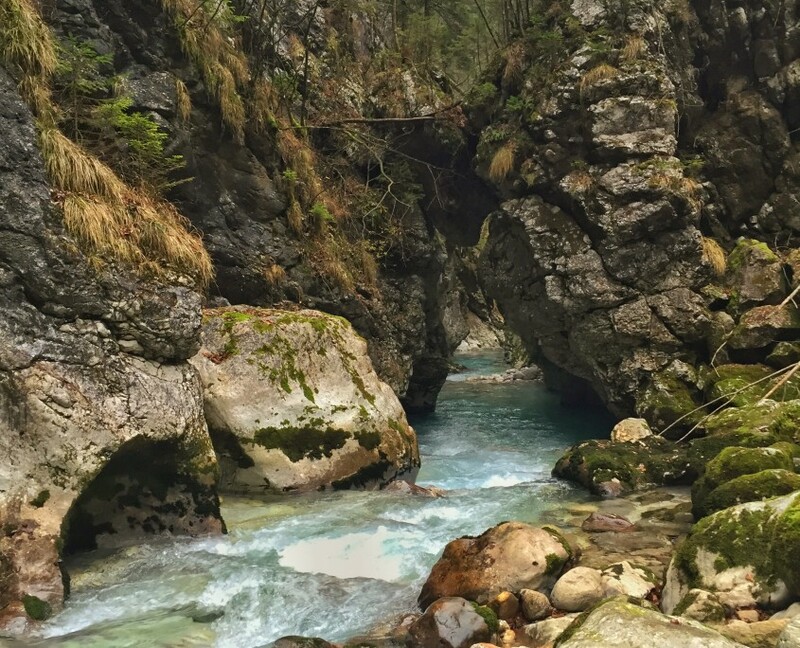 Looking upstream from Trnovski Pristan – it is beautiful in any weather! 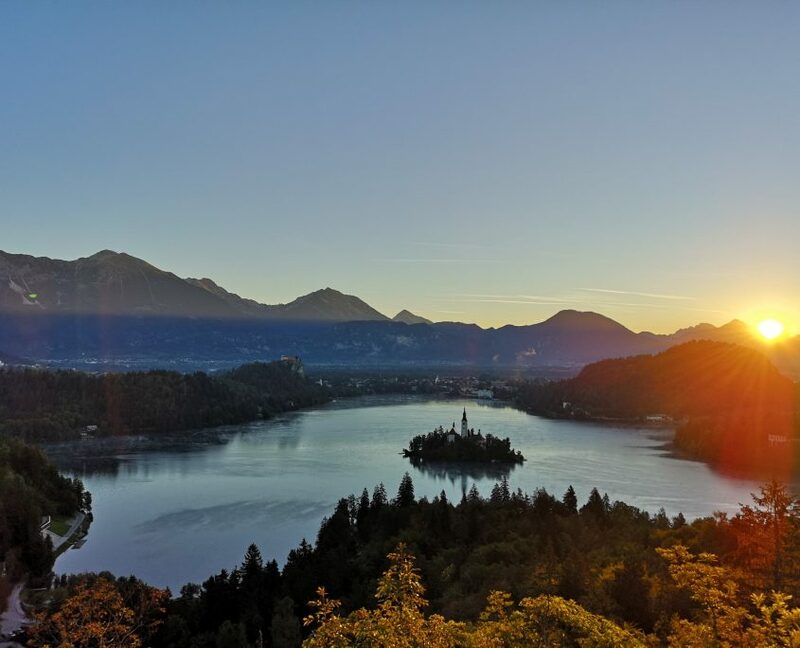 All photos are made with HuaweiP20Pro in cooperation with Huawei Slovenija. 500.000. Pol milijona. V petih letih in pol je to skoraj 2.000 na teden. 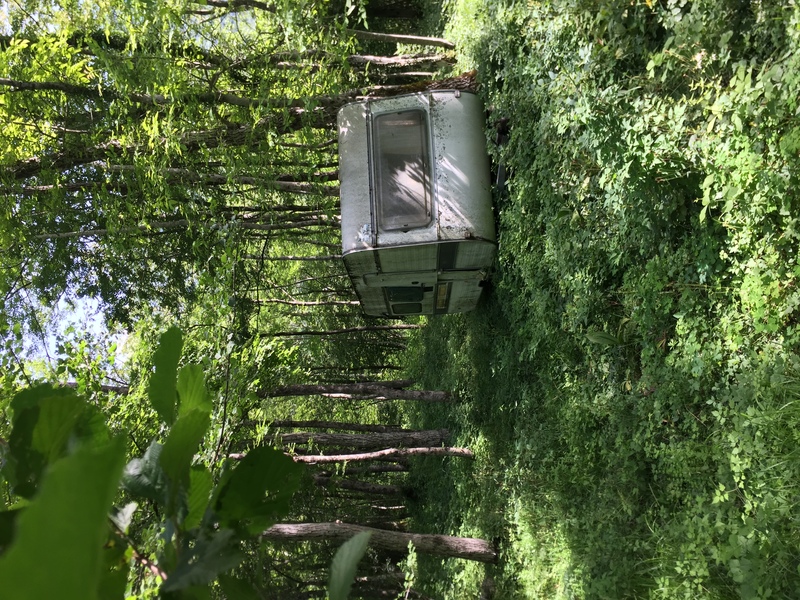 A povprečja lažejo. Na začetku jih je bilo veliko manj. 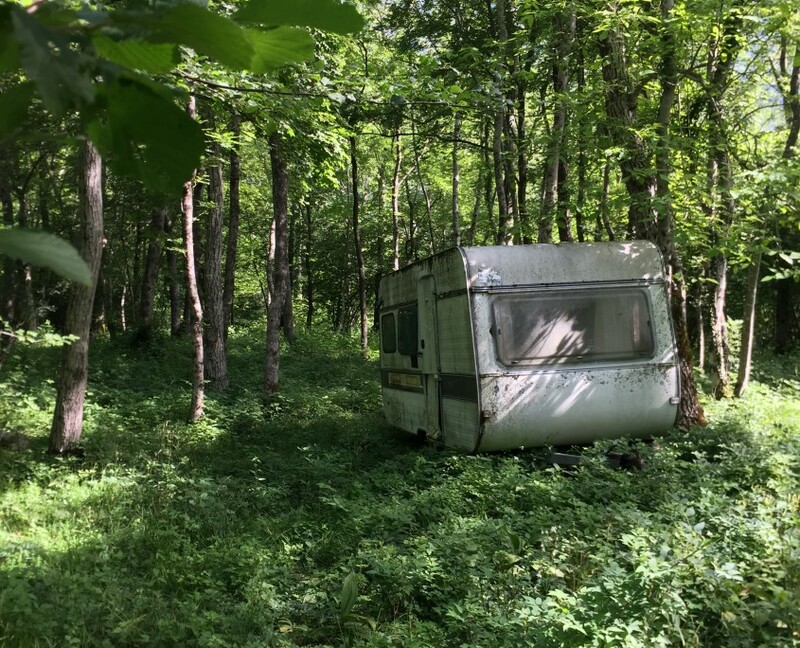 Torej jih mora biti zdaj na teden veliko več. Ne štejeva. A tu in tam se spodobi, da jih preštejeva, da sva vesela in da to tudi naglas poveva. 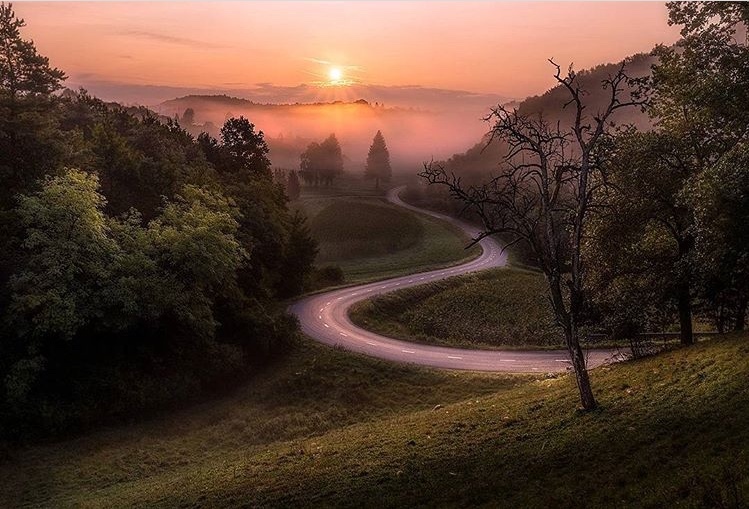 500.000 fotografij so uporabniki Instagrama označili z #igslovenia. 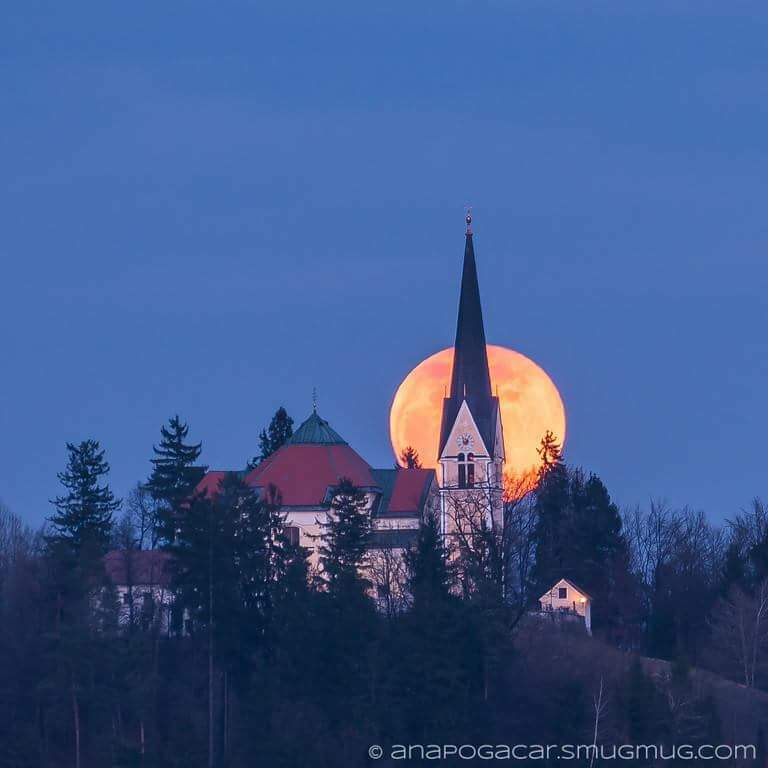 Tujci, Slovenci. Na začetku, pred petimi leti in pol, ni bilo nobene. 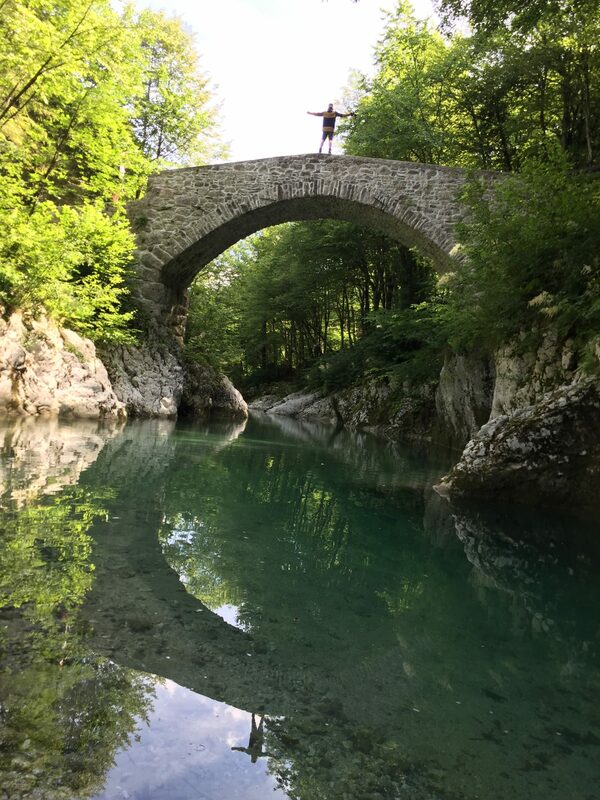 Sanja si je izmislila to značko, ker na profilu nisva želela deliti fotografij, za katere ne bi imela izrecnega dovoljenja za delitev. 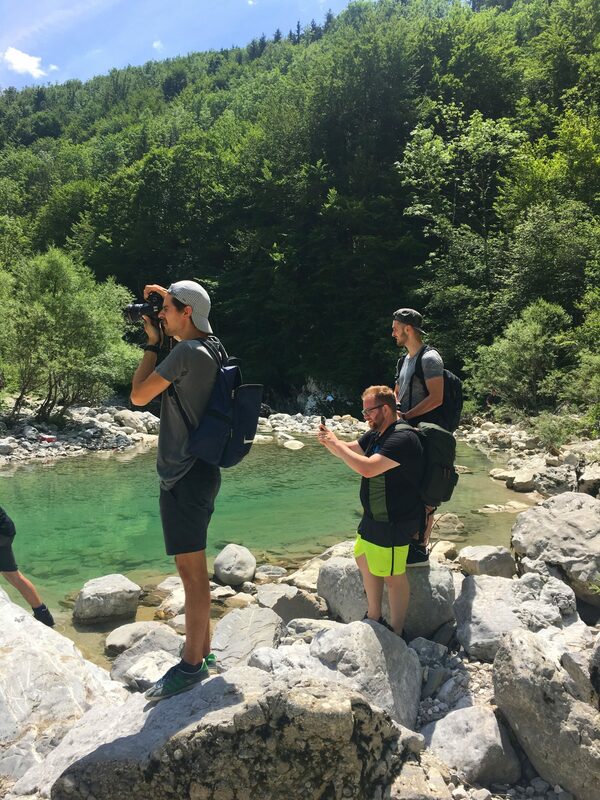 Na Instagramu se nekako smatra, da uporaba določene značke, ki ni generična, kot je npr. 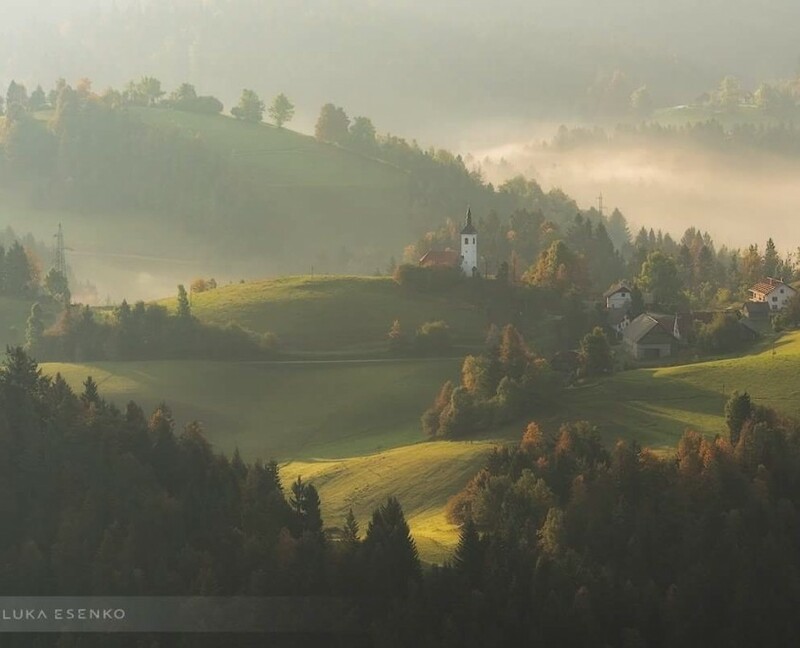 #slovenia, pomeni tudi dovoljenje za ponovno objavo. Hkrati je tudi dodaten prepoznavni znak profila, če obstaja ta povezava. 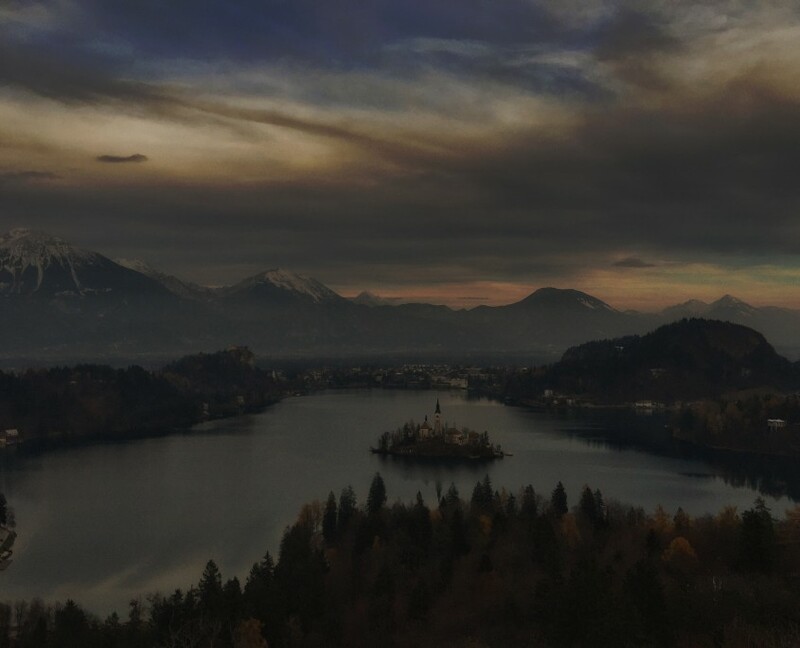 #slovenia, torej najbolj generična značka, ima 2.240.000 fotografij. 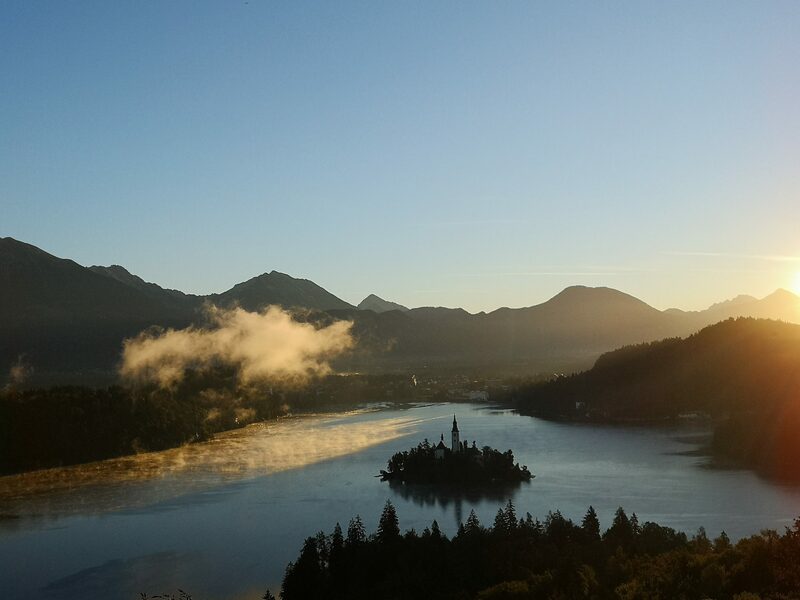 #slovenija 318.000. 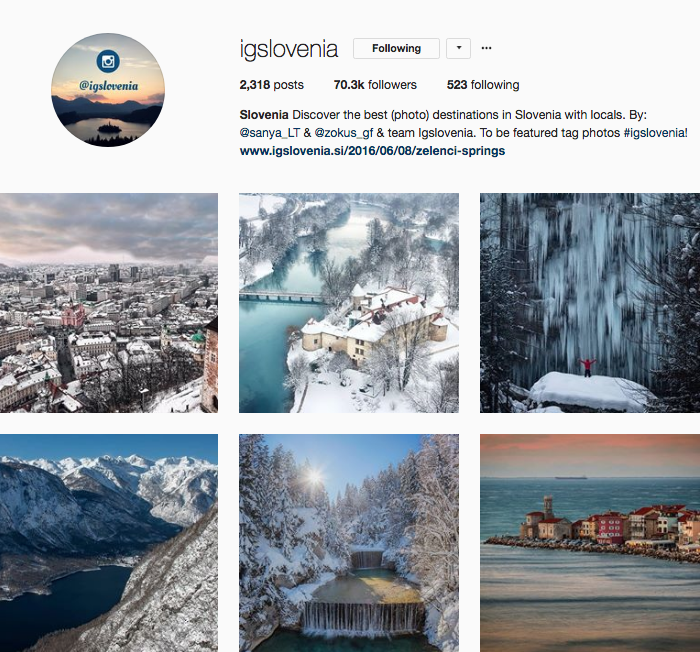 #ig_slovenia, ki je verjetno nastala kot napaka, se je kar dobro prijela s 34.000 fotografijami. #ifeelslovenia, uradna značka z vso promocijsko mašinerijo, ki stoji za njo, jih ima 210.000. #itsculturetime, ki ga promovira v svojem profilu, 61. Ni napaka. Je pa dokaz, da ni preprosto spromovirati nove značke. 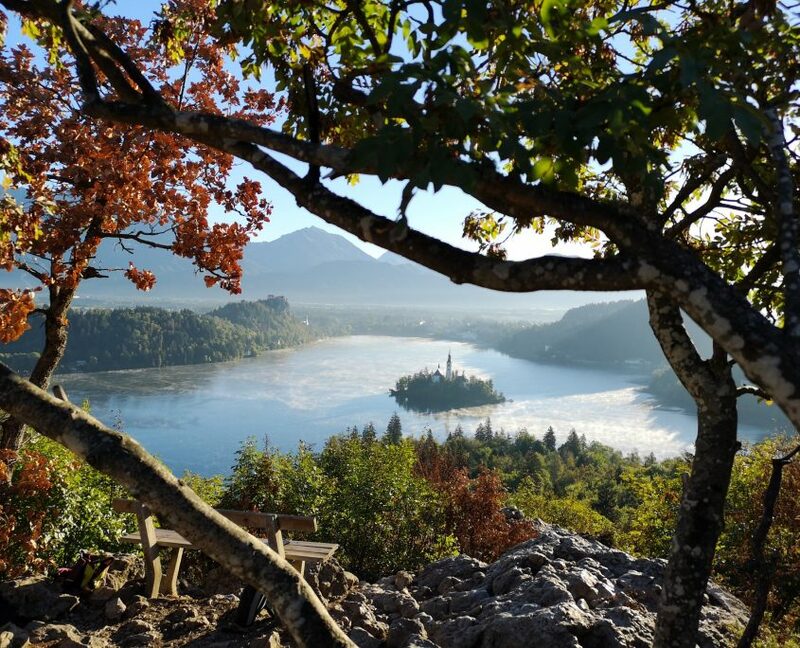 Na Instameetih v Sloveniji in na Hrvaškem, kjer vedno uporabljamo posebno značko za vsak dogodek, jih redko dobimo več kot 100. 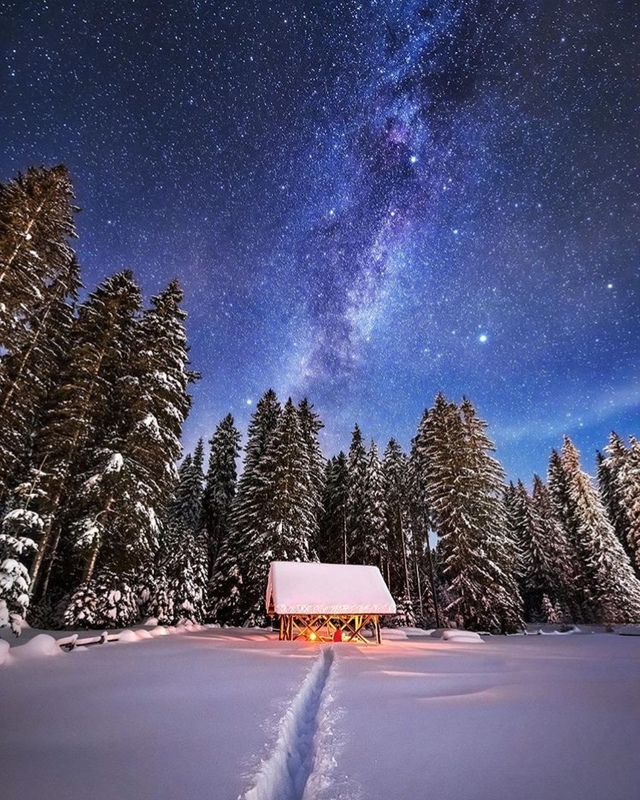 Več kot očitno nama je uspelo, tudi 70.000 sledilcev, ki jih je @igslovenia dosegla nekako v istem tednu, to dokazuje. 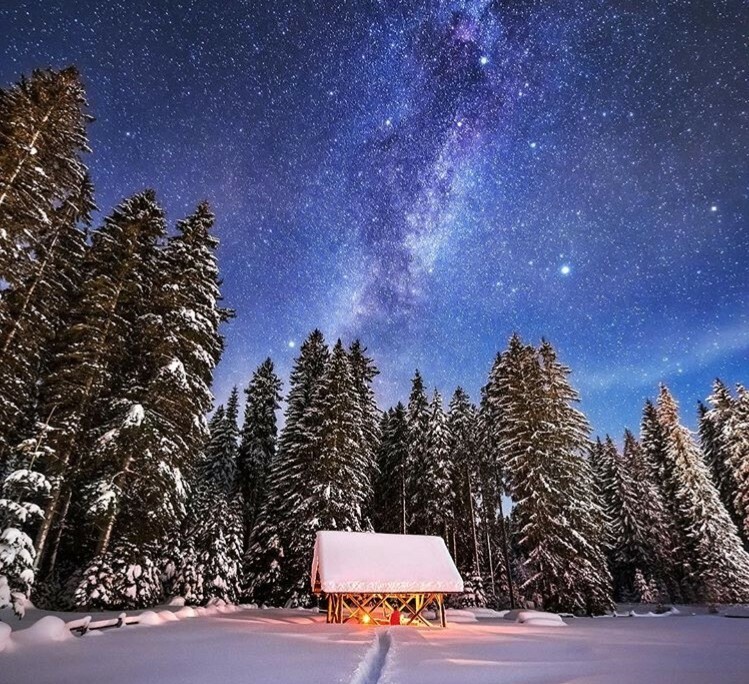 Decembra 2014 je imel Instagram 300 milijonov uporabnikov, danes jih ima 900 milijonov. 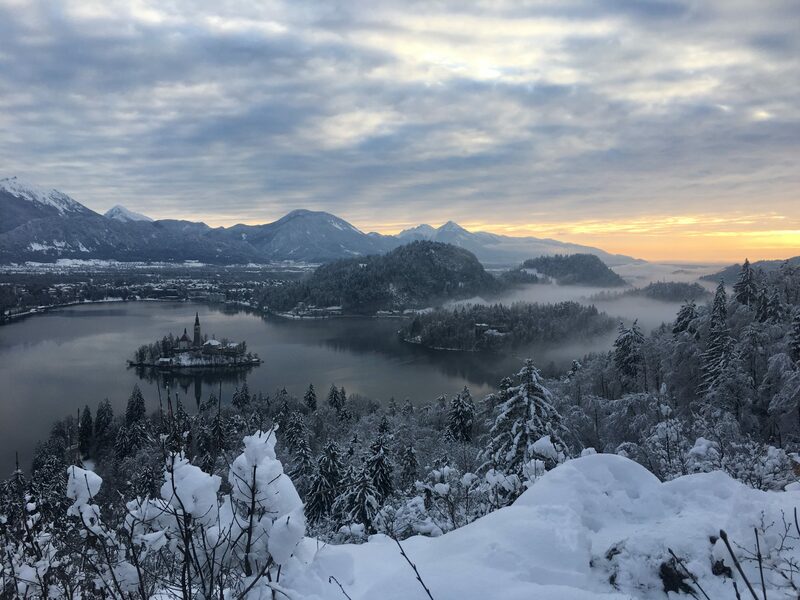 V tem času je število sledilcev @gslovenia zraslo za skoraj 9x! Še vedno je več kot polovica sledilcev iz tujine. 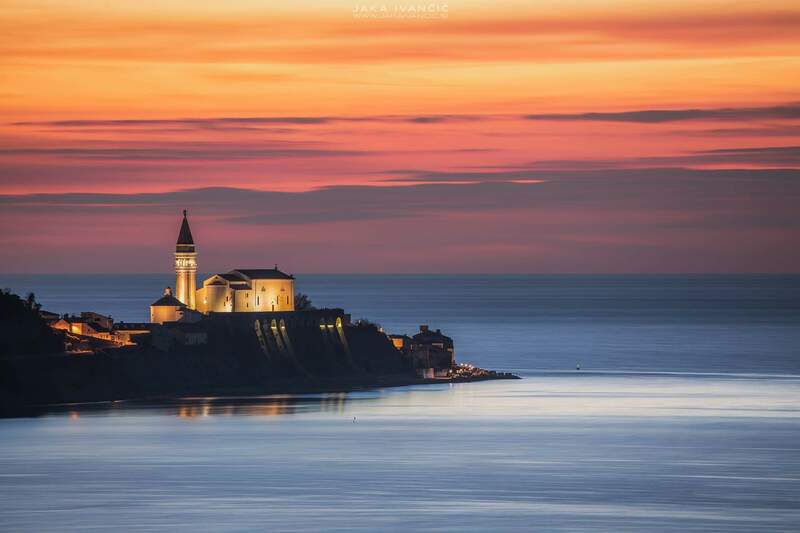 Najboljše objave imajo več kot 50.000 dosega in več kot 70.000 prikazov. Popularnost Slovenije kot turistične destinacije je v zadnjih letih skokovito naraščala. 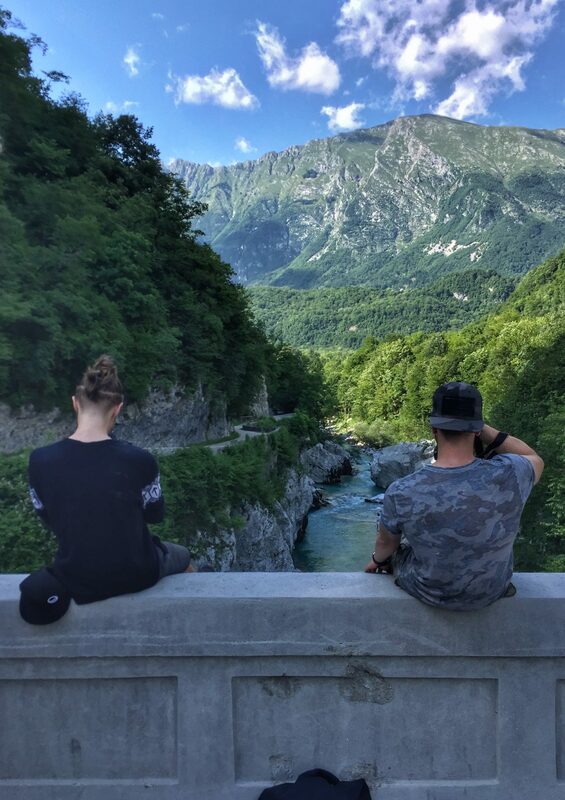 V istem obdobju je naraščala popularnost družbenih medijev, predvsem Instagrama, in njihova/njegova vloga v promociji destinacij. 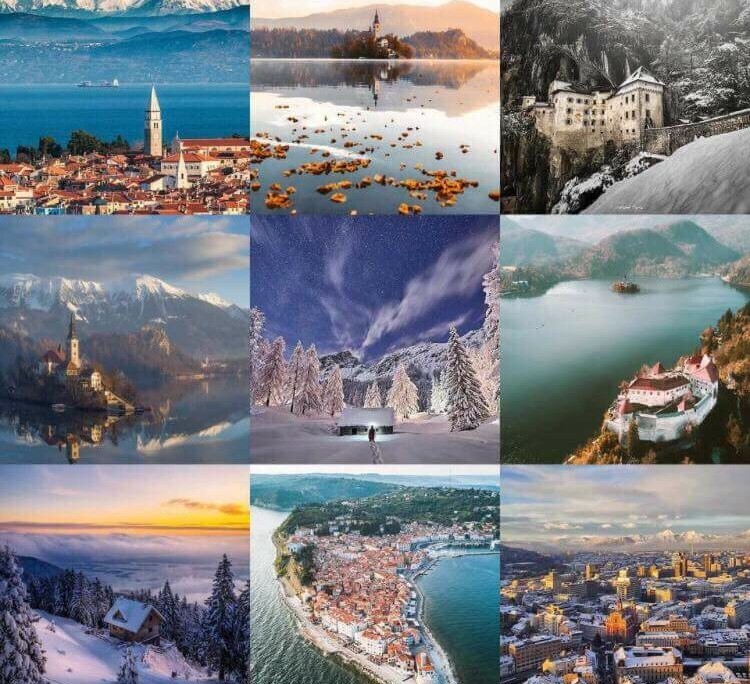 To je bil najin skromen prispevek k promociji Slovenije (in Instagrama v Sloveniji) – 500.000 x #igslovenia. We mostly visit it when somebody visits us. 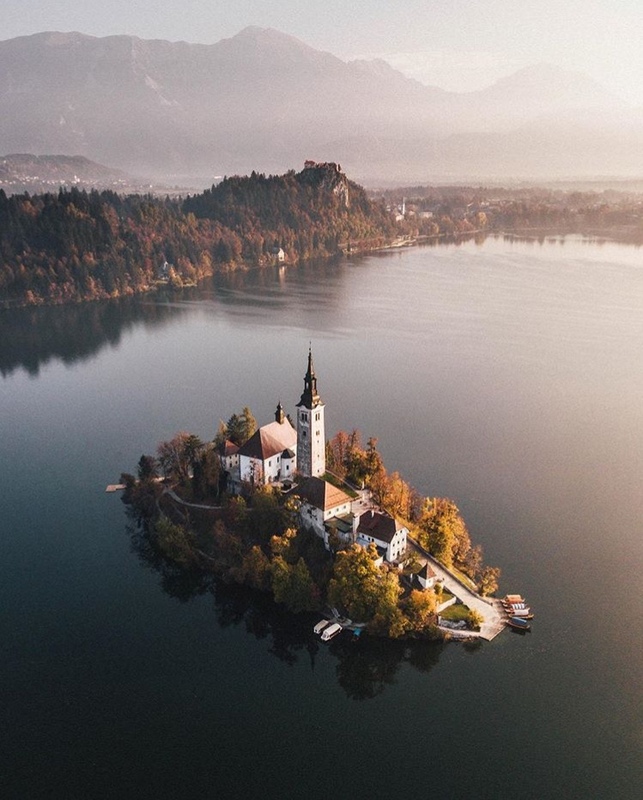 Friends, family and also Instagrammers coming to Slovenia usually don’t mind the fact there is almost no parking space and if you find one you will pay for it too much. 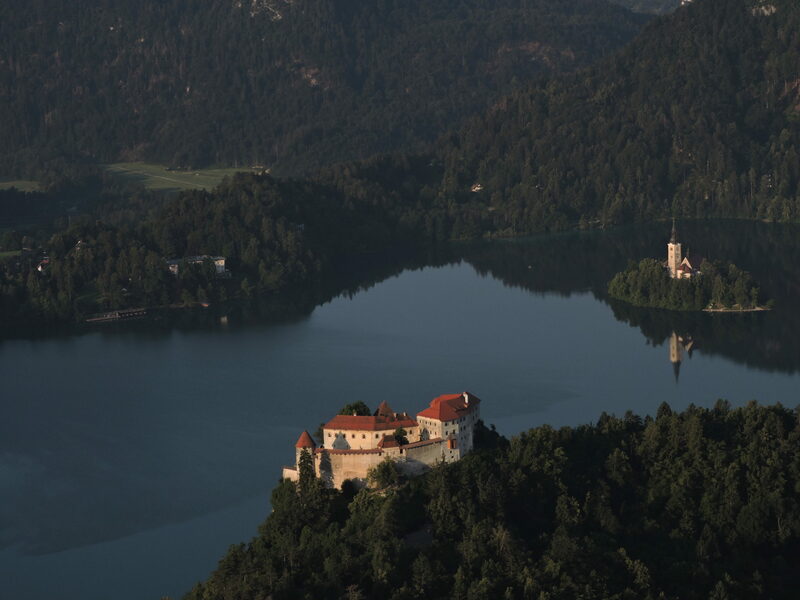 They also don’t mind the rude waiter serving the famous ‘kremšnita’ (Bled cream cake) near the lake the annoying fact that you can’t enjoy the amazing view of the lake from the castle without paying the entrance fee. Not anymore. 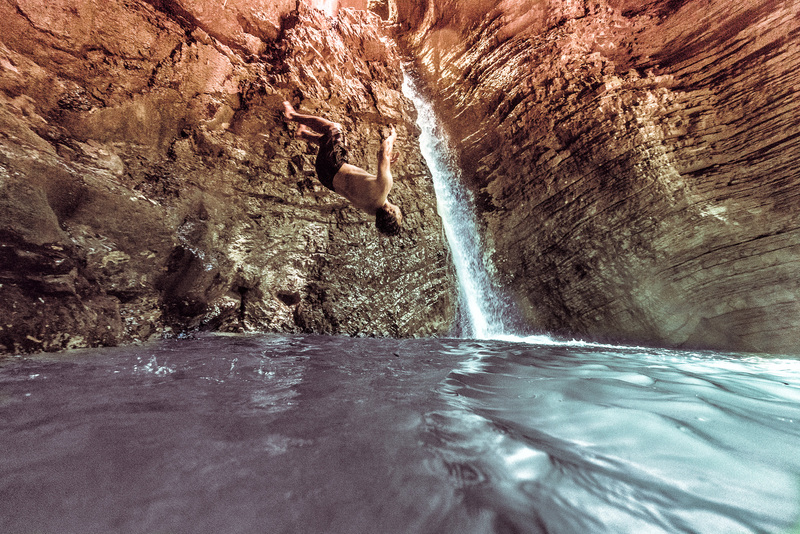 If a place is so beautiful anything goes. 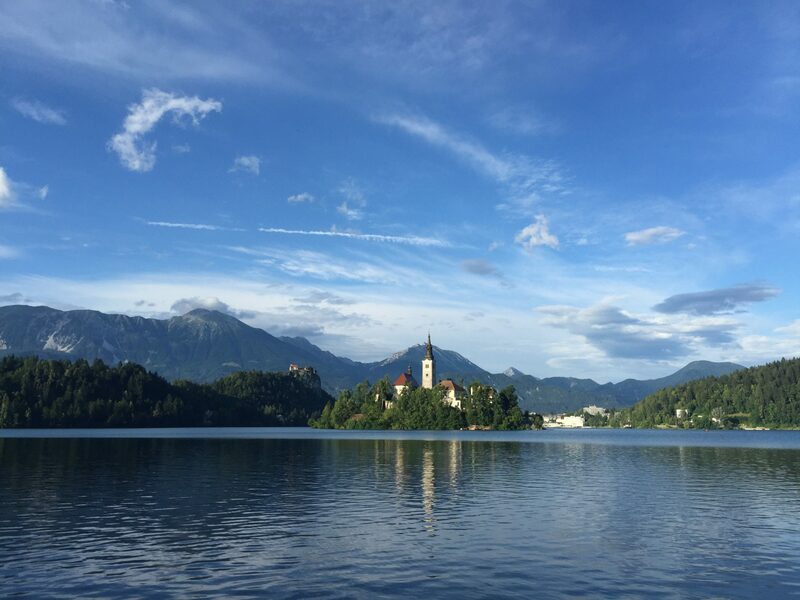 That is the feeling I have about Lake Bled but still … it is an amazingly beautiful place and it is worth visiting it. 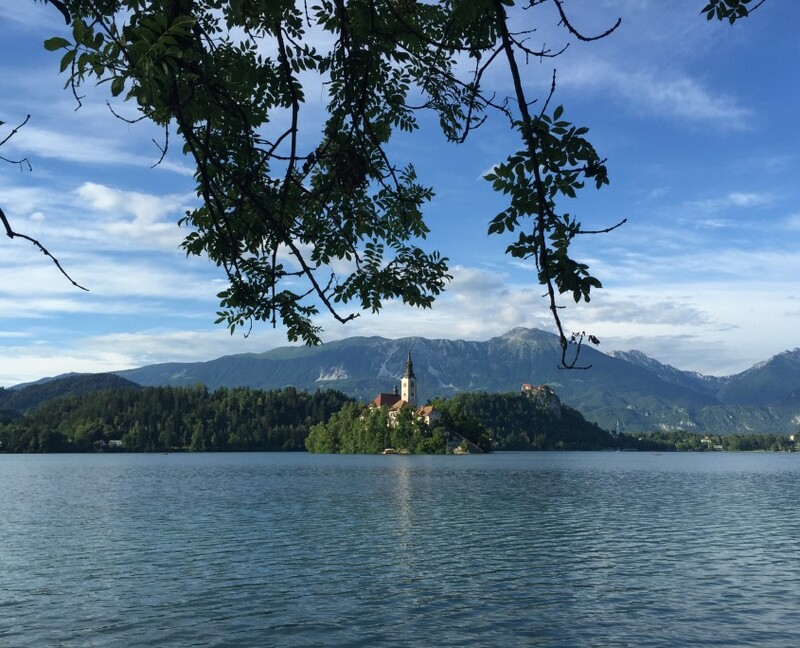 Find a parking space (the prices go as high as 10 euros so – be picky), leave your car in the city and go down by the lake. 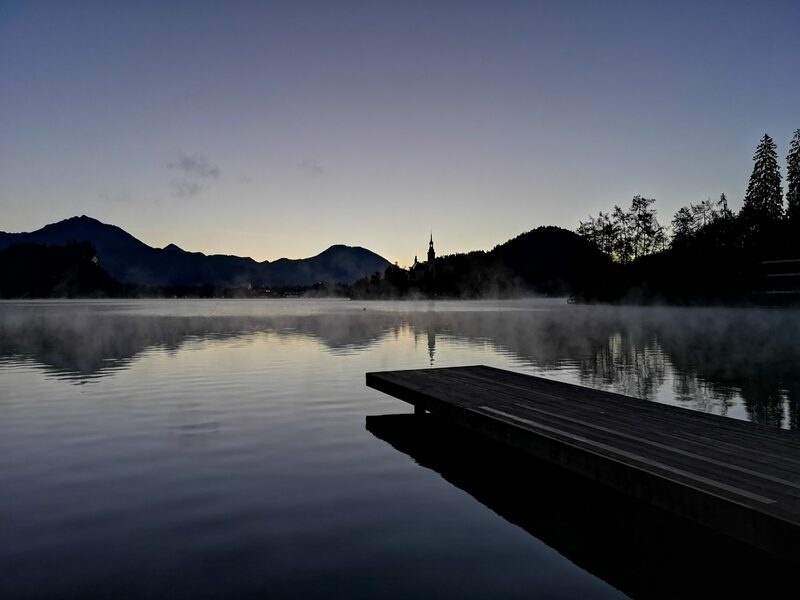 Take a walk around the lake. 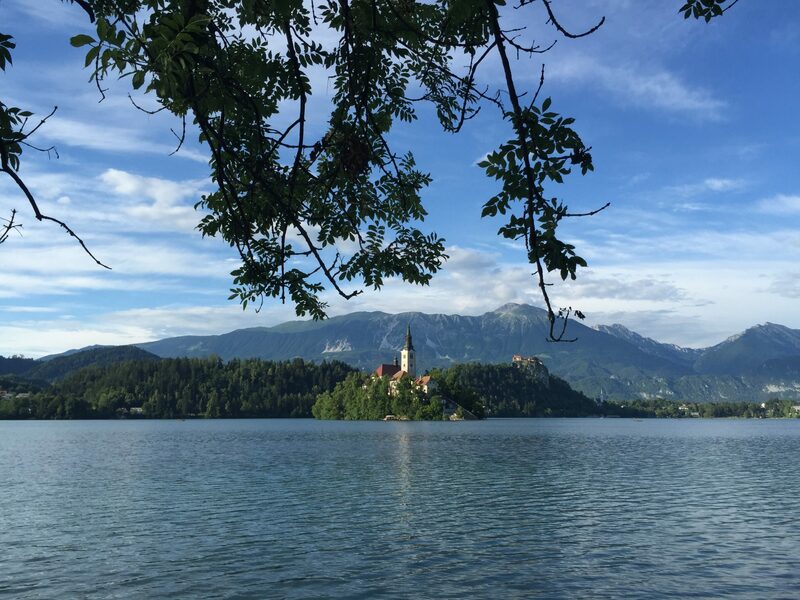 There is a path around it, approximately 6 kilometres long so it will take you less than 2 hours to see the lake in all its beauty. Depending on the sun & the light you will for sure find it easy to snap – to many photos. 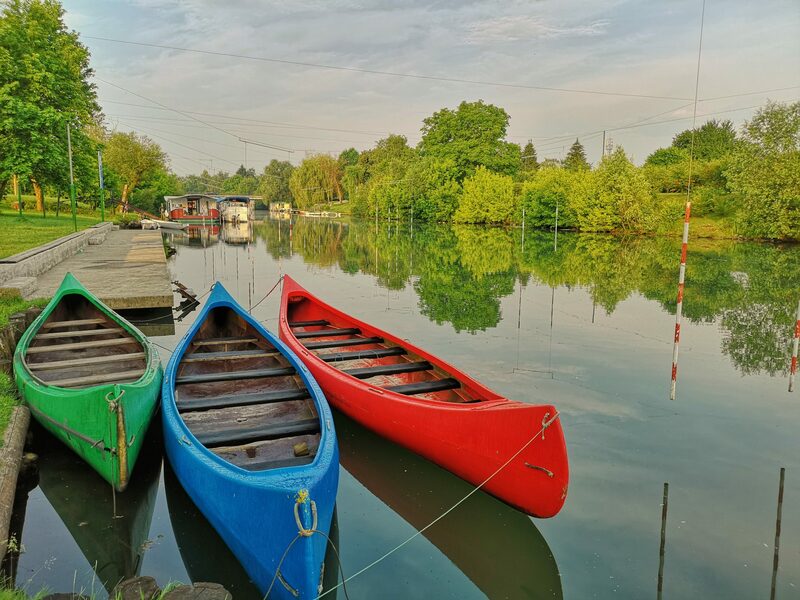 There will be some piers, trees, swans, beautiful houses and boats on your way so we are quite sure you will enjoy your walk. I recommend you to do it in the early morning. Sunrises are as amazing as sunsets but most of the people like to sleep in the morning. 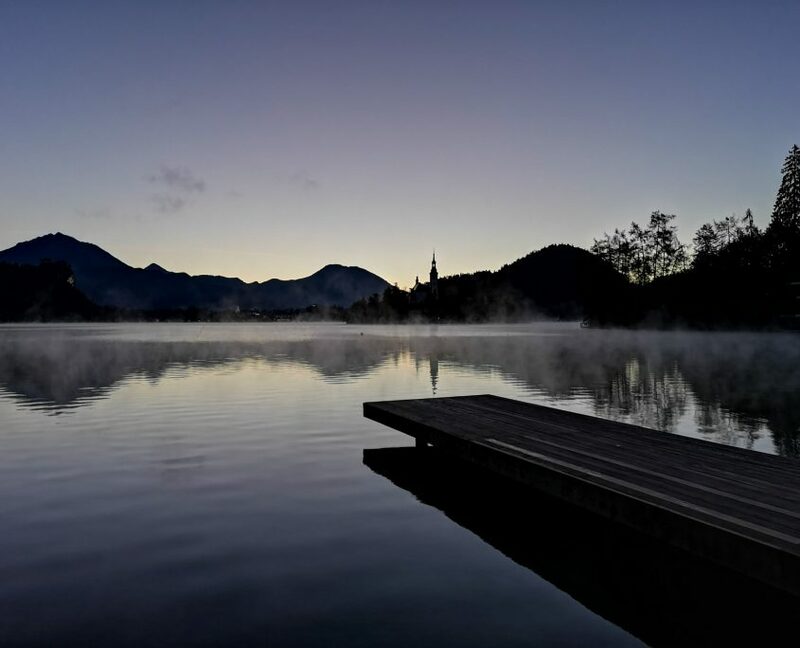 You will not be alone but there but there will be less people around the lake and (if you are visiting in the summer) in the lake. If you have more time, you just have to rent a boat or take one of the tourist boats going to the island. 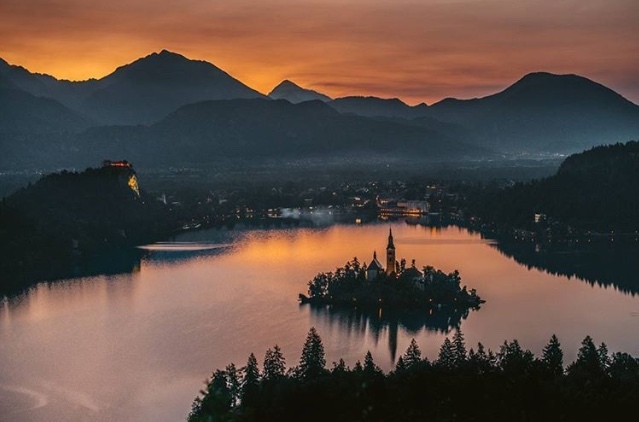 I recommend you a boat of your own so you can really take some amazing photos from the lake and get to the best spots to photograph the famous island and its church. 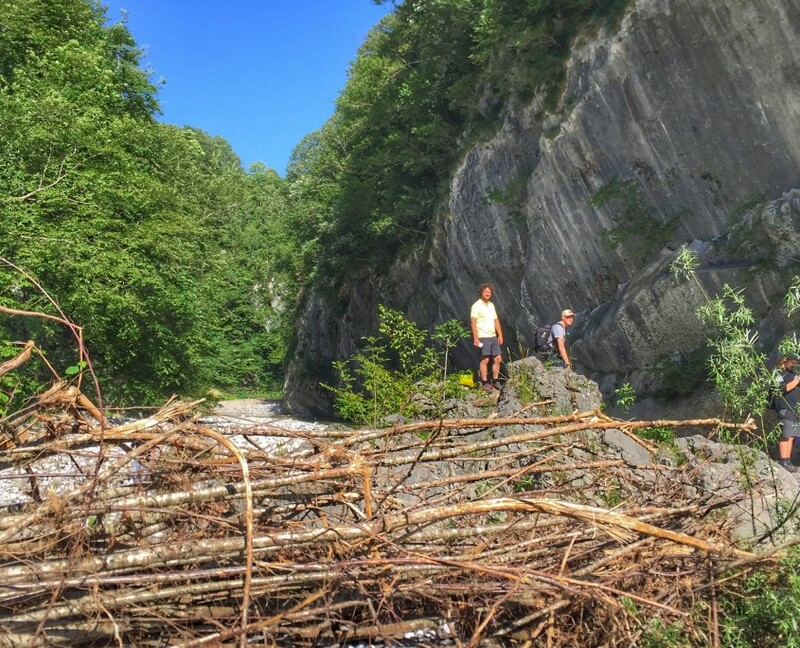 For the ones that want something extra, a climb to the nearby hills is a must! Only from there you can really see the whole lake and take the best photos. But – don’t be surprised to meet some people also high up there. 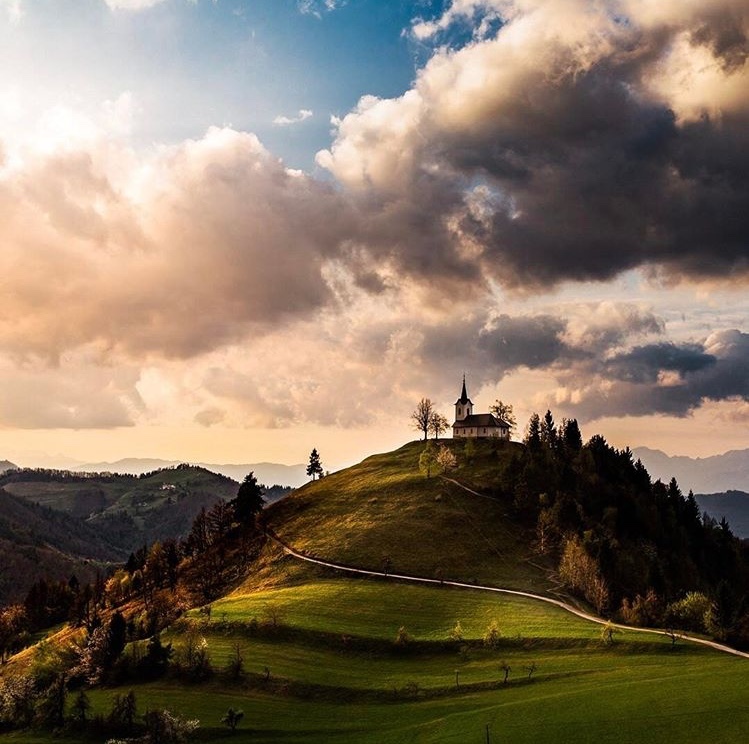 The easiest way to get best photos is to climb the Ojstrica or Osojnica hill, but there are some other, too. Check the list here! 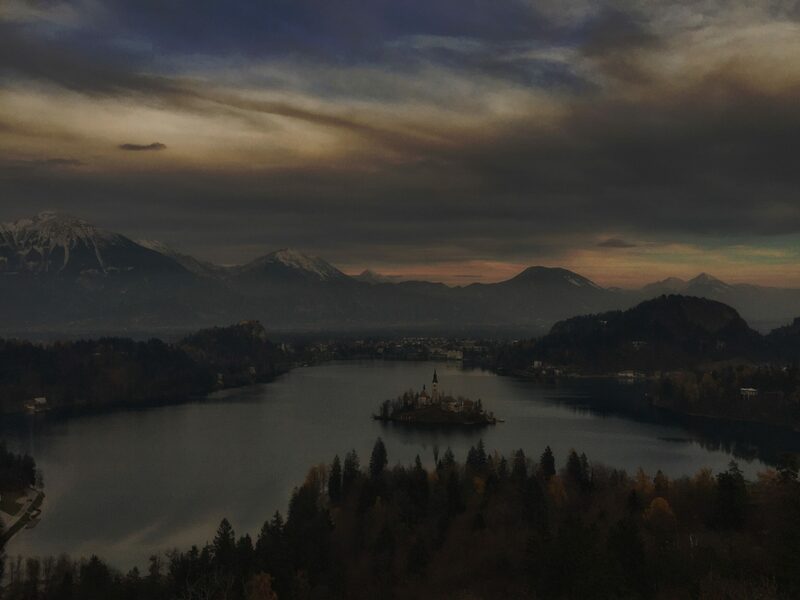 If you ask me, the ultimate way to photographing Lake Bled is from a hot air balloon:) I did it just once and I would do it again. Many times. 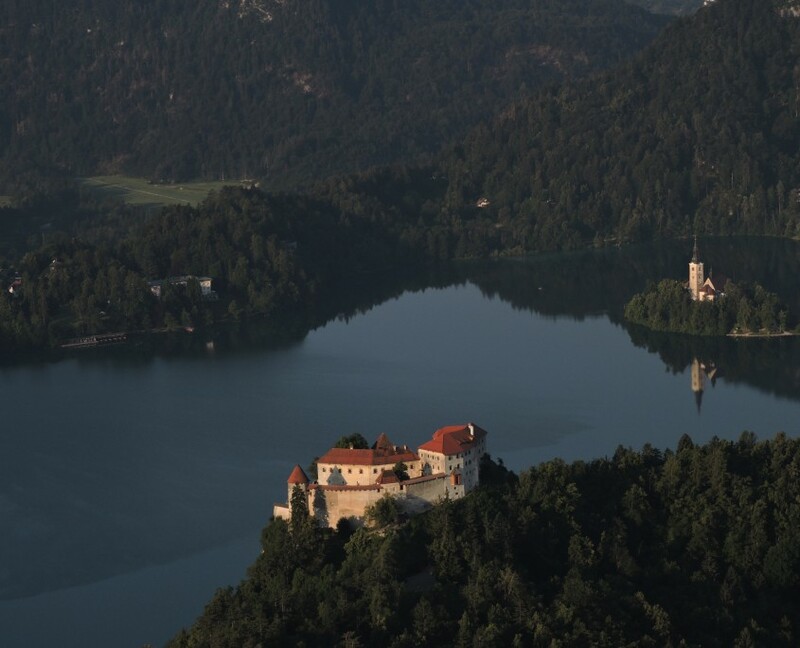 Balloon offers you simply the best views of the lake, castle, island, surrounding hills … everything there is to see and from a completely different perspective. Another great year behind us! 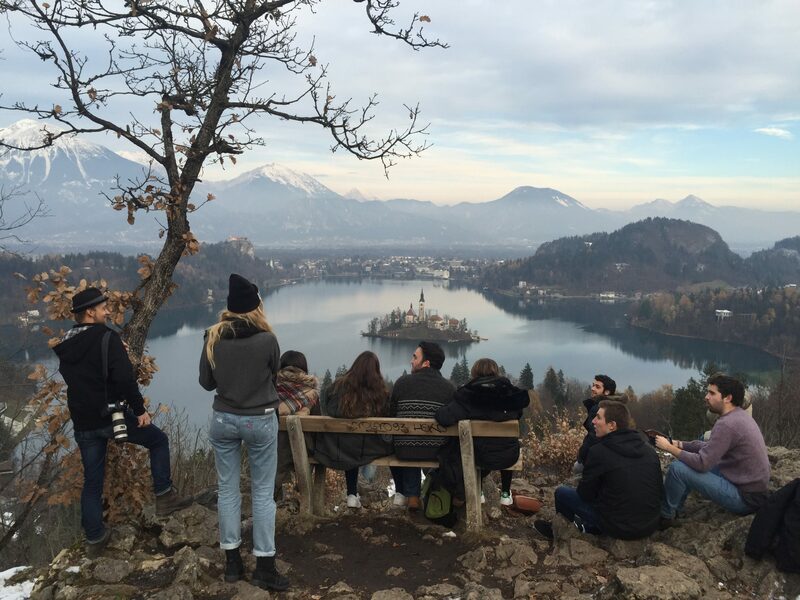 A number of workshops and lectures with companies and tourist organisations, a big joint venture campaign with Visit Ljubljana to promote Central Slovenia, two Instameets we have organised at home and two we joined in Croatia, next one already in January at Plitvice Lakes! 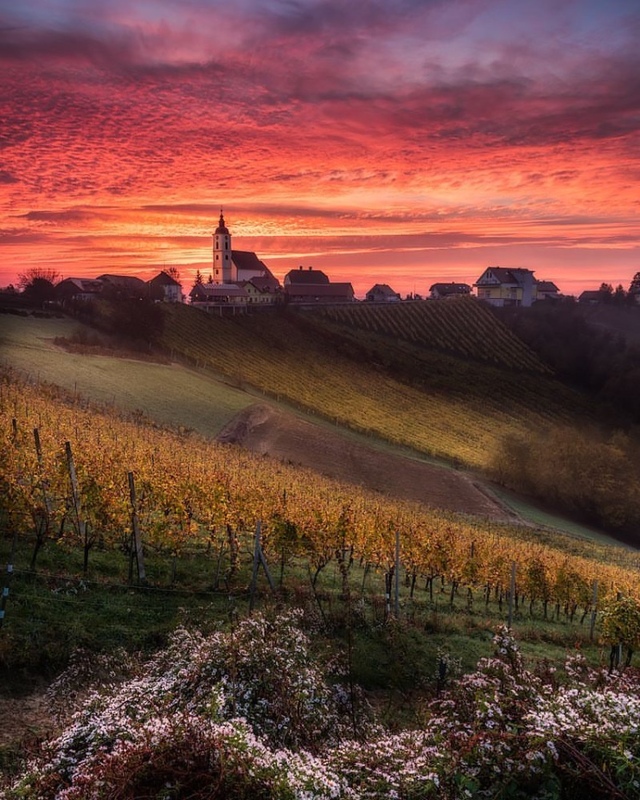 Our @igslovenia community still growing and engaging is what gives us a satisfaction and pays for hundreds of hours spent to bring you the best photos from as various locations of Slovenia as possible. 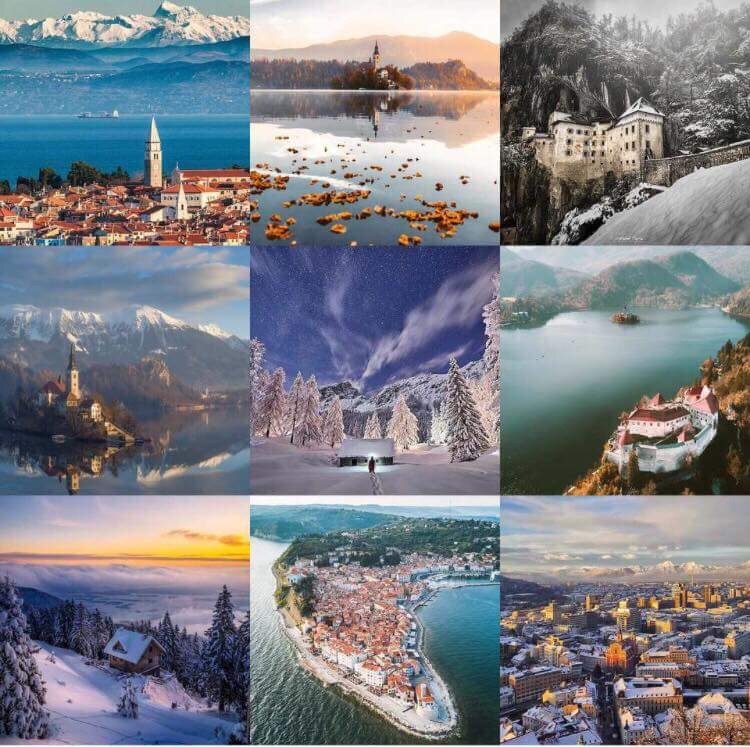 So, The Best Of … Lets’s start with the best nine photos by number of likes. What comes as a small surprise is that all nine are from different artists given the fact that more than 50 photographers were featured more than once in 2017 and fifteen of them were featured five or more times. So here we go, from left to right and top to the bottom (all Instagram handles and links, more or less all of them also have a Facebook account which you can find): Jošt Gantar @jostgantar, Emmet Sparling @emmet_sparling, Andrea Papazzoni @andrewpapa, Luka Esenko @lukaesenko, Iztok Medja @iztok_medja, @roamaroo, Stephen Barna @barnadrift, Jani Peljhan @janipeljhan, Dragan Gavranović @photocorax. Our selection of the year is in fact not a selection at all since we just counted the number of features by the artists. On the other hand this number of course reflects our selection through the year. We are trying to feature high quality photos of different locations and not to repeat a single photographer too many times. 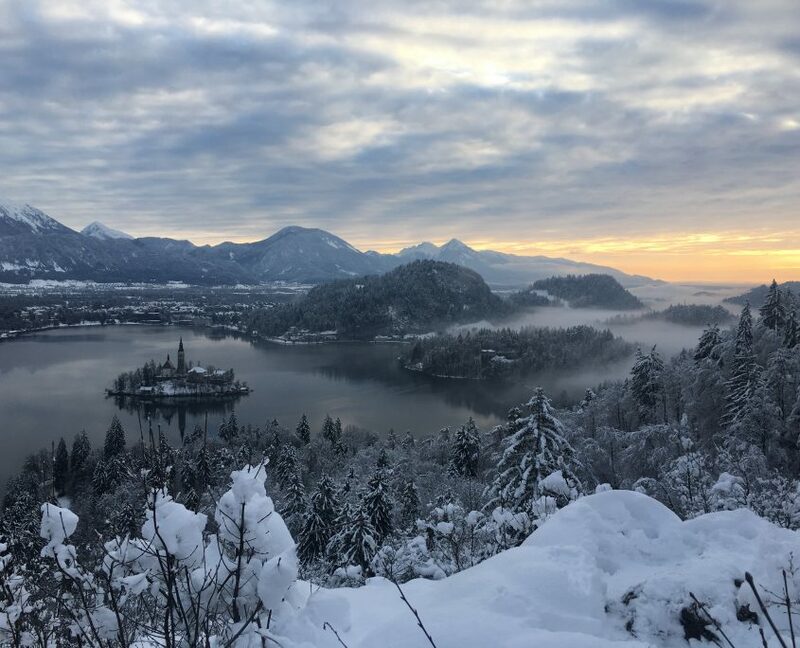 But just as it happens with photos of Bled – throughout the year we post many of them and some photographers get more features than others simply because they are highly active and post different locations of superior quality. There are 16 of them who got at least 5 features, 8 of them more than five. Please note that photos used here are screenshots from Instagram only and that they not necessary corresponds to the actual featured photos on our profile. Jošt Gantar @jostgantar is the artist with the most features of all. Eight photographers were featured exactly five times each. 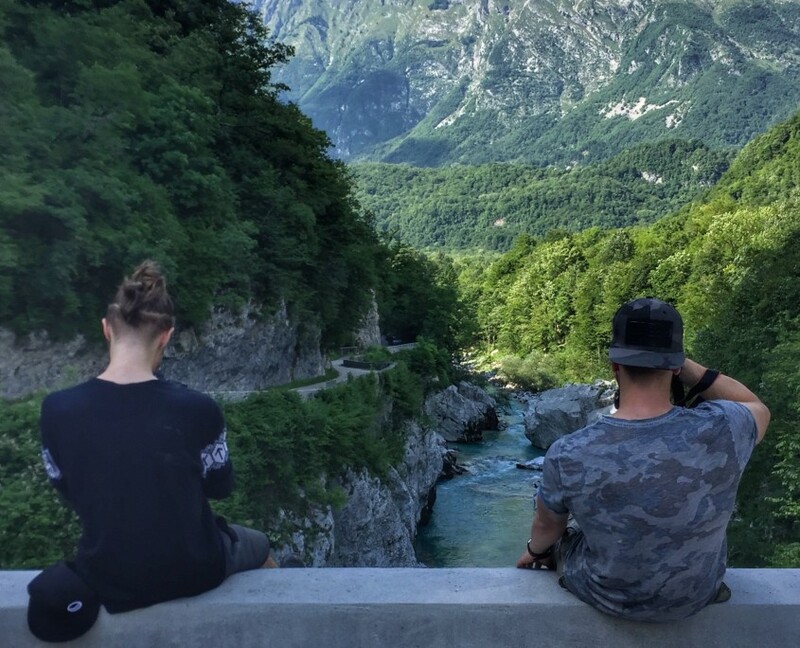 Soča Valley is one of the most beautiful and most visited parts of Slovenia, but a bit remote too – it takes two hours to get there from Ljubljana by car! 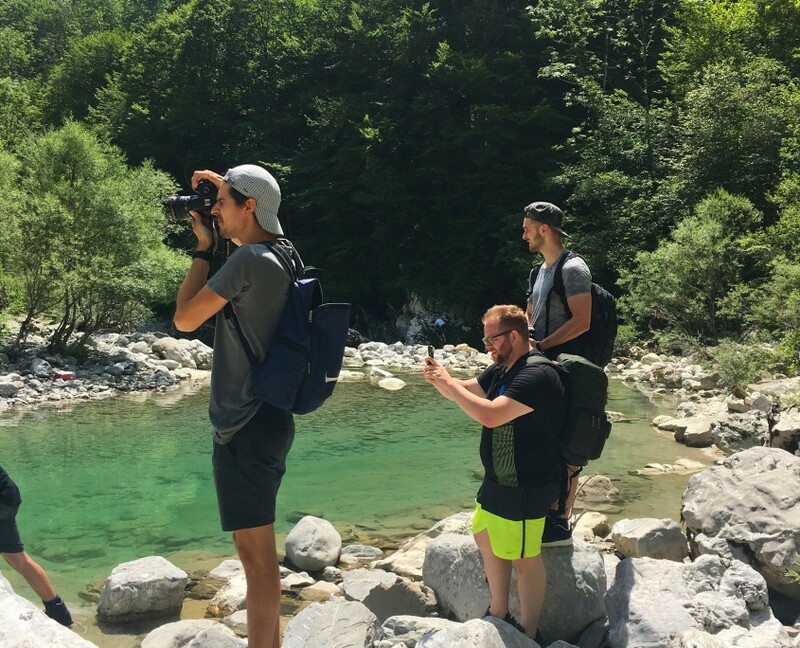 It was the sixth Instameet by Igslovenia but first one at such a remote location so it took us a while to finally decide to do it. 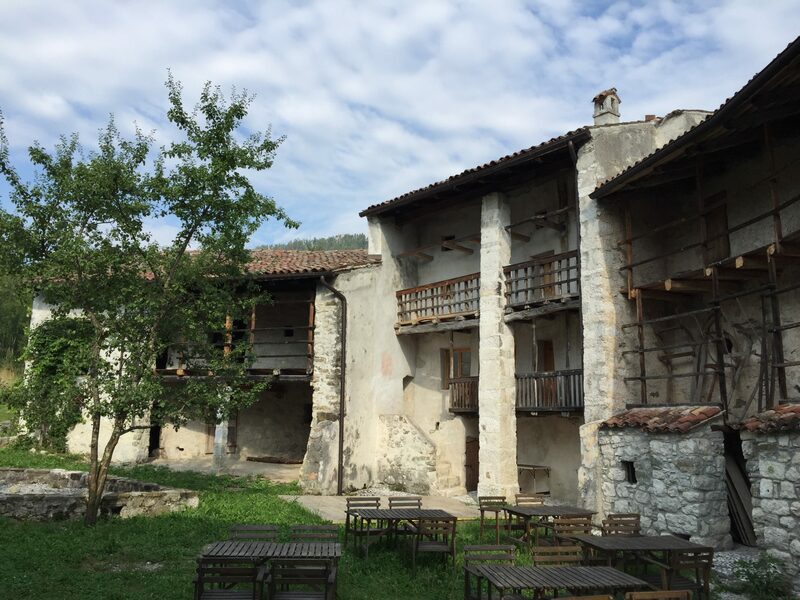 We have partnered with Dolina Soče tourist organisation and it’s representative and @socavalley administrator, Tatjana, has greeted us on Saturday morning in the charming small city of Kobarid. 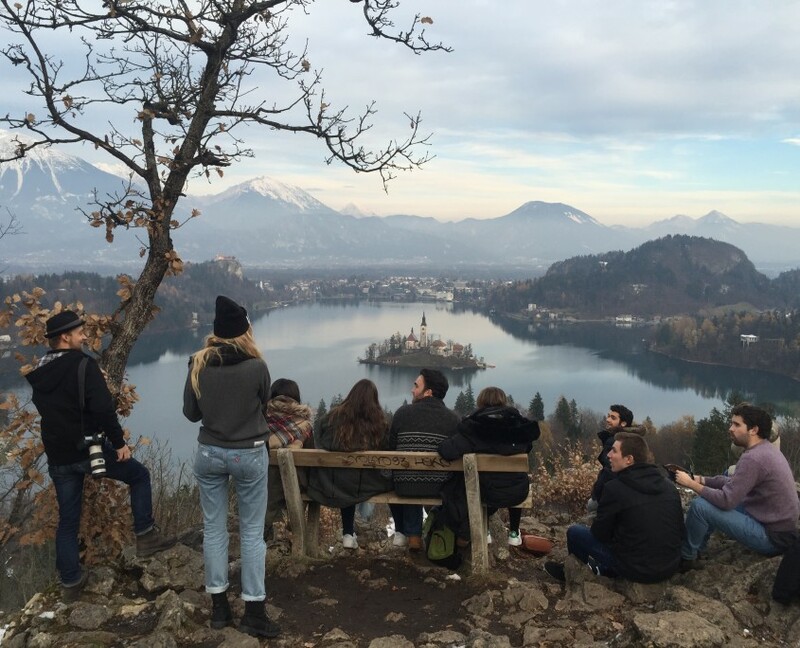 It was the first time that Sanja and me didn’t meet any of the participants before and they didn’t know each other so we were breaking the ice with coffee while waiting to enter the small bus, courtesy of Dolina Soče. It didn’t take long since the light is important for photographers and we were all there just for that – to take some photos together. 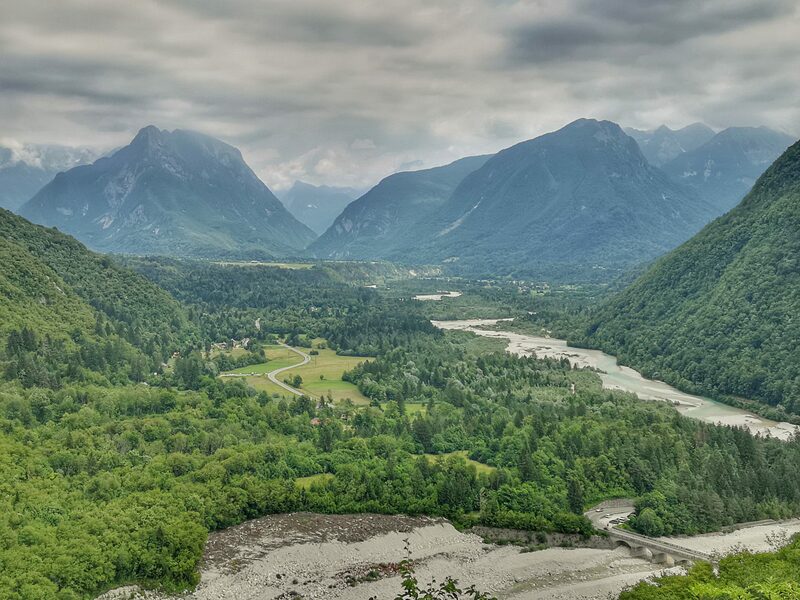 Soča Valley is very beautiful, long and popular. 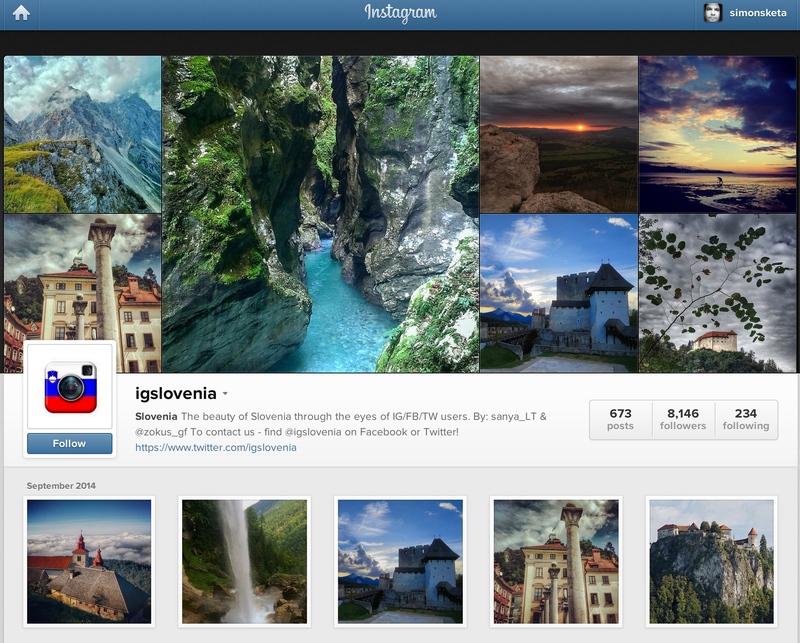 Success of the photos with Soča River can be compared to those with Bled Island, at least on our Instagram account. 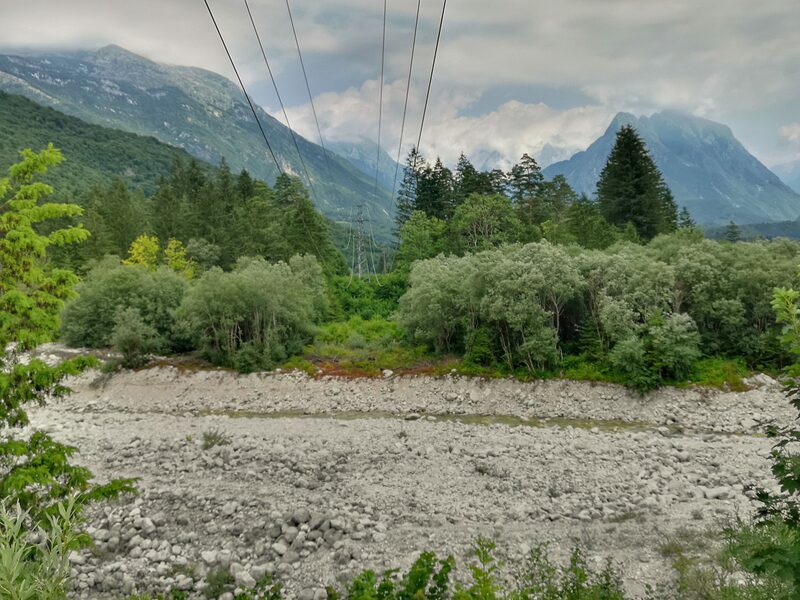 These photos are usually taken from 4 – 5 different locations between Kobarid and the end of Trenta Valley (where is the source of Soča River). 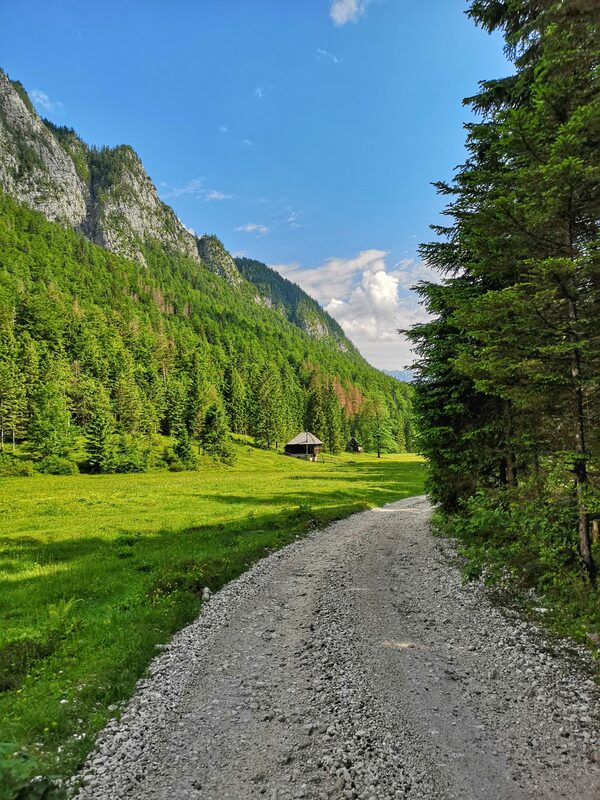 But the valley has so much more to offer and we are never satisfied with the obvious so we decided to start with some parts of the valley which are not so well known. 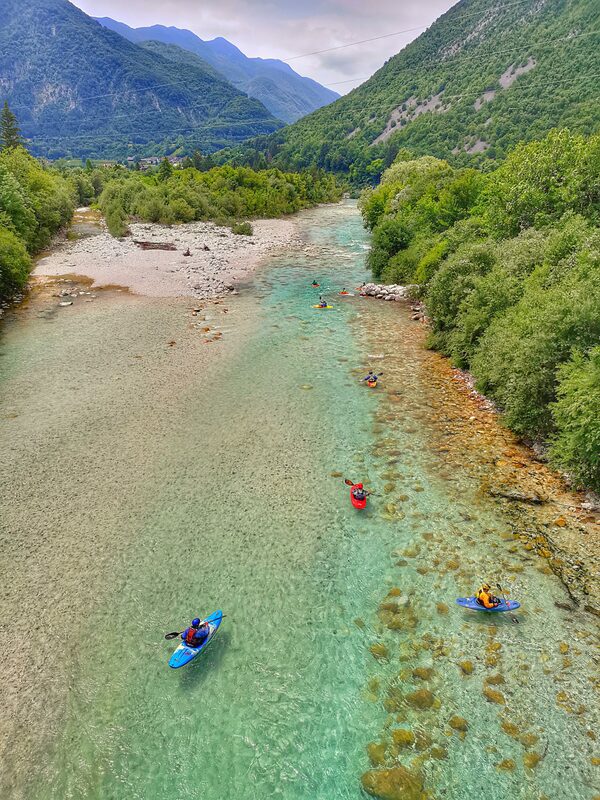 Nadiža River is technically not a part of the valley – it’s turqoise waters, torrential during the frequent storms, originate under the massive Stol range. 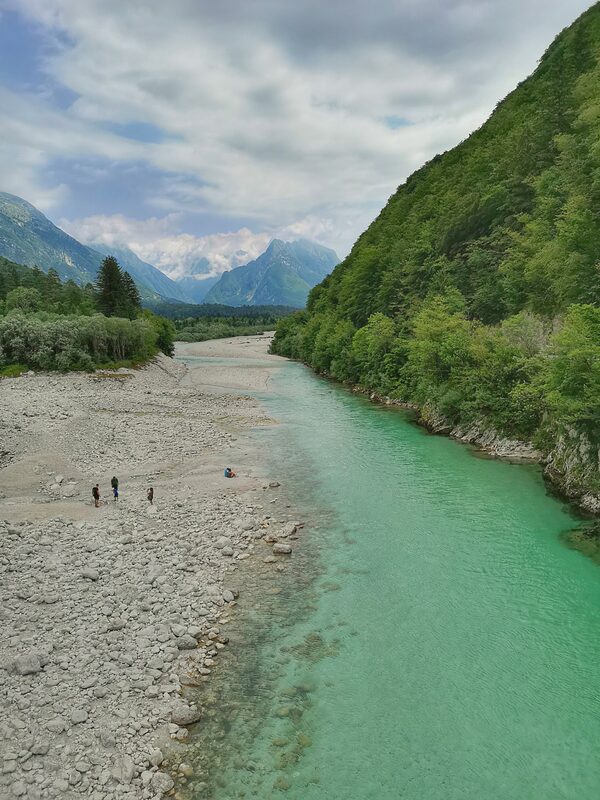 At the foot of mount Matajur it turns south, crosses the border into Italy and concludes it’s 60 kilometer journey when it joins the river Ter (Torre). 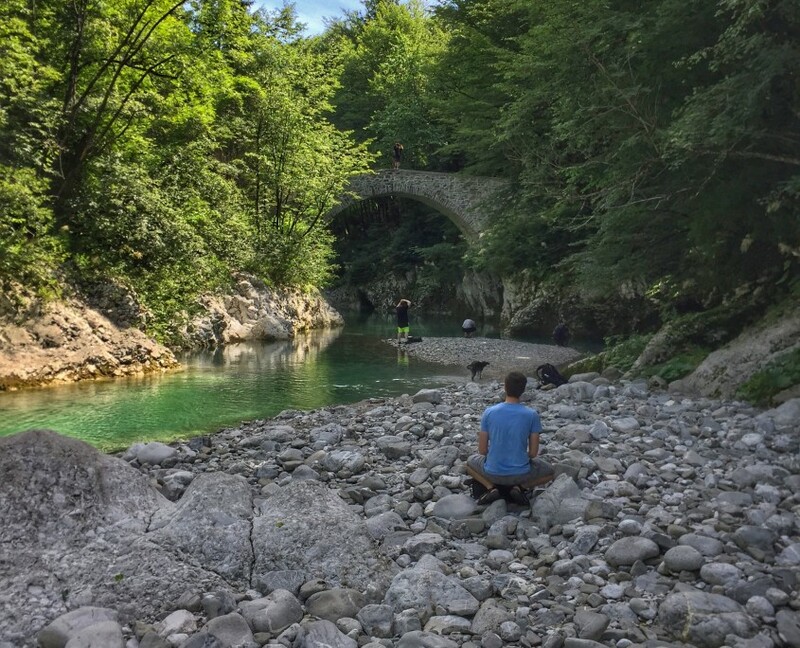 Who would care about details like this since it is only a few minutes drive from Kobarid and it is in summer populated not only by locals but by people even from Nova Gorica, almost 50 km away – still by the Soča River. 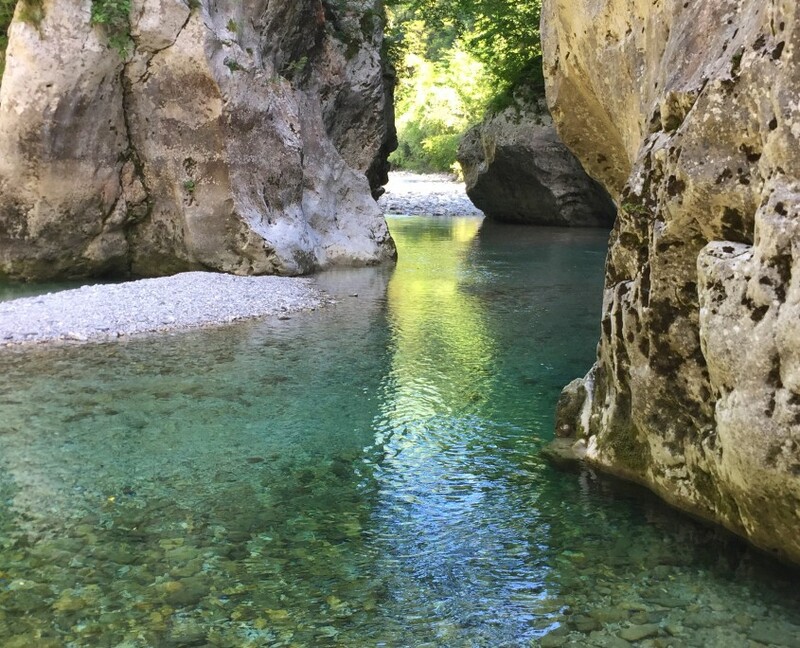 And with a reason – it is very warm and has carved out pools and gorges, as well as depositing numerous shingle beaches. 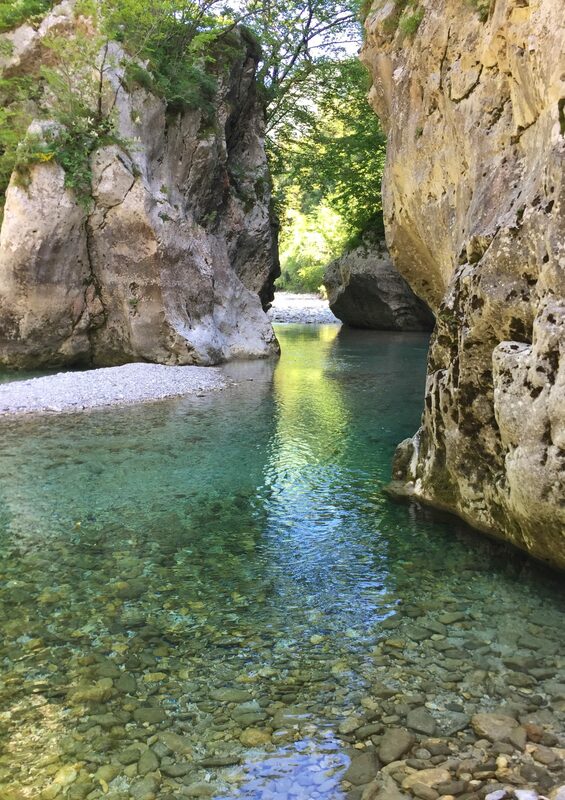 It is one of the cleanest and warmest Alpine rivers, some even say it has healing properties. 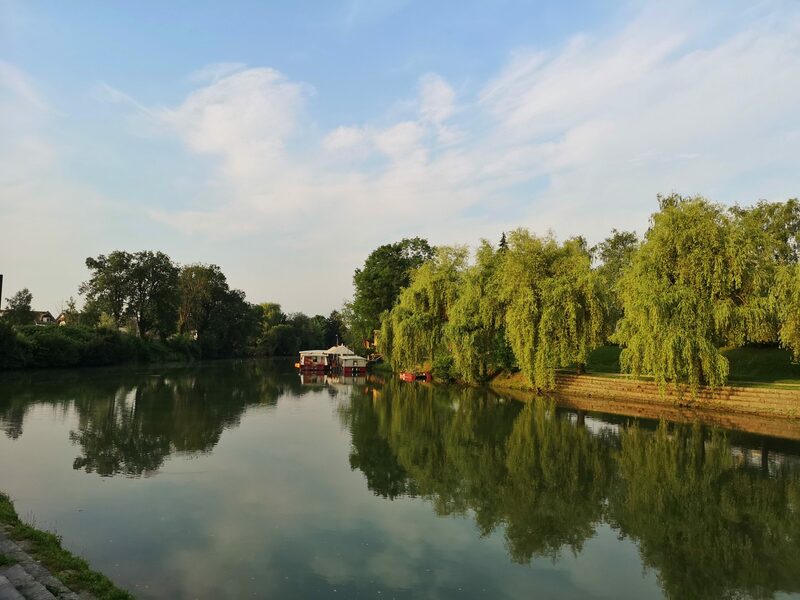 Tatjana was also part time our tour guide and she proposed to start exploring with Nadiža throughs, one of the most beautiful parts of the river and even less crowded since the access by cars is forbidden. We parked the bus in a small village Kredo to reach the river after 10 minutes walk which was not without surprises. 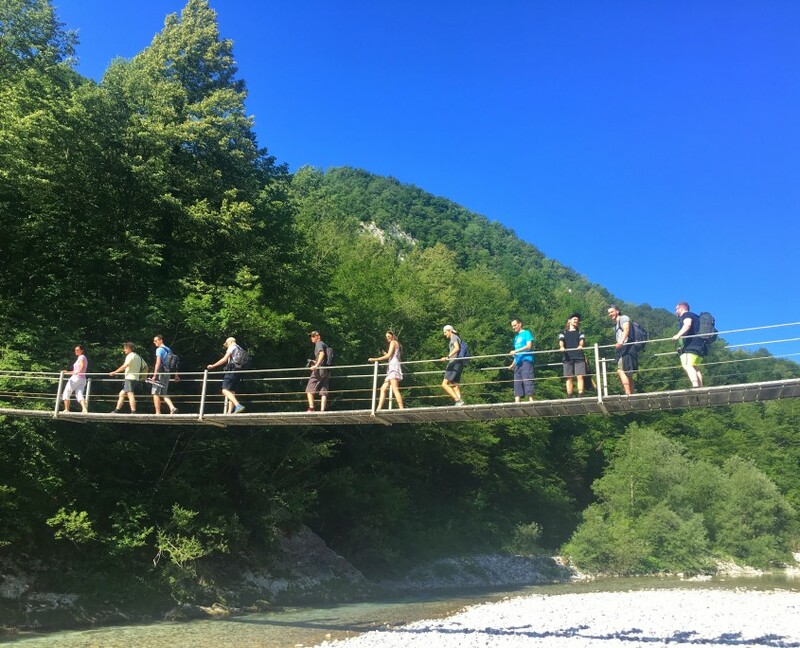 We had to cross the river with a hanging bridge and find a narrow steep path to the throughs – not without some effort but for a good reason though! The untouched wild beauty just put everybody in his own movie and the day finally really begun. More surprises on the way back to the bus – how to persuade one of the two horses to step over the wires back into its designated places. Just one hint – success is not proportional to the number of photographers who want to help:). 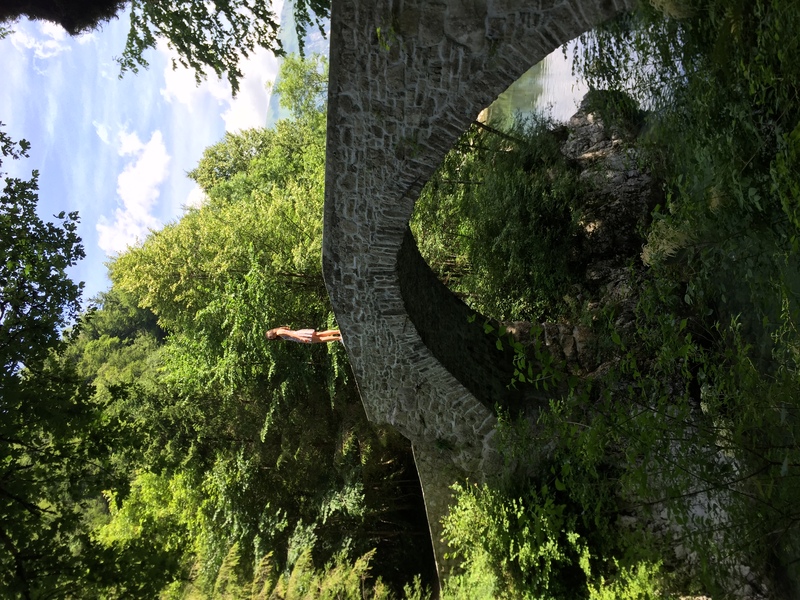 Next stop on the Nadiža River was the famous Napoleon Bridge. 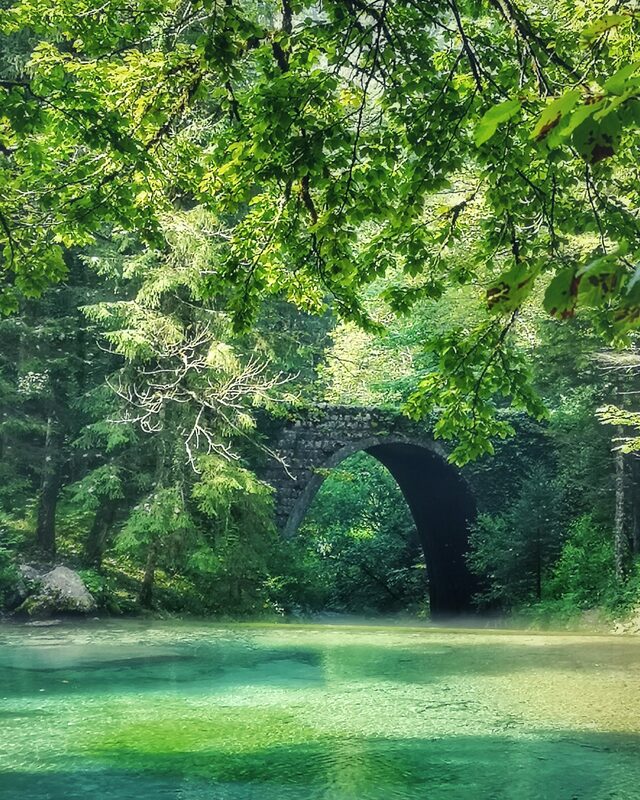 The famous stone bridge crossing the Nadiža gorge dates to around 1812 and stands mute testament to the routes crossing the area since at least the time of Ancient Rome. 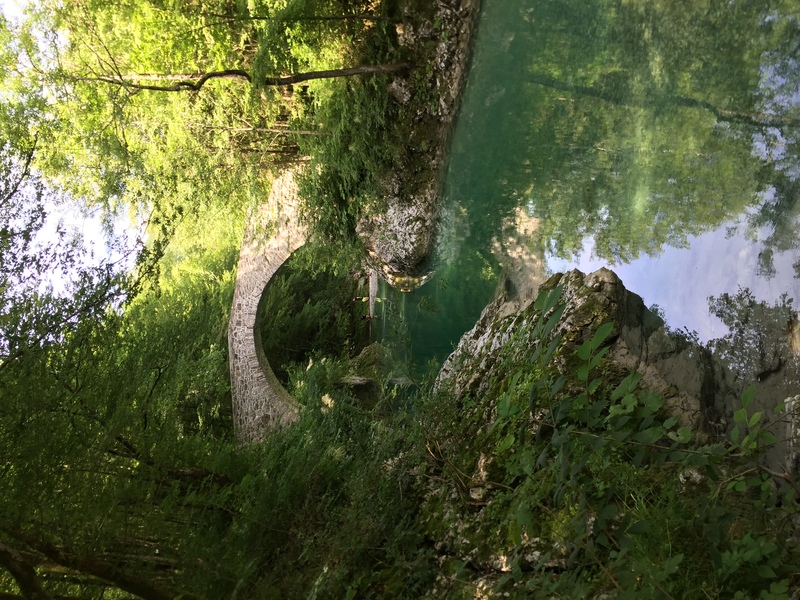 The bridge used to form part of the ancient route from Pradol and Robidišče along the Nadiža riverand further to the east. Current bridge was built at the time of the French emperor’s conquests, hence its name. Its uniqueness and technical accomplishment make it a precious architectural monument and a memorial to times past. 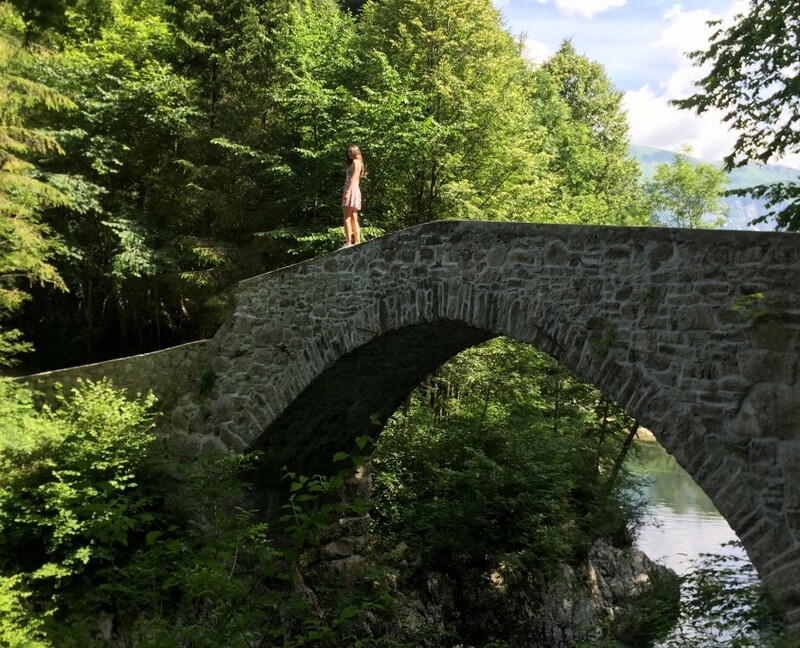 The bridge is just a few steps from the road so we were all immediately in full action – searching for different views, angles and approaches. We were never short of voluntary models. 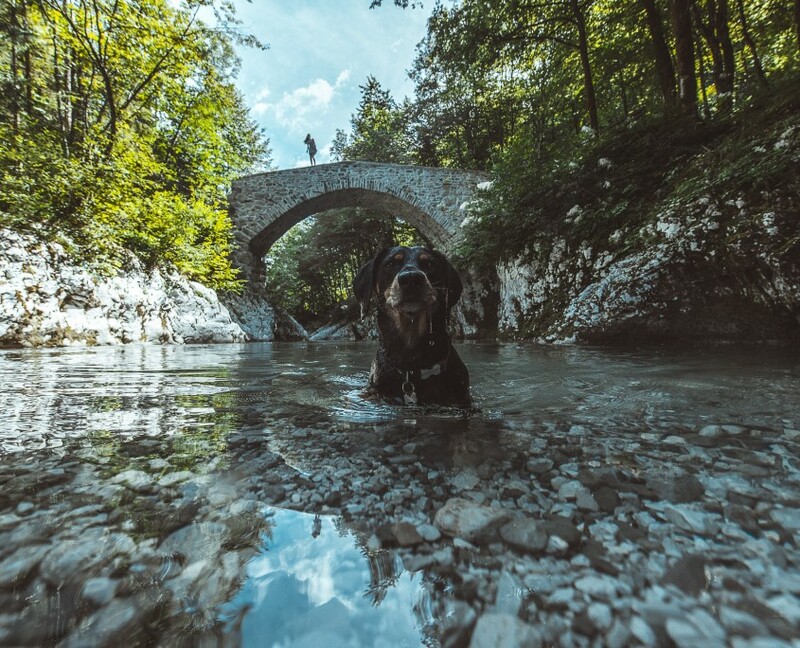 There is a great photo of our dog, Tara, also in @sebo262‘s feed! 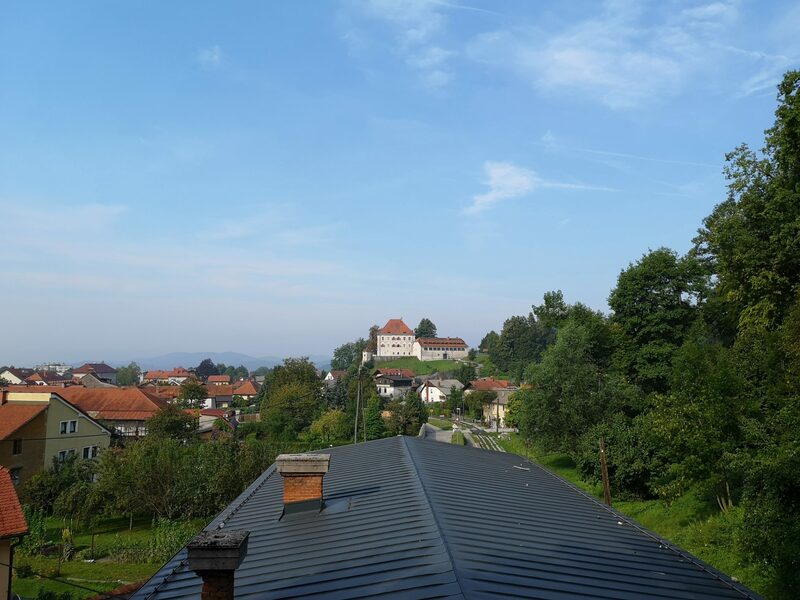 Our next destination was Robidišče: The village of Robidišče lies on the western edge of Slovenia. From the north, west and south it is enclosed by the state border. 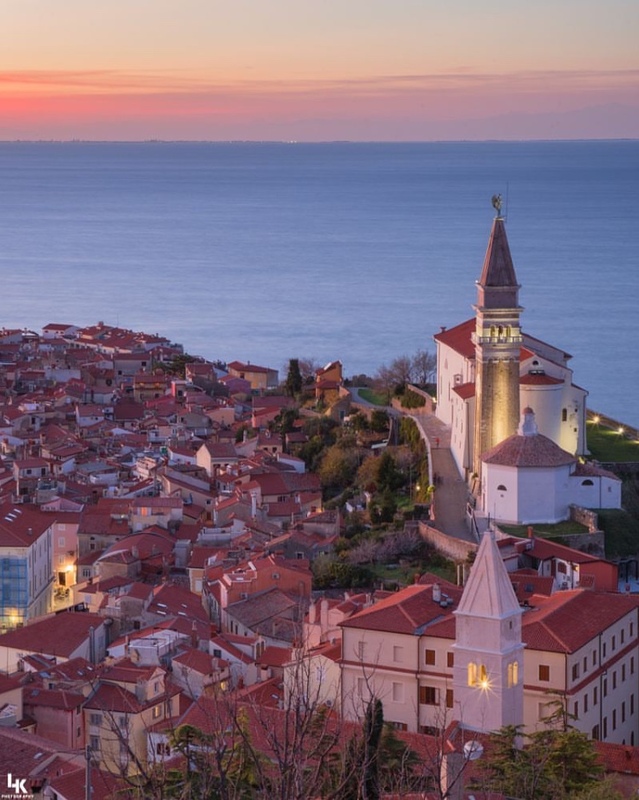 Across the border lies the Venetian Slovenia to which the village always gravitated. The old village is itself a living monument of times past. 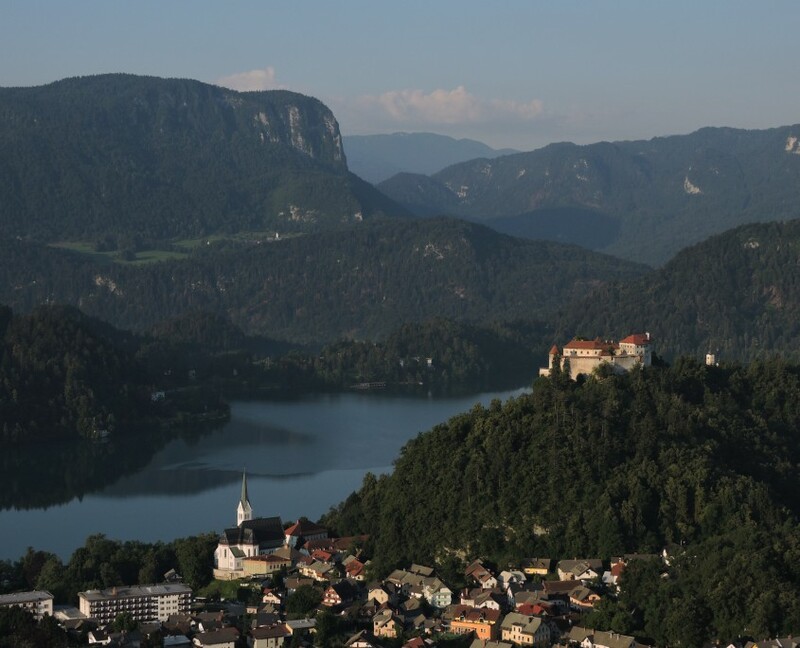 After WW2 in 1947 Robidišče was cut off from Venetian Slovenia by the Iron curtain. Because of this more than 150 locals packed their belongings onto wagons, crossed the border into Italy and never returned. The village was drastically changed in 1976 when an earthquake with magnitude 8 on Richter scale shook the village. 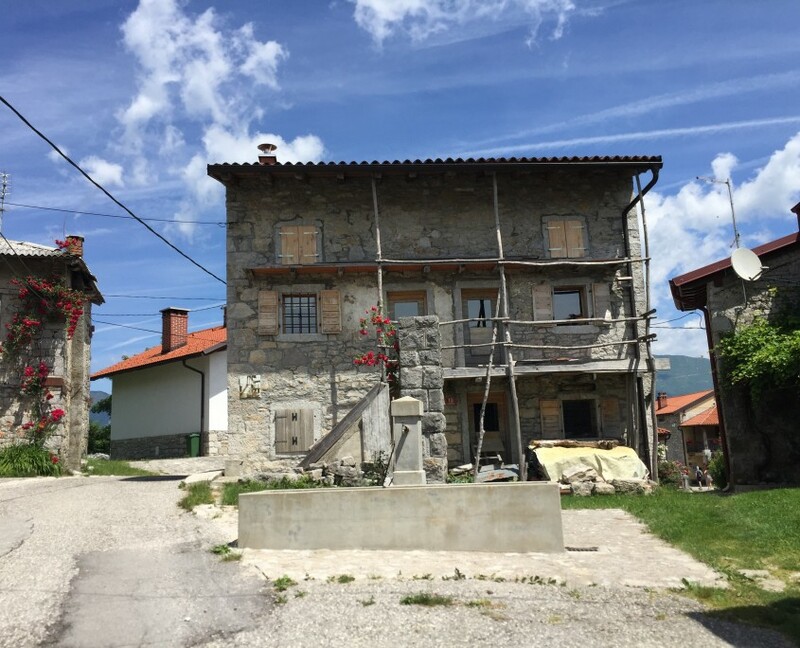 The reconstruction of the village was never completed and the village decreased. In 1869 the village had 178 inhabitants and in 1910 the number rose to 228. 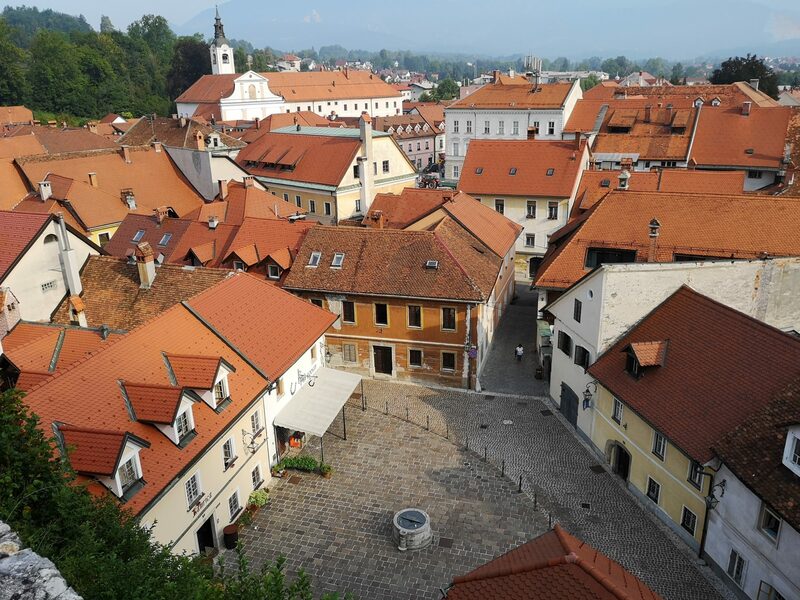 In 1991 there were only 17 people living in Robidišče and the number fell to 8 in 2000. 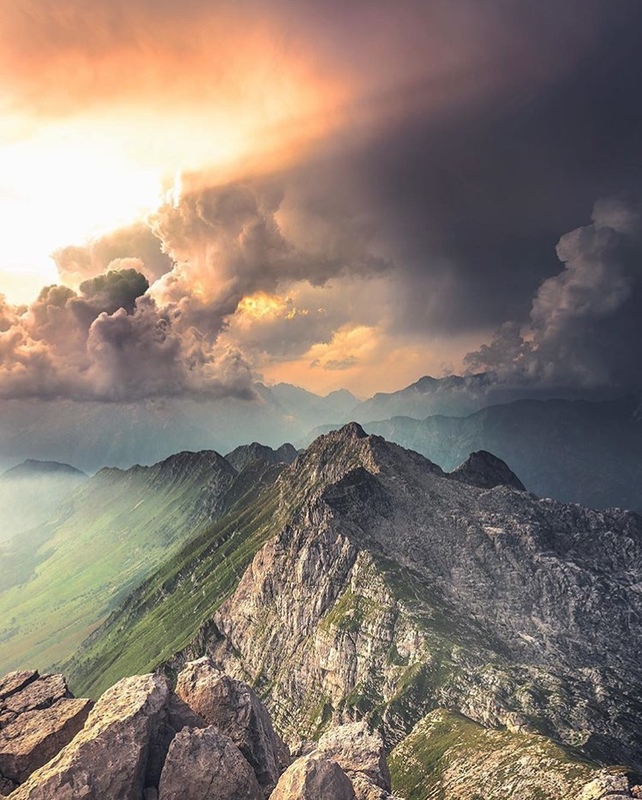 There is a magnificent view on Mt. 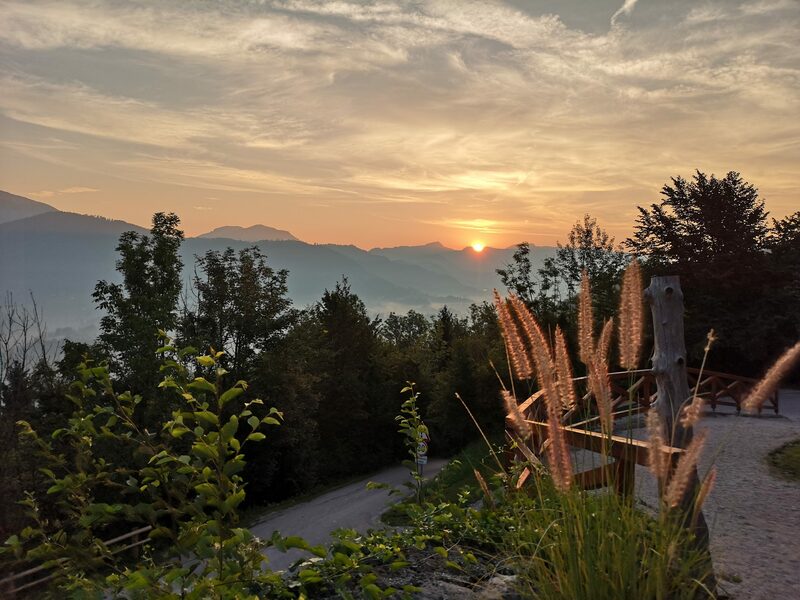 Stol just beside the village but the sun was already pretty high and the skies clear – sunrise or sunset are definitely worth trying. It was a hot day and after two working stops a short break with courtesy refreshments at Turistična kmetija Robidišče made no harm to anybody. The all local food was great too but we had to leave. Hop-on, Hop-off bus was waiting on us. 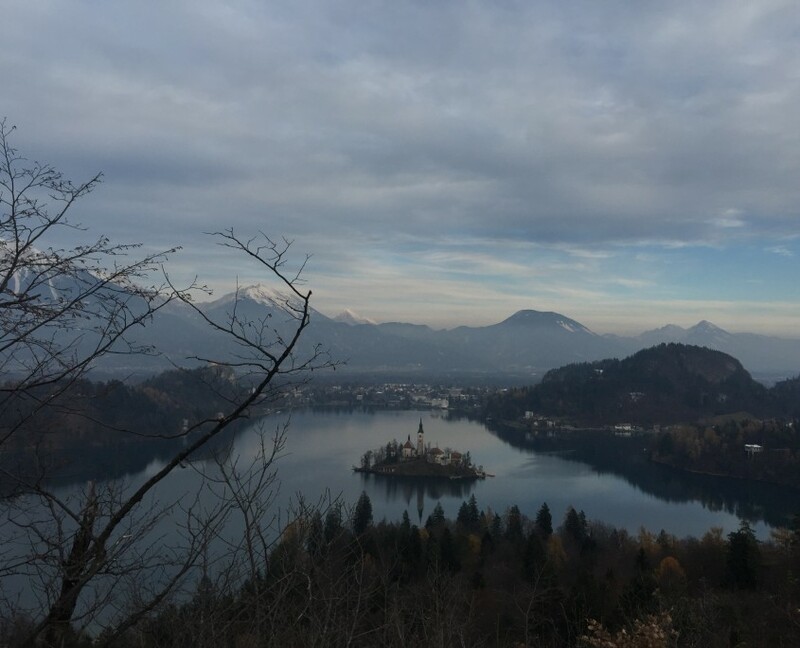 It was his first day on duty in the season or better to say, a pre-day of duty since it served only our group – otherwise it is a seasonal service which a few times a day drives to some more remote tourist destinations like Robidišče. Visitors thus don’t need to drive their cars or rent them and are also start their cycling or hiking tours at the optimal starting points etc.. Unfortunately rebuilding the village was focused only to give the people shelter and no historical elements were taken into account. Bot location itself is a very charming one and there are some views on the village, the mountains and the church above the village we wanted to explore. A short examination from the best photo spot above the village cut down our expectations – it was middle of the day and clear skies, the light not appropriate for taking photos there so we decided to leave it for some other time. Photos above are from our previous visit. 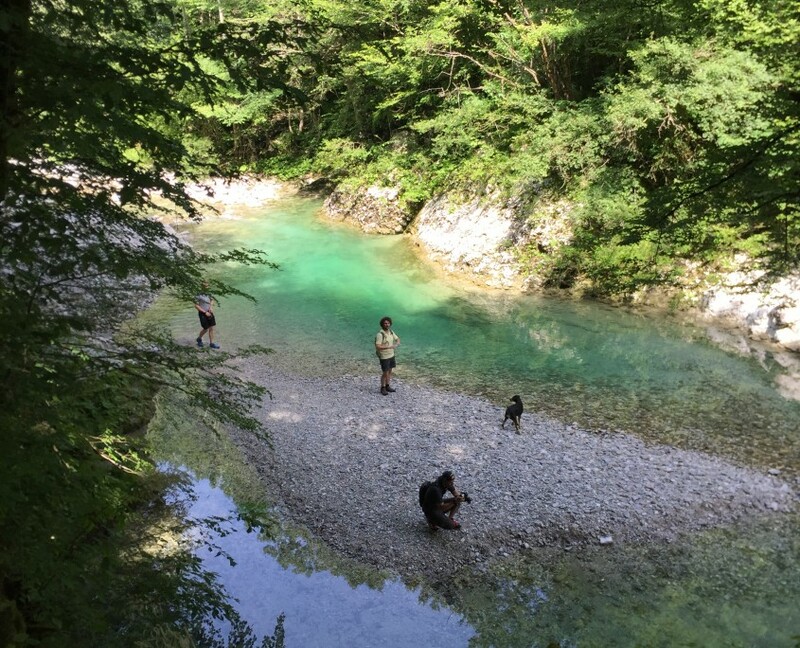 The Kozjak brook, feeding the Soča river from the east (on the left), springs high beneath Mt. 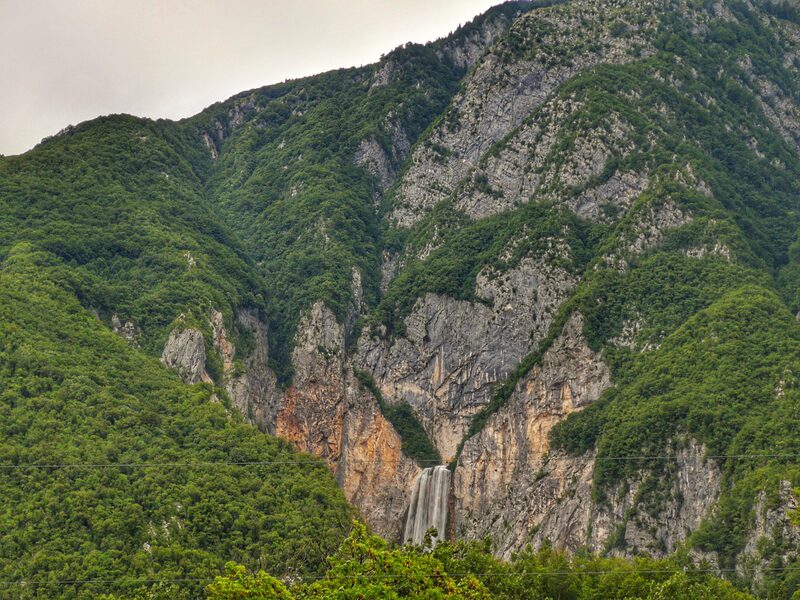 Krnčica (2142 m), and runs through many pools making six waterfalls. 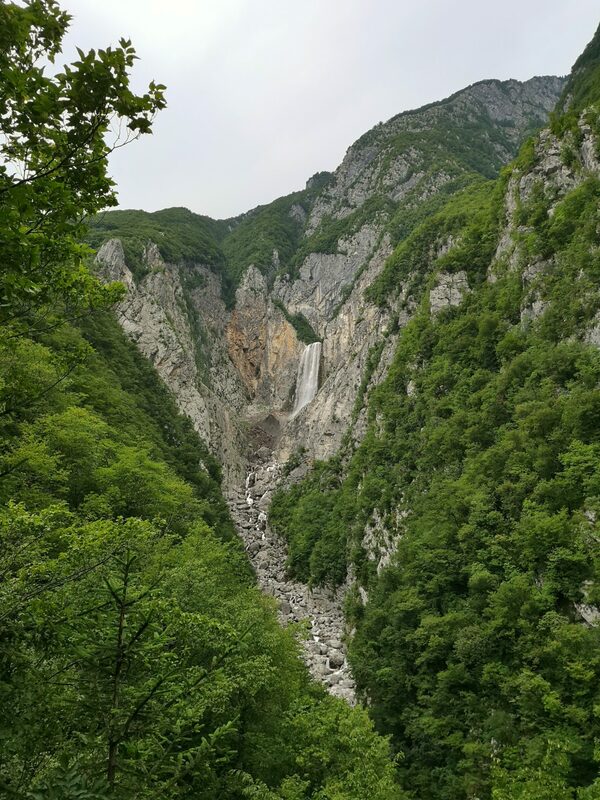 One of Slovenia’s most picturesque waterfalls, the Veliki Kozjak, was created in the outlet of the lower Korita of the Kozjak Brook. 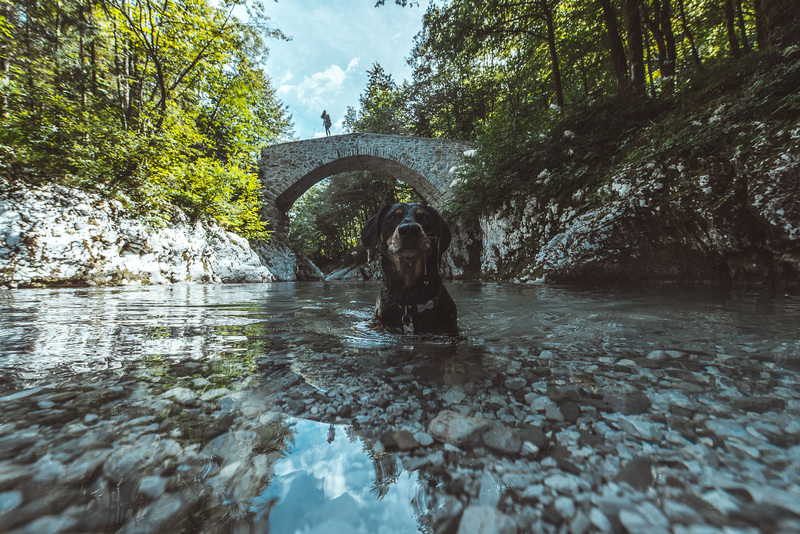 Activity on the photo is illegal though:) You can check out a bit more classical take at the waterfall on @lukakotnikphoto‘s, @alanjereb‘s and @dejskovski‘s feed. It was time for beer, some great pancakes (salty editions) in the camp near the river and slowly saying “goodbye, nice meeting you”. Phones were also ready for first posts:) Also girls from @igposocje took break in their studying for exams to greet us on their home territory. 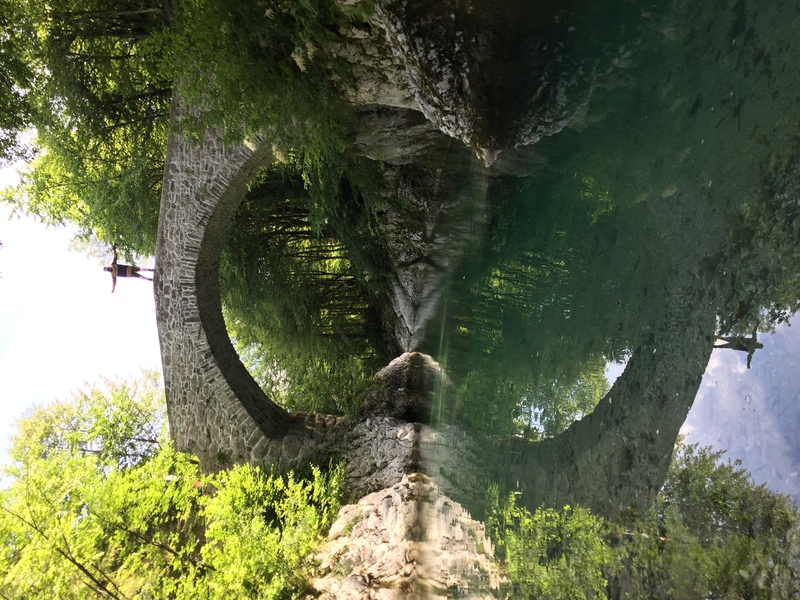 On the way back to Kobarid some of us stopped at another classic spot to photographing Soča River, another bridge called Napoleon’s:). 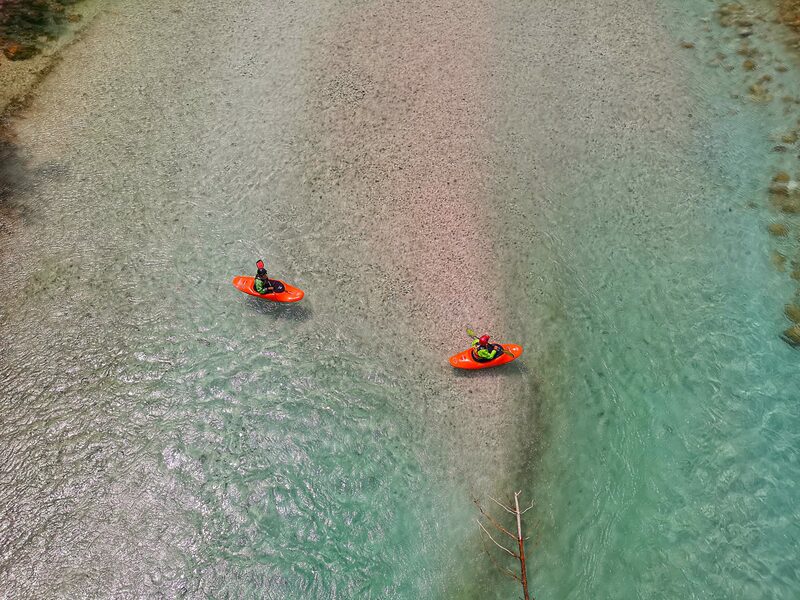 @dani.kla got his classic shot with kayaks there (check out in his feed) and I got @ingmarwein and @feinerkerl in action. 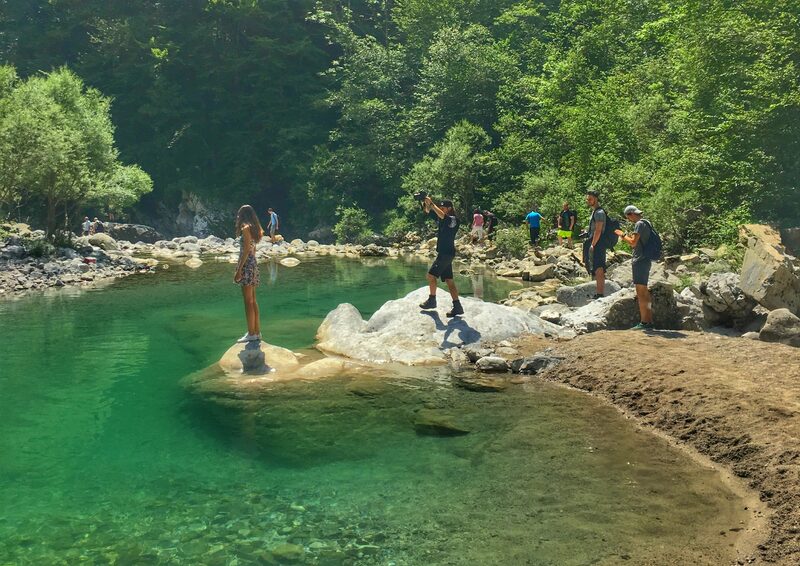 Some of us stayed for the rest of the day or even weekend, some headed for other great photo spots in the area. 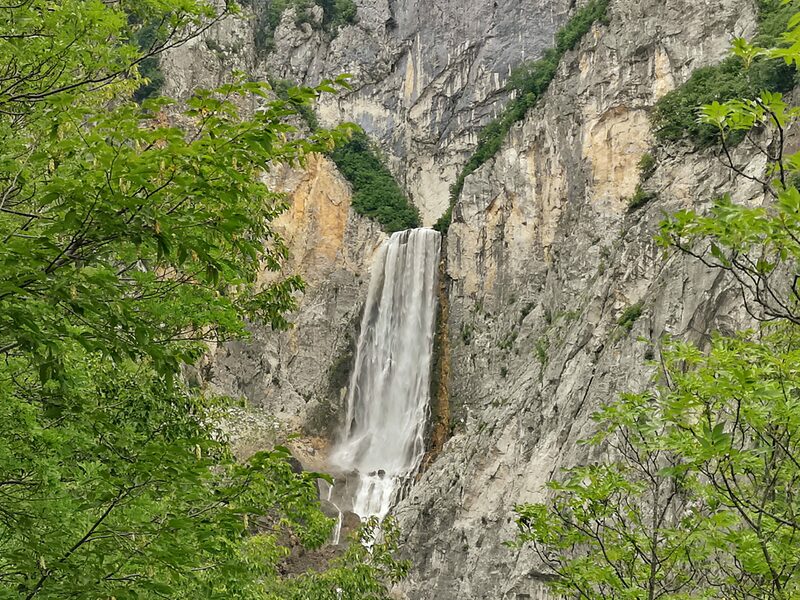 A week would probably be enough to cover only the best spots of the valley, not even trying to hike the less accessible waterfalls, villages, pastures and peaks. We had a great day, made great photos and most important – some new friends! 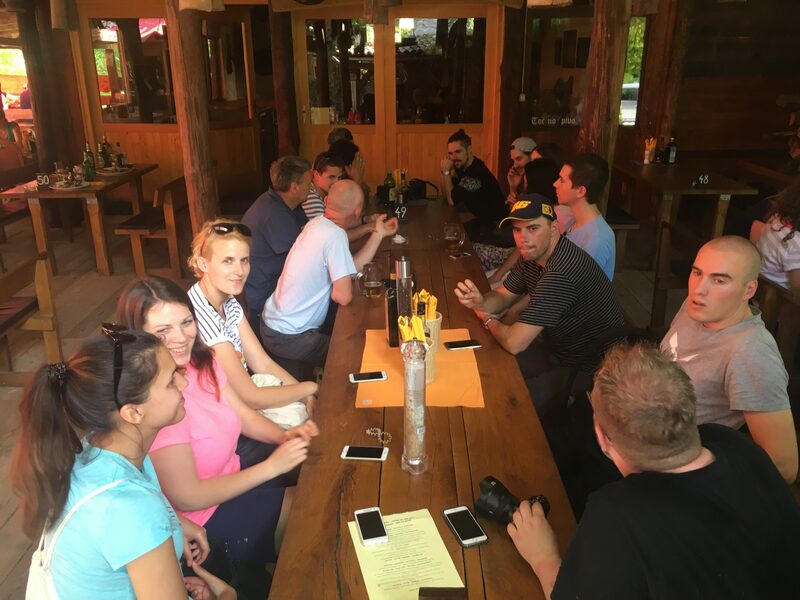 We thank everybody for joining us and especially Dolina Soče for hospitality! More photos from the event: #instameetsoca and feeds of the participants. 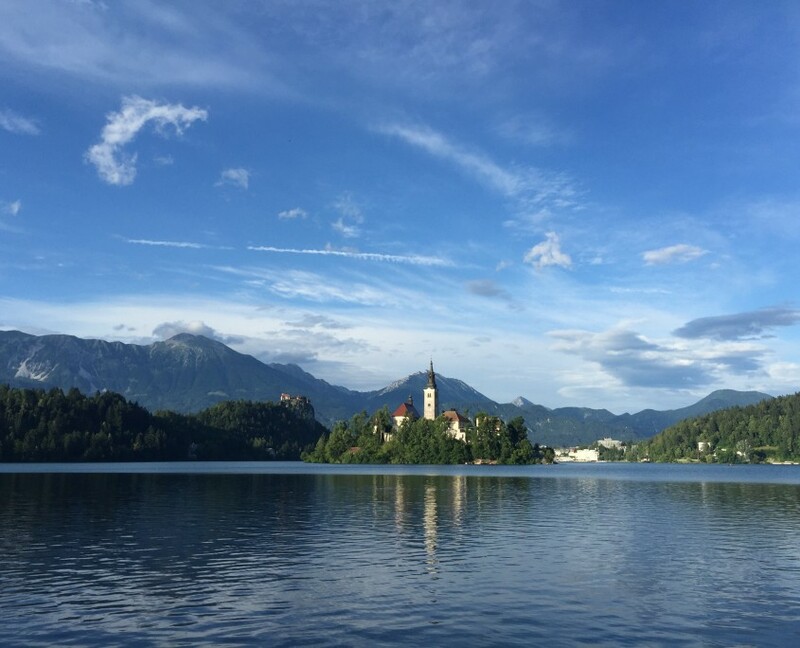 More detailed descriptions of some destinations are available in Where to in Slovenia section and we will be adding more of them. Photos @zokus_gf , @sanya_lt and @ingmarwein.